Recipes Viewing archives for "Recipes"
This is one of my new favorite ways to enjoy the flavors of kimchi. 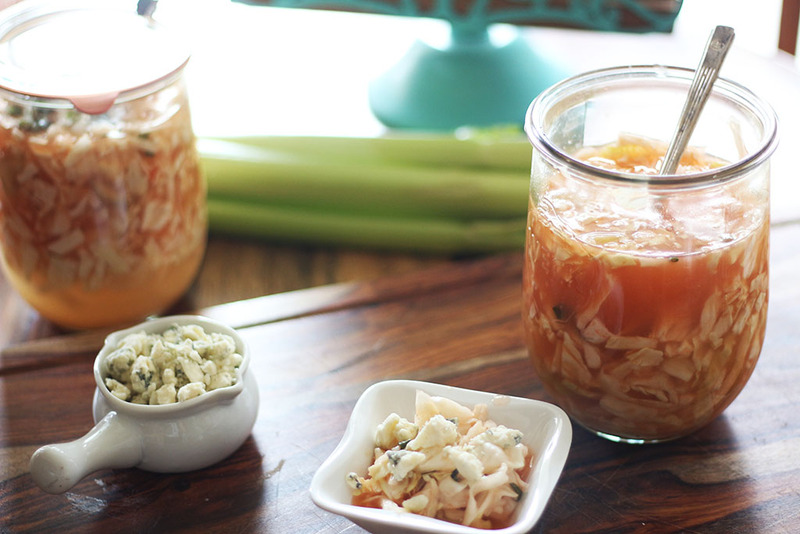 Although technically it's not kimchi since no cabbage is used, it still has that spicy kick that so many people love. You can always use less Korean chili paste if you don't like it that spicy. Adjust it however you like but give it a try. 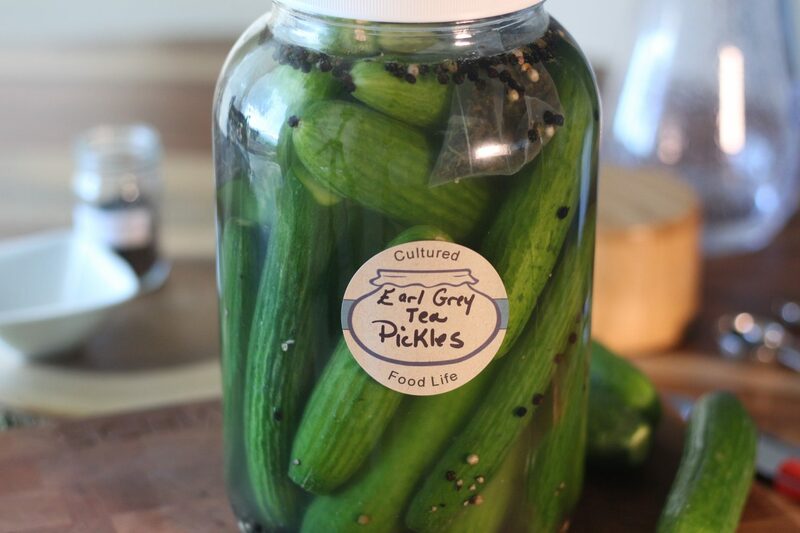 It is super easy and I think you'll love the flavor of these cucumbers/pickles! 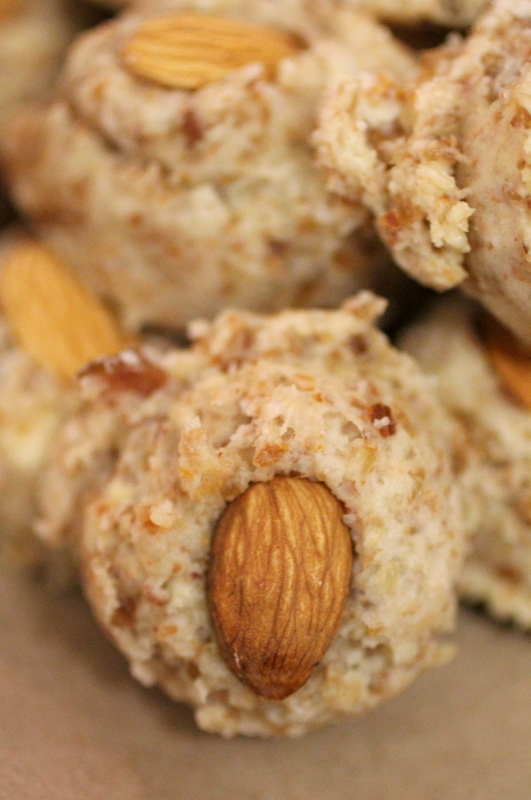 I can hardly wait for you to try these kefir donut holes. 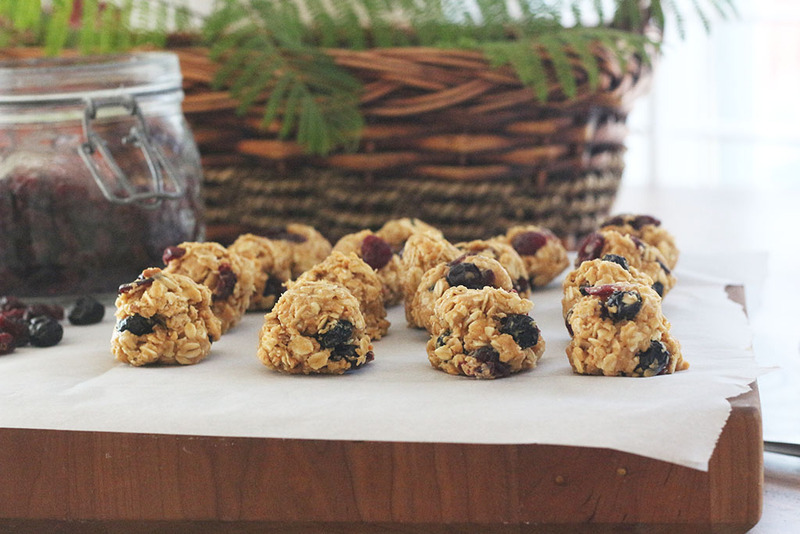 I love to make these and just keep a bunch in my freezer for when I need a quick snack. But I also make sure to keep all the ingredients on hand to make more—just in case my family has eaten them all up. 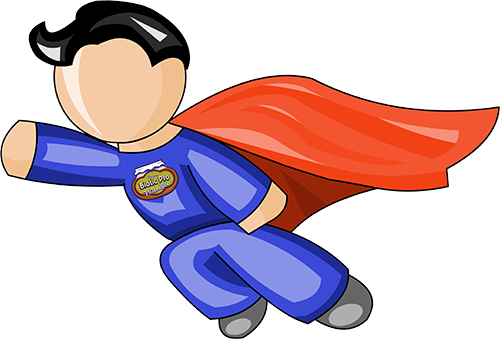 I suggest you do the same because everybody needs a little pickup now and again. I promise that you will love these. I have several orange trees at my house so we have a lot of oranges. 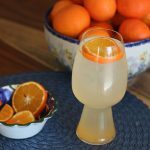 I’ve found dozens of ways to use oranges and really discovered how much they help me on a daily basis. 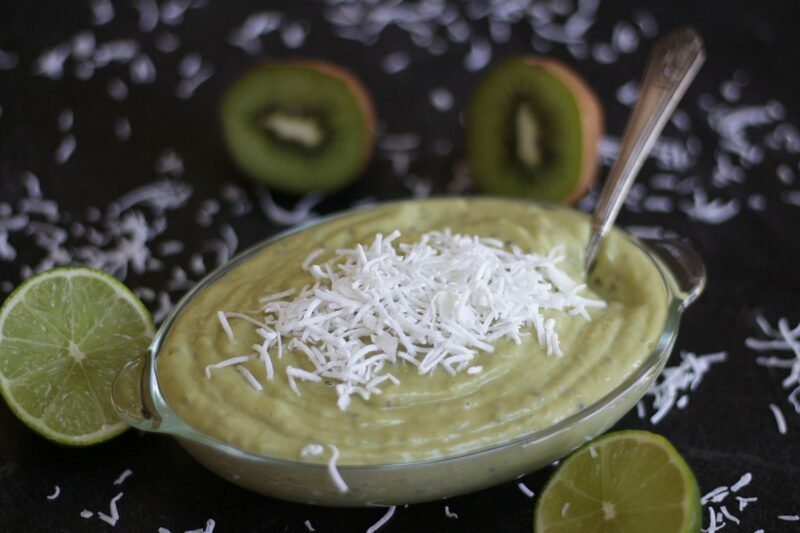 Loaded with vitamin C and other nutrients they can strengthen my immune system and ward off allergies and are a fantastic way to detox the body. 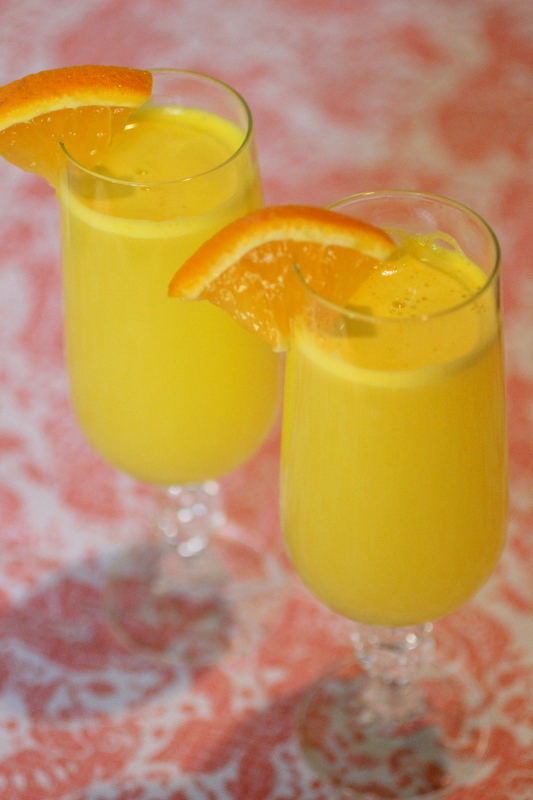 You need lots of vitamin C throughout the day, if your dealing with any kind of stress. 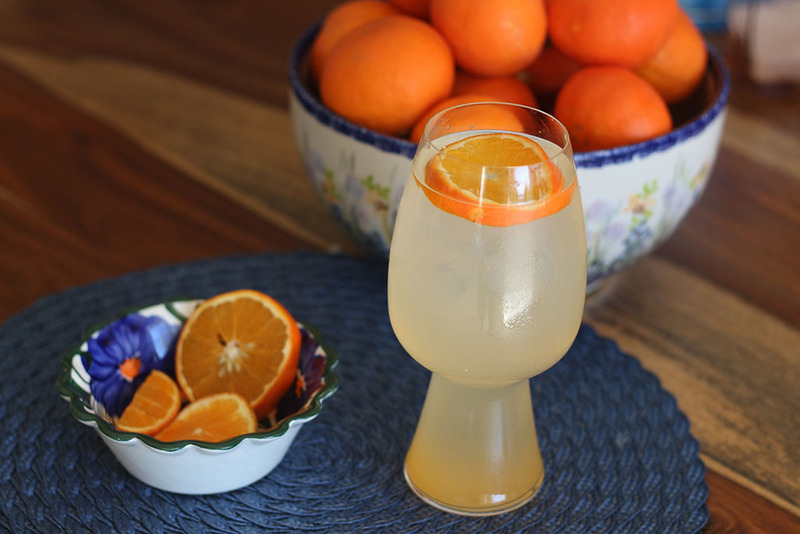 Oranges and this drink can be the perfect way to get your daily dose! 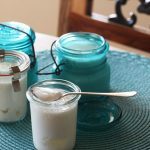 This is a fun and easy way to make lots of little jars of kefir that are ready to serve and handy to take with you on the go. 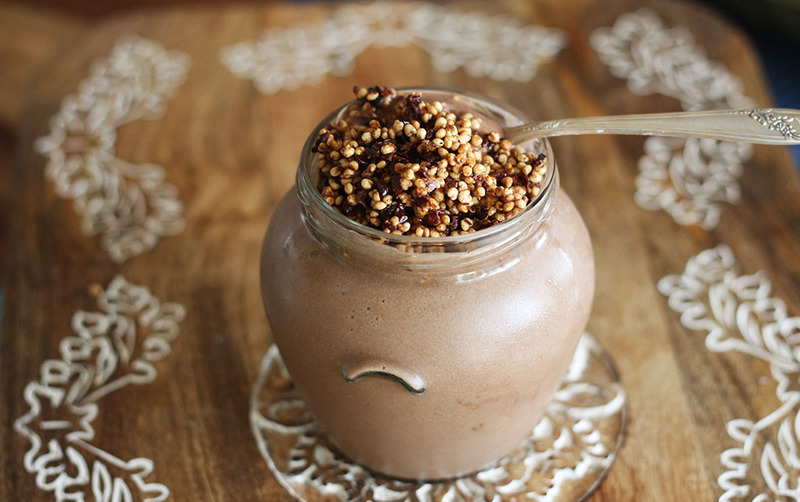 You can even use chocolate milk to make Easy Kefir and kids love this! 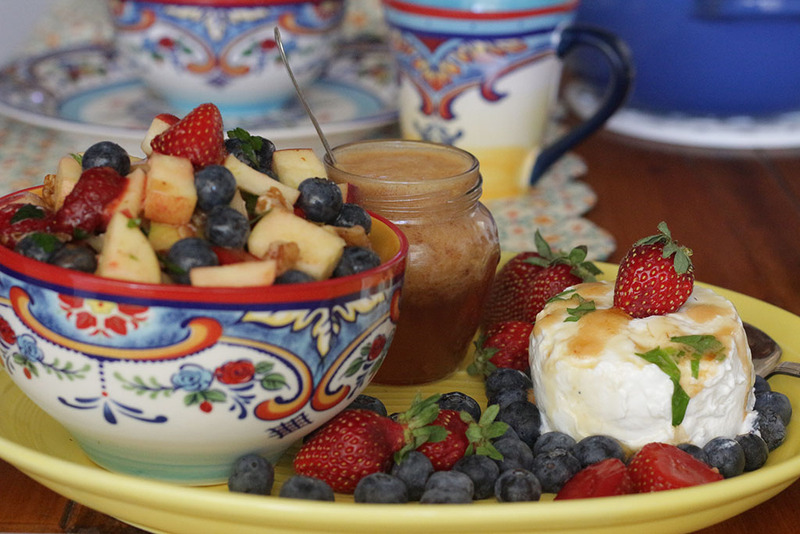 I like to top these pots with fruit and granola or just a spoonful of jam for a fast and easy breakfast. 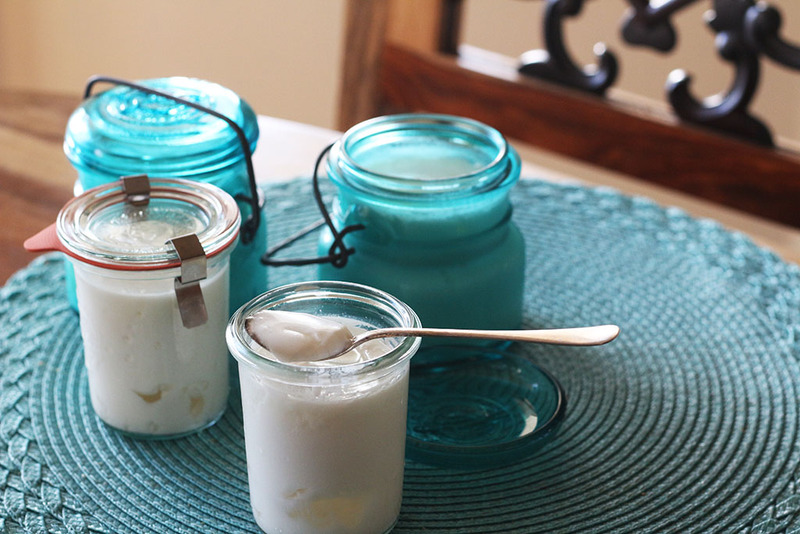 You can make any size jar, just keep the ratio of 1 tablespoon of Easy Kefir to 1 cup of milk. Double and triple the amounts if you want to make a bigger jar. 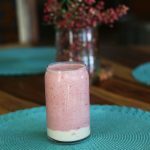 It's super easy and you get all the benefits of kefir without having to strain out the kefir grains. 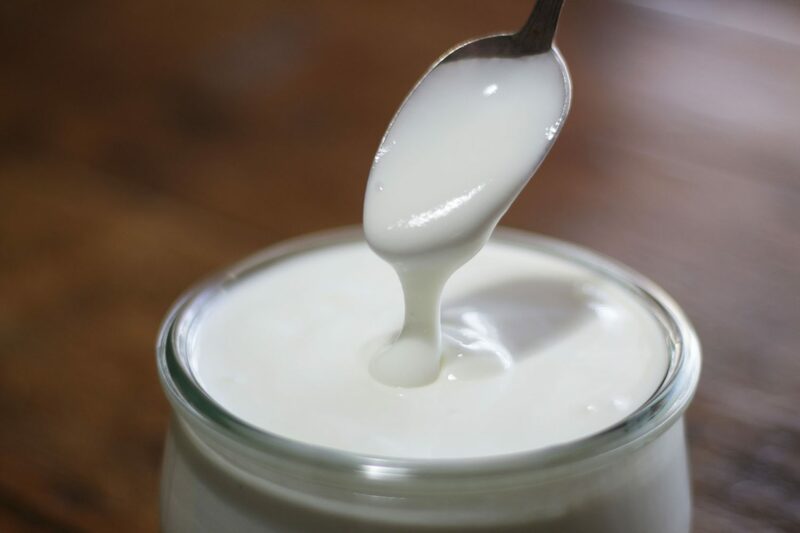 This makes for a thicker curd kefir that is a lot like yogurt only super easy to make with over 50 bacteria! 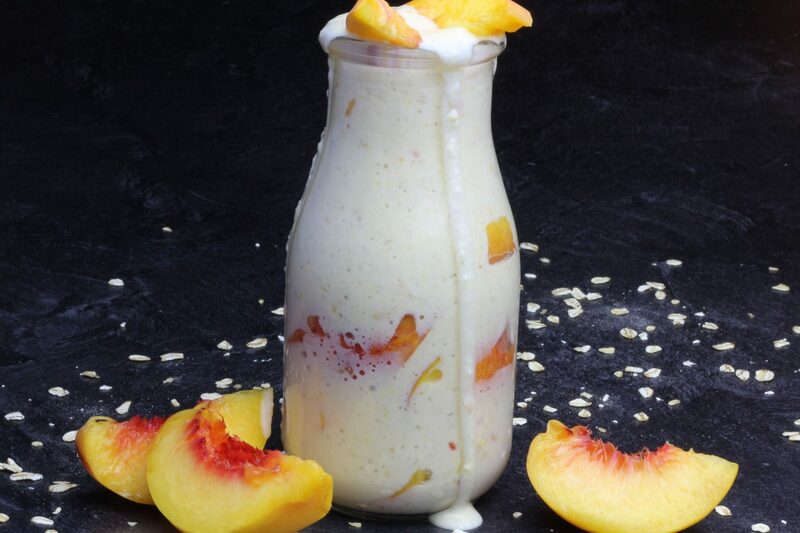 As I opened the blender the smell of peaches, kefir, and vanilla hit me, and the memories flooded back. 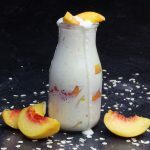 I felt my heart open and heard a voice in my head, “Do you remember the first time you made a peach and kefir smoothie? Do you remember how scared and sick you were? 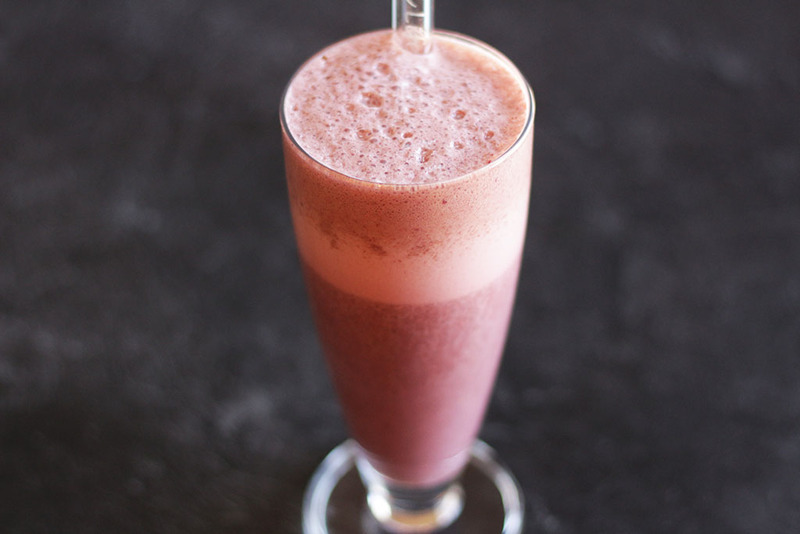 Do you remember how you used to eat and how much that has changed?” It’s true—everything is different now and each time I have this smoothie, the smell reminds me of that. I feel grateful and I remember just how much my body loves me. I hope you’ll have a moment in your life when you fall in love with your body—when you discover how it's here to serve you and care for you. Maybe you’ll have tender moments when you realize how it constantly turns your food into the cells of your body. We have a contract with food and our body has signed the deed. But you get to choose what it receives. Choose wisely - it can make all the difference. 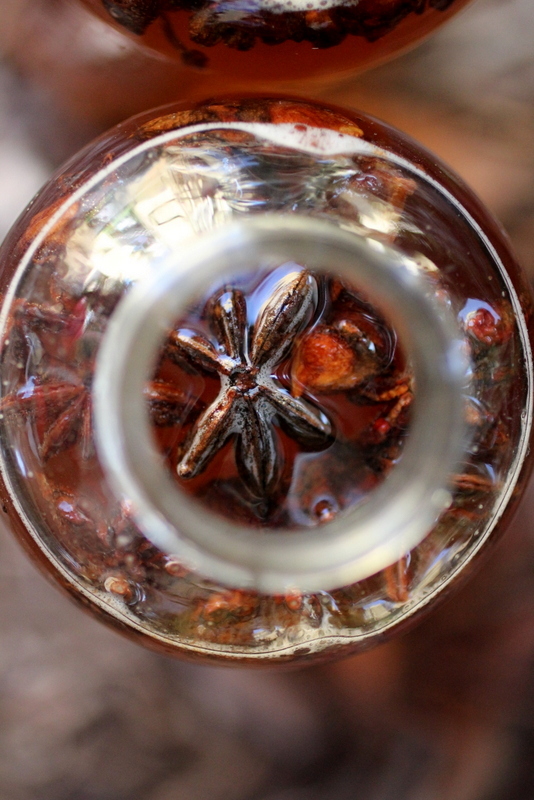 This wonderful home remedy does not need a culture. 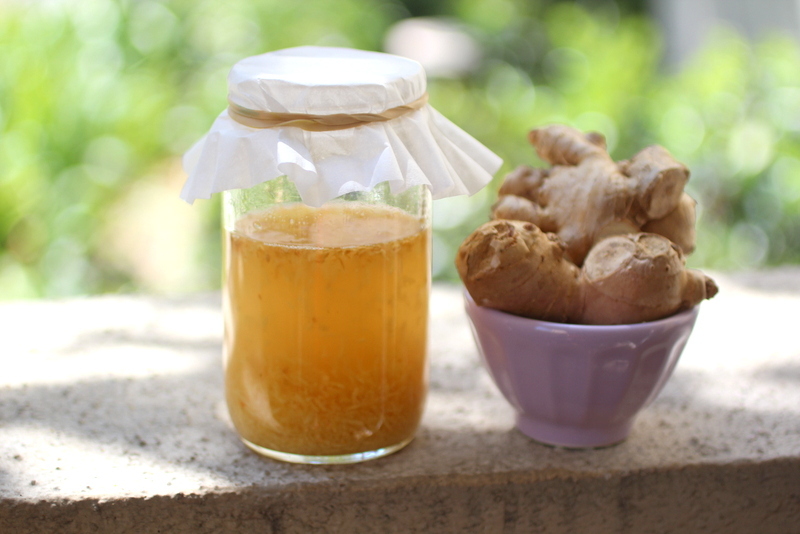 Honey has its own special microbial abilities and is also a prebiotic that will ferment the garlic. 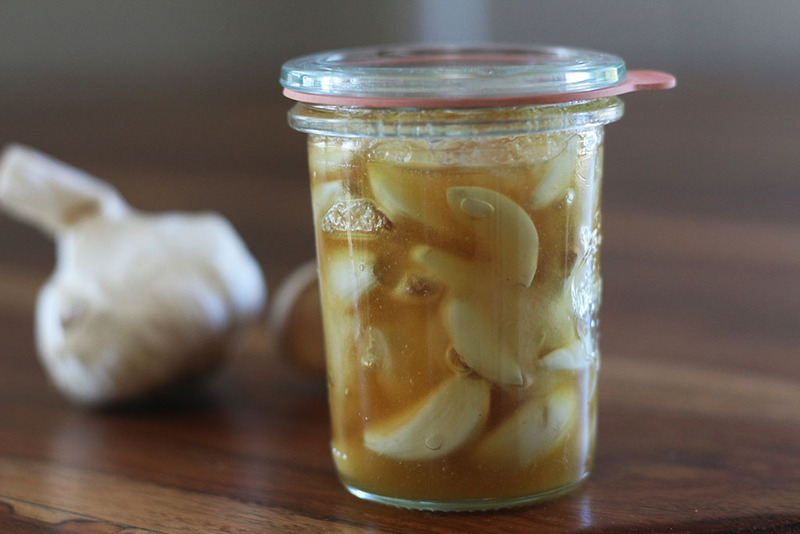 Garlic is also a huge prebiotic, and together they make for a wonderful food that works like medicine that's super easy to make! Allicin is an organosulfur compound in garlic that is made when you crush the garlic or ferment it. It's a defense mechanism against attacks by pests on the garlic plant, and has incredible benefits. There have been studies that suggest a daily high dose of allicin showed effectiveness in preventing the common cold. Eat a clove a day at the first sign of a cold or flu. 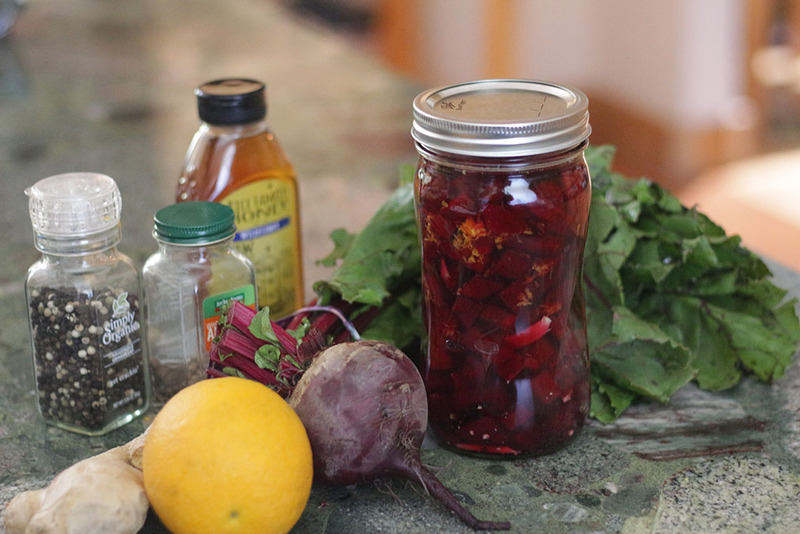 Food is Medicine, especially if it's fermented! This is the best Mayo!! 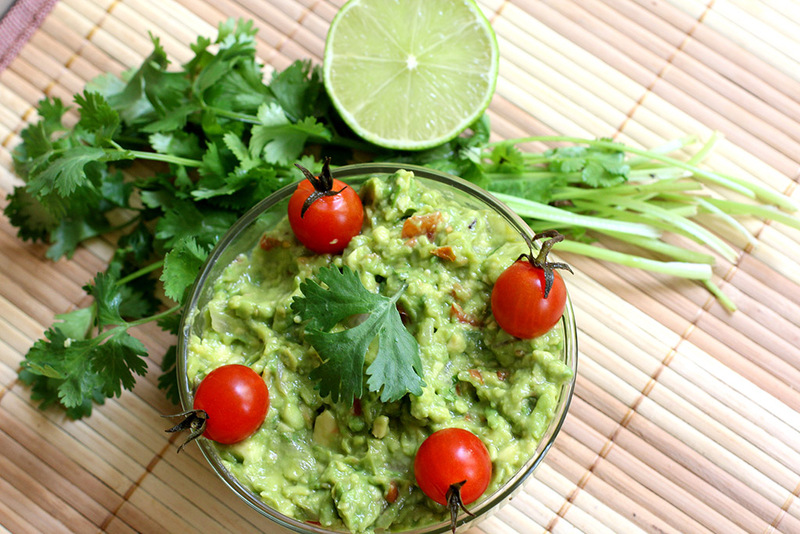 The avocado oil makes such a difference in the flavor compared to olive oil, that can often have a stronger flavor. 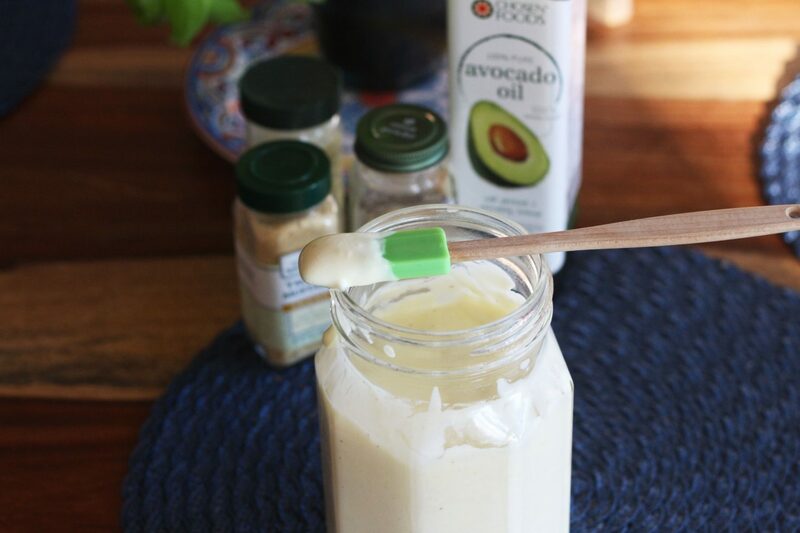 This might be the best tasting mayo I've ever had and it only take 20 seconds to make. Mayonnaise is generally made slowly, blending eggs and oil together over the course of five to seven minutes. However, that has all changed with one of my new favorite kitchen tools: an immersion blender. You can find these just about anywhere that sells mixers and blenders. They’re great for soups and batters, but what they do best is emulsify oil and eggs—in about 20 seconds! A note before you begin: This recipe calls for raw eggs. People with compromised im- mune systems should not eat this. For those of you who do choose to make the mayo, use the freshest eggs possible. The best choice is to get eggs directly from a farm or a reliable vendor at a farmers market; but eggs from cage-free, pasture-raised chickens, which are sold in most grocery stores, are also generally safe. 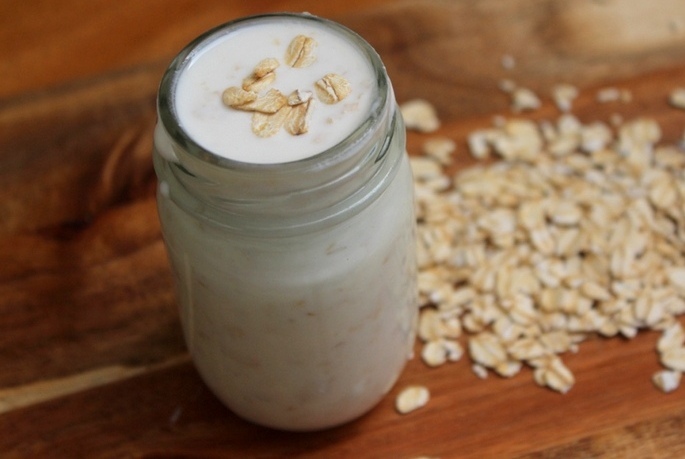 I love this fast breakfast recipe for many reasons. 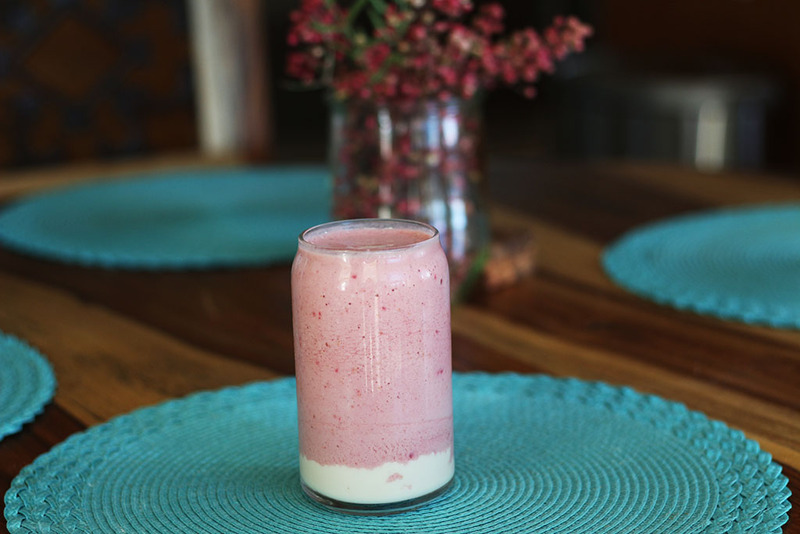 Adding berries to kefir means you're getting lots of antioxidants and polyphenols, which help fight chronic disease and they give me tons of energy! They're higher in fiber compared to other fruits and they're rich in vitamin C. Berries may also help regulate your blood sugar and insulin levels. This protein powder is my favorite. I love that it's sweetened with stevia and all the quality ingredients that go into making it. I also love that you can use the plant based protein or whey protein and they taste the same. The chocolate flavor is good too! 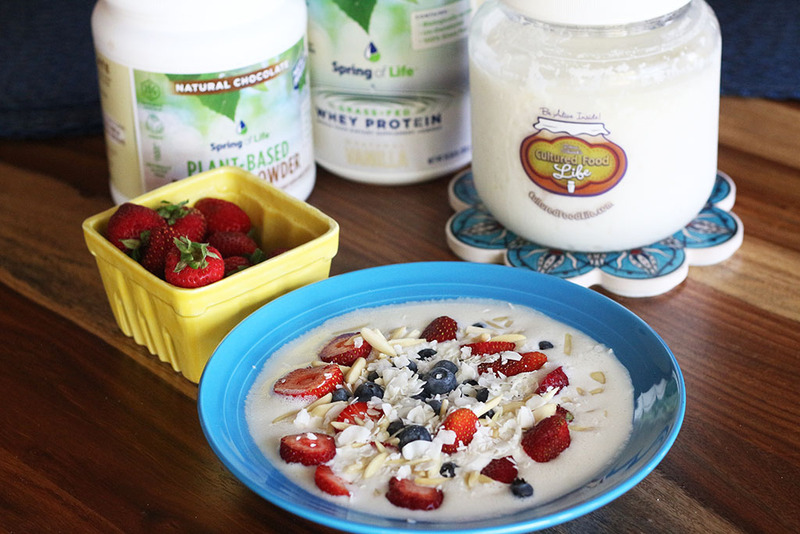 I do better when I have some extra protein in my kefir shakes. It gives me tons of energy! Apples are one of the fruits we eat constantly at our house. They are praised as a "miracle food." In fact, apples were ranked first in Medical News Today's featured article about the top 10 healthy foods. Apples are extremely rich in antioxidants, flavanoids, and fiber; and the phytonutrients and antioxidants in apples may help reduce the risk of developing cancer, hypertension, diabetes, and heart disease. 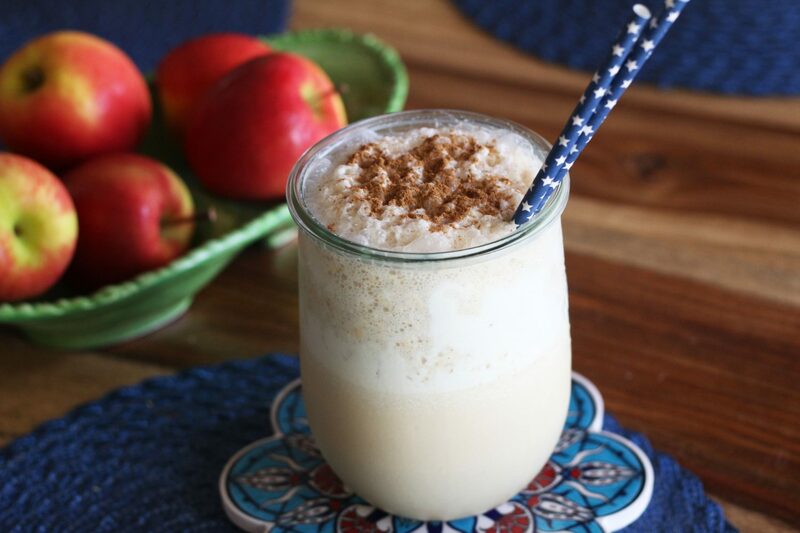 This shake has not only a whole apple, but kefir which is loaded with probiotics, super healthy protein powder, and nut butter that makes for a filling, delicious, bursting-with-nutrients shake. It's my favorite shake to enjoy after a workout! 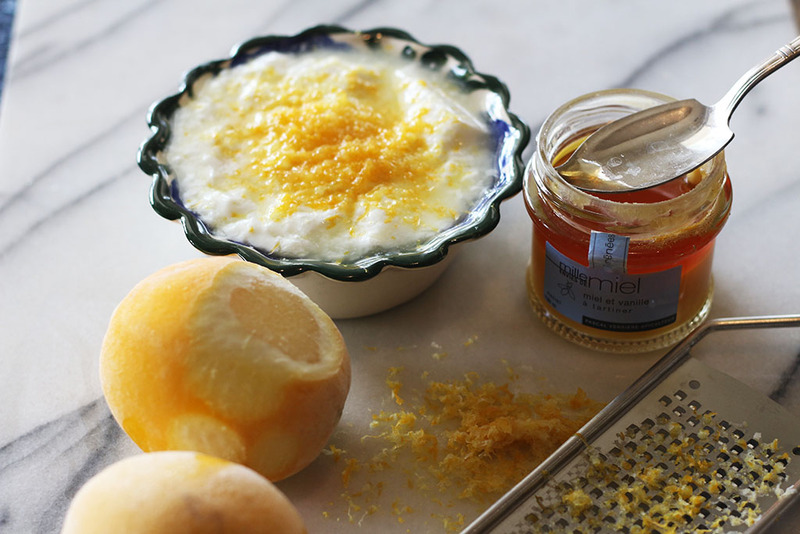 I have always loved lemon curd, but I didn't like all the sugar. I found a way to make it sugar free and just as delicious. 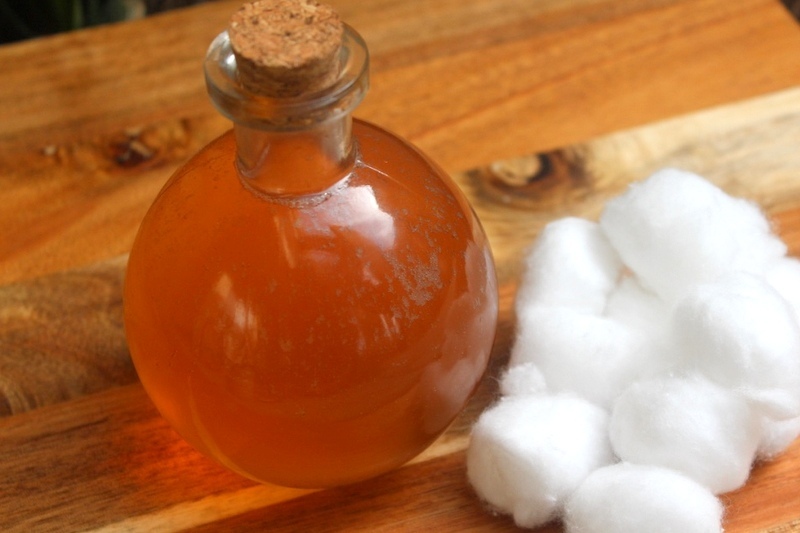 Monk fruit sweetener is made from a small round fruit grown in Southeast Asia. 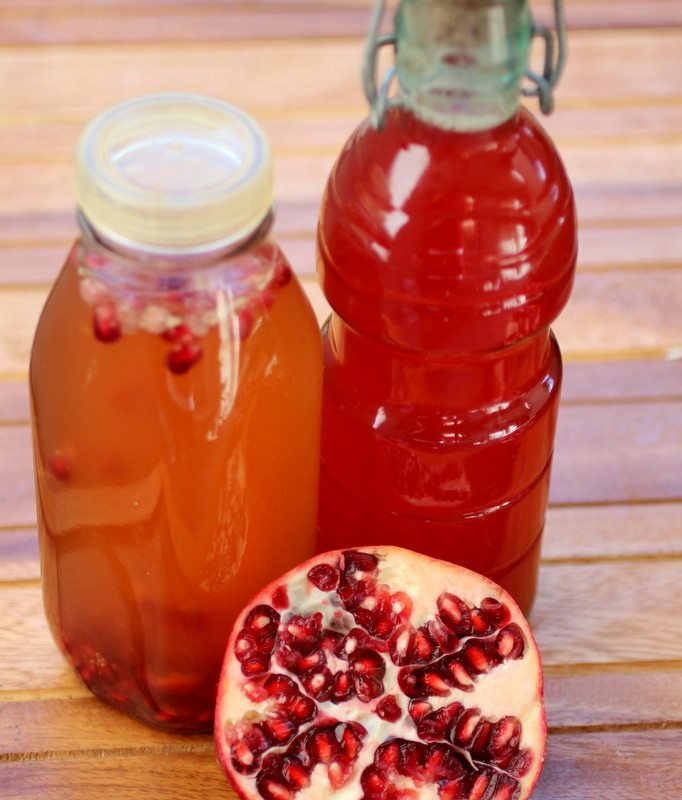 Monk fruit sweeteners are extracted by removing the seeds and skin, crushing the fruit, and collecting the juice. It's much sweeter than regular sugar and I love to use it in recipes so I don't get all the sugar. 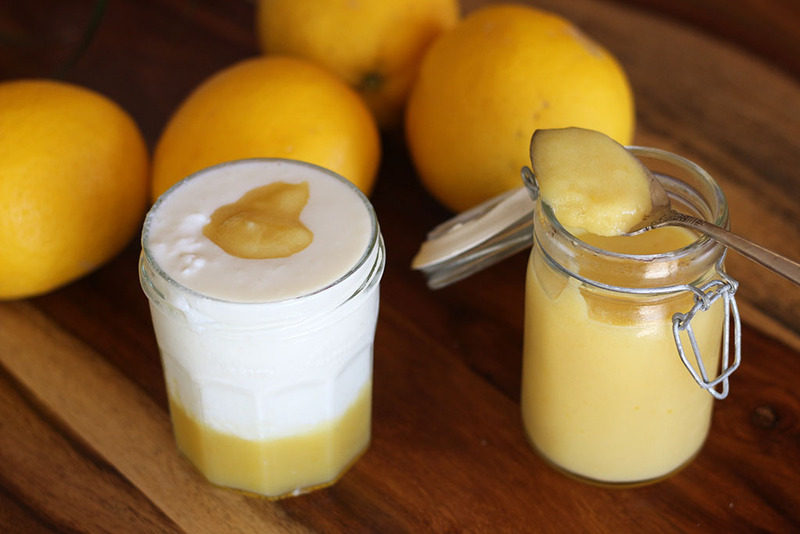 Lemon curd is the perfect way to sweeten your kefir or kefir cheese. It's my fast morning kefir on many days. I'm just crazy for lemon curd and kefir. 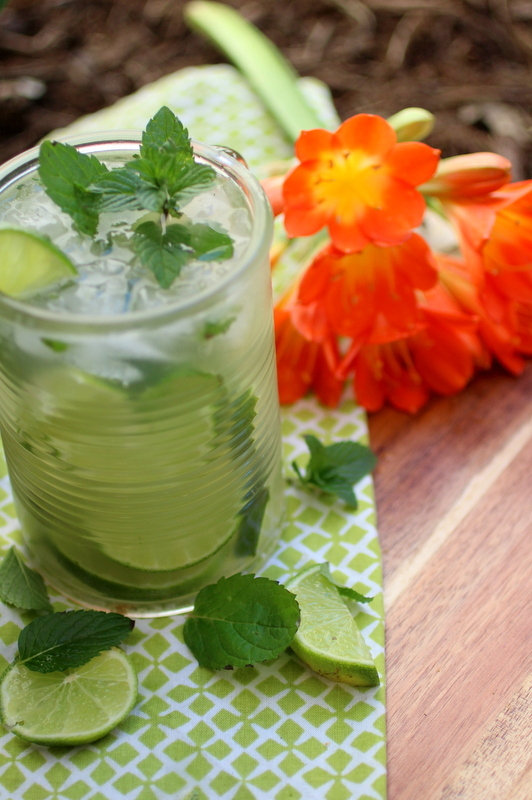 It's a summertime favorite. 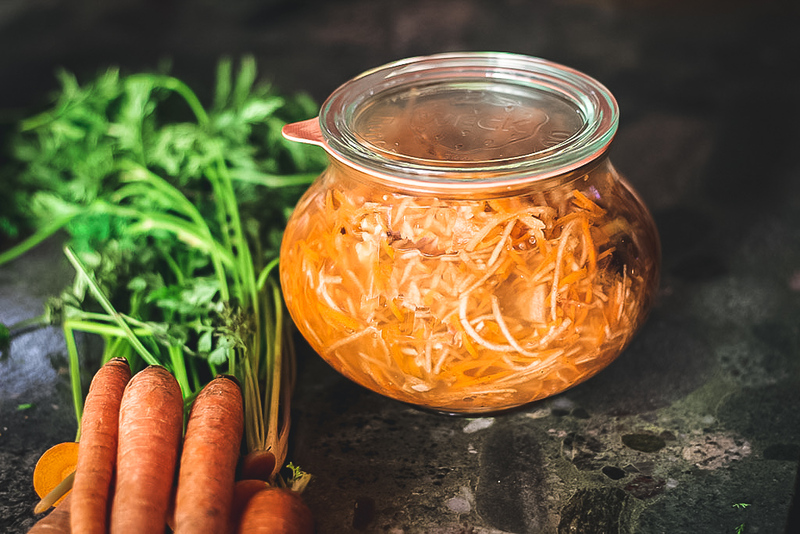 This is a basic kraut recipe and you can modify it and add more veggies and fruits if you desire. 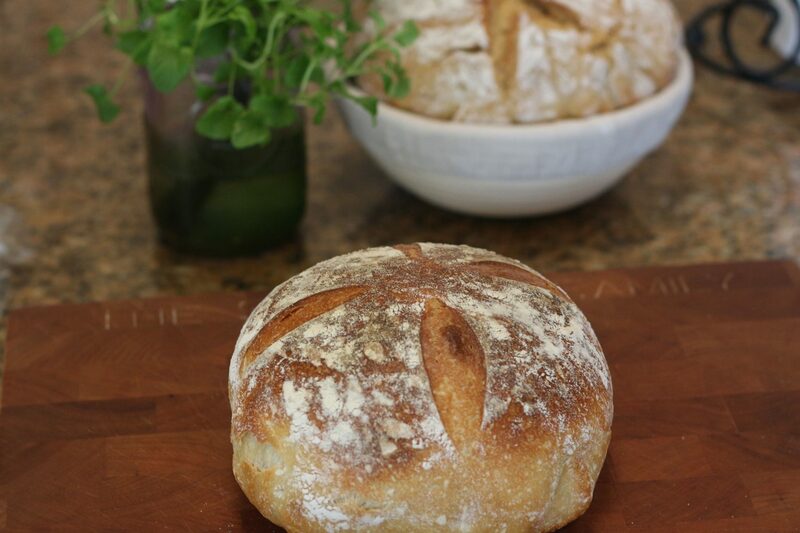 Its fun to experiment and I have over 76 recipes you can try on my recipes tab. 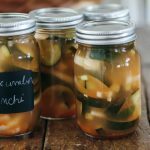 You can make this recipe again and again so you'll always have a jar of delicious probiotic veggies in your fridge that can last for nine months, perfectly preserved. 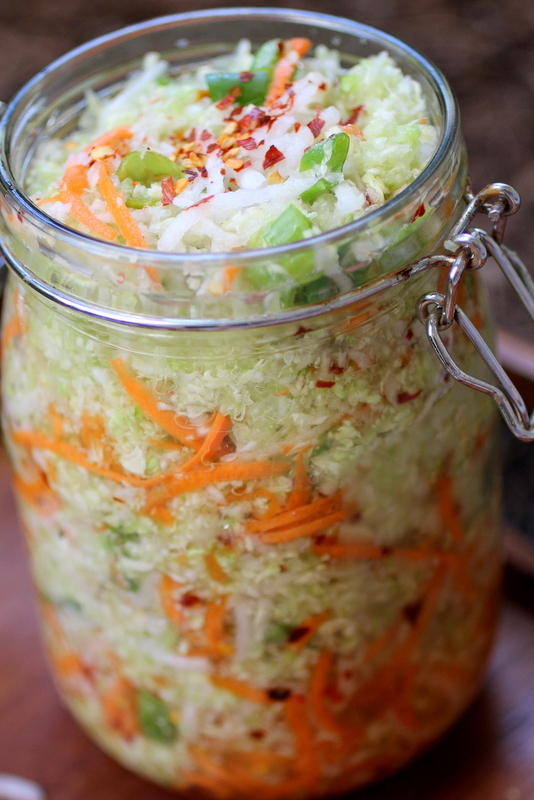 You're going to love this fresh fermented salad. 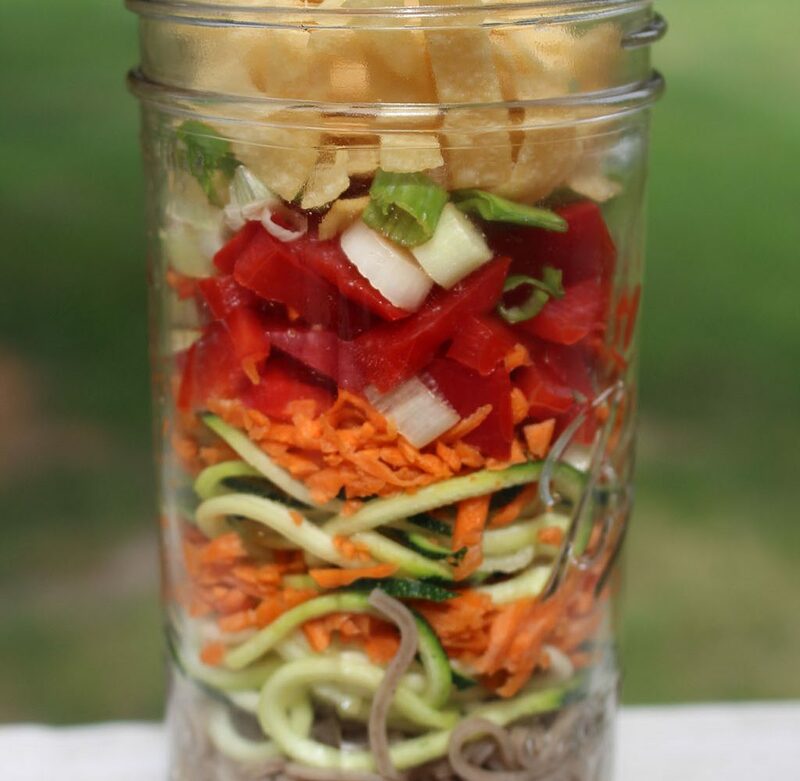 Loaded with tons of probiotics and fresh and fermented veggies, this is heaven in a jar. 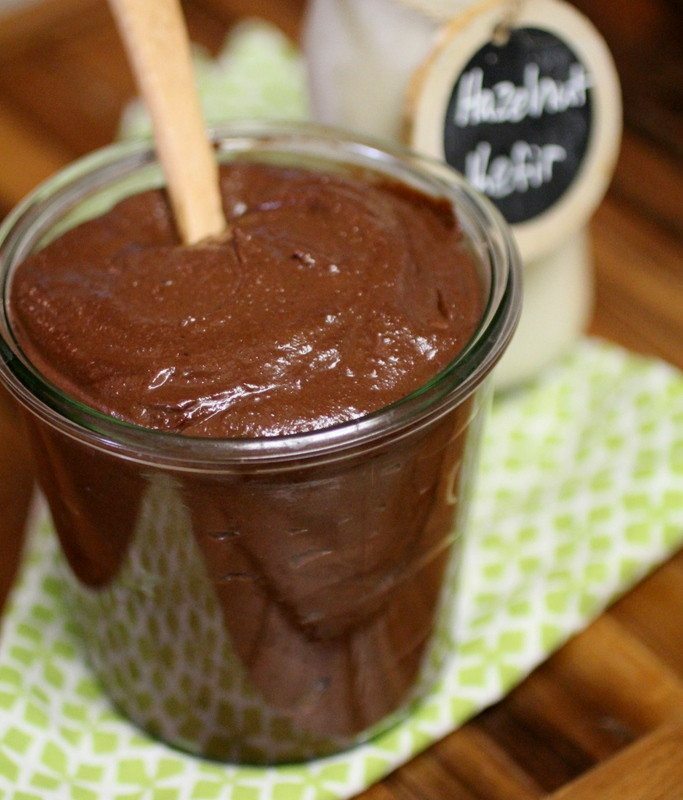 Kefir nut butter sauce makes everything taste fantastic. 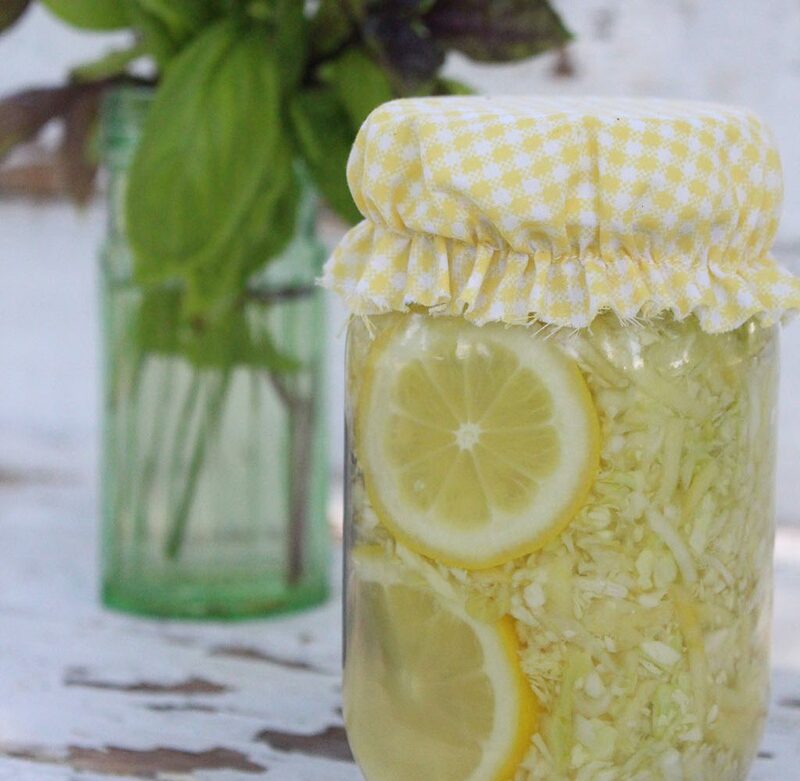 Make this ahead of time, take it with you in a jar, and you'll have the most satisfying lunch or dinner. Soba noodles are made from buckwheat, which is a gluten-free seed. 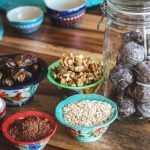 Buckwheat has been consumed in Asian cuisines for centuries, and it’s becoming more popular around the world, partially because of its health benefits. It has been shown to lower the risk of developing high cholesterol and high blood pressure, plus it’s a good source of many healthy nutrients such as manganese and magnesium. I came up with this recipe out of necessity. 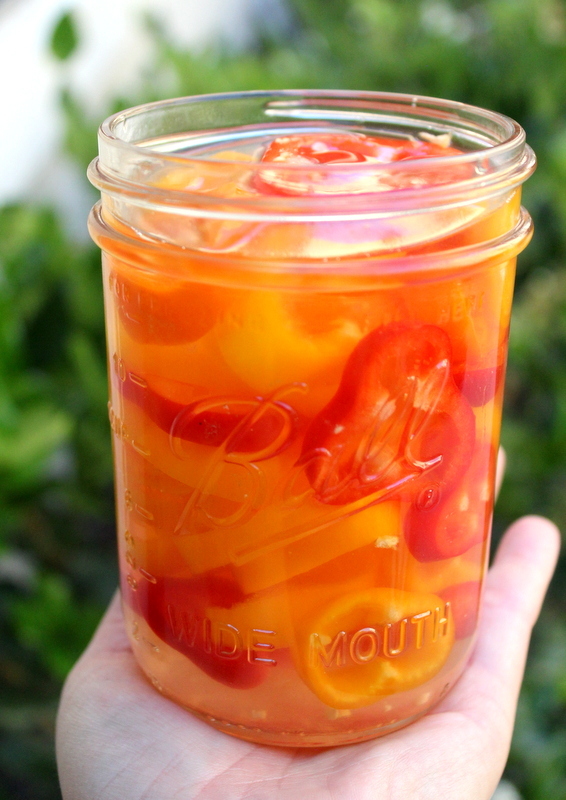 With an over abundance of fruit trees in my new backyard , I had to think of ways to use them. 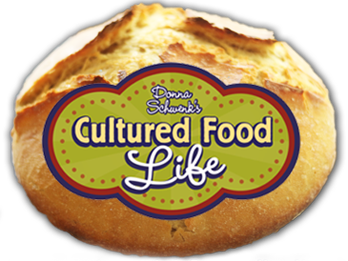 The presence of white grape juice in this recipe provides the sugar content needed for the cultures to consume and make probiotics! 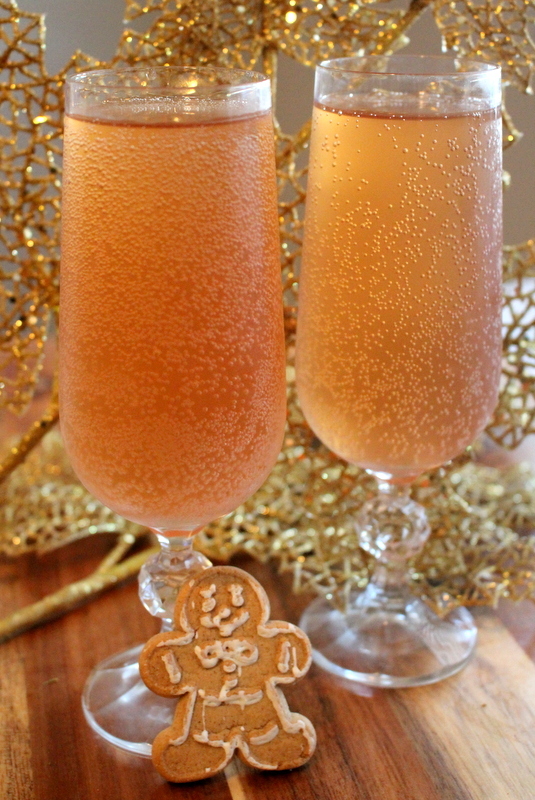 It doesn't hinder the citrus flavor and helps provide the fizz! Just you wait till you try this recipe. 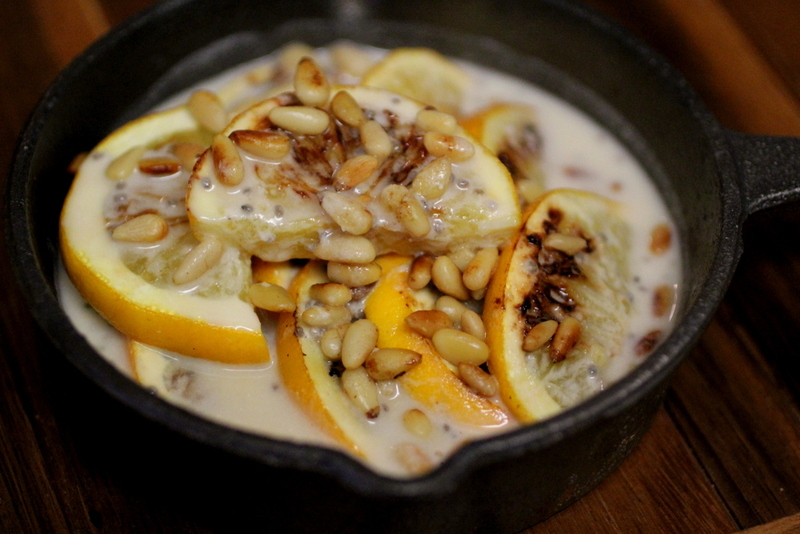 I'm not sure if it's dessert or breakfast, but we like to have it in the morning and especially in the summertime. The millet topping is just the best and you'll want to make extra to keep on hand. 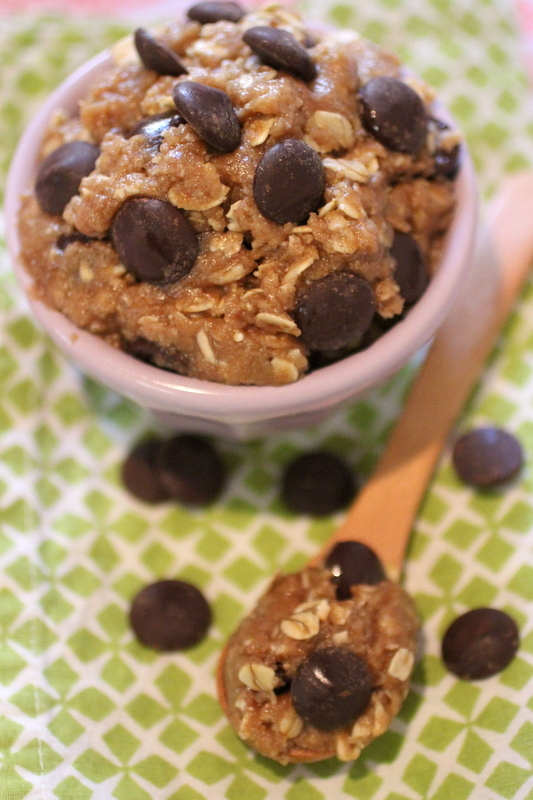 Millet is gluten free and has lots of magnesium and makes the best crunchy topping! 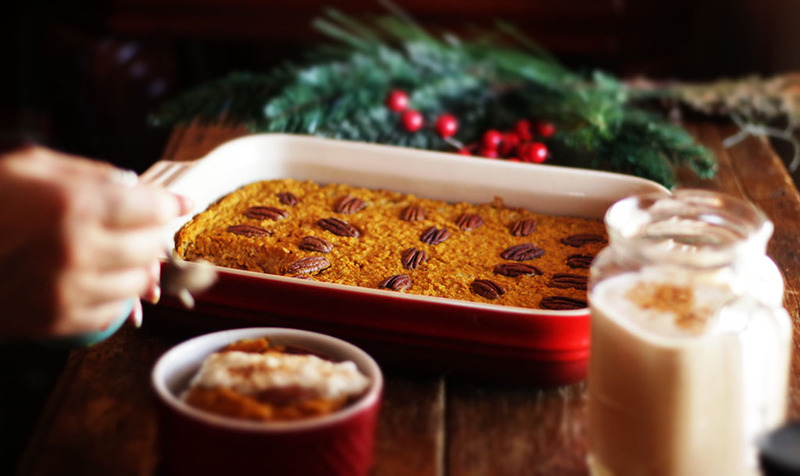 Give this recipe a whirl and wow your family. 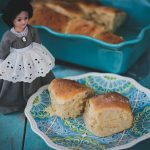 This recipe has only two ingredients and is so easy to make. And, it tastes just like nut butter—you can’t even tell that there’s kefir mixed in—which is why I love it so much. 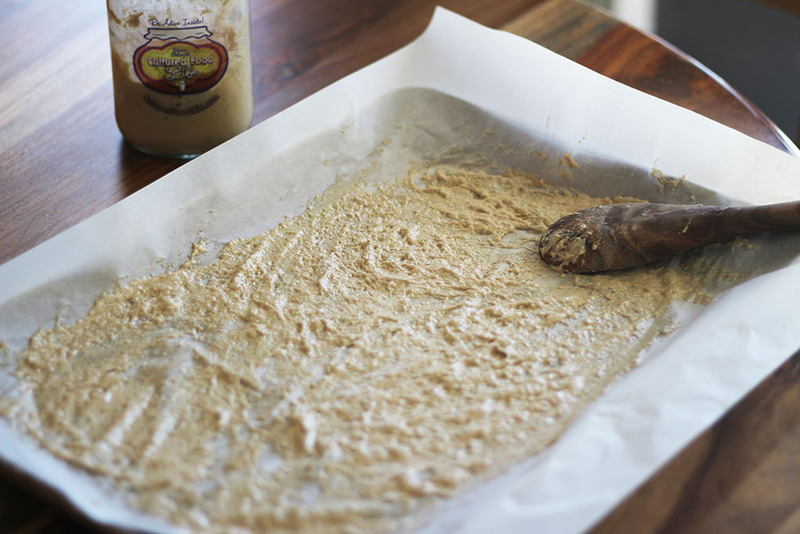 You can use this any way you’d normally use nut butter. 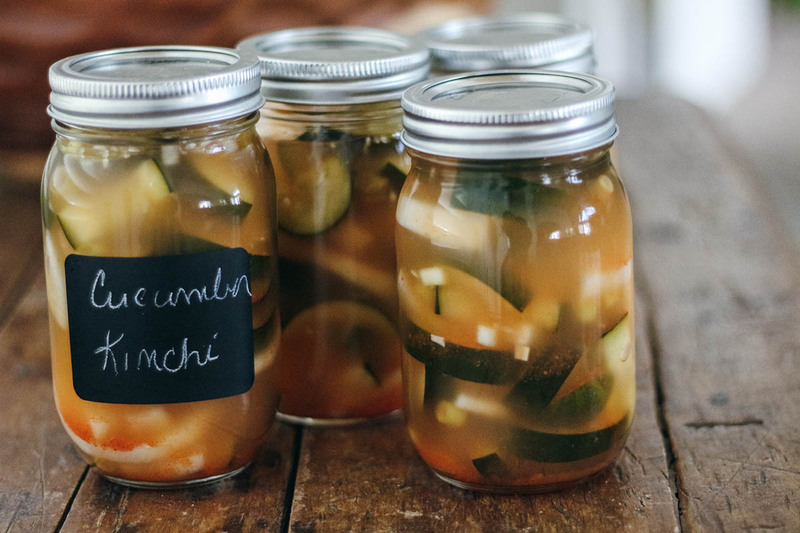 Stuff it in celery—fermented or regular. 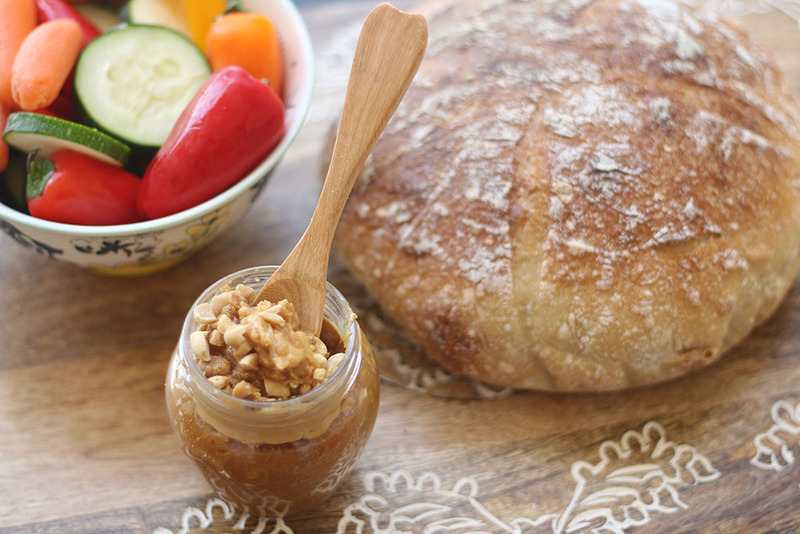 Make a peanut butter and jelly sandwich. Spread it on apples or other fruits - whatever you want. You’re sure to love its creamy texture. 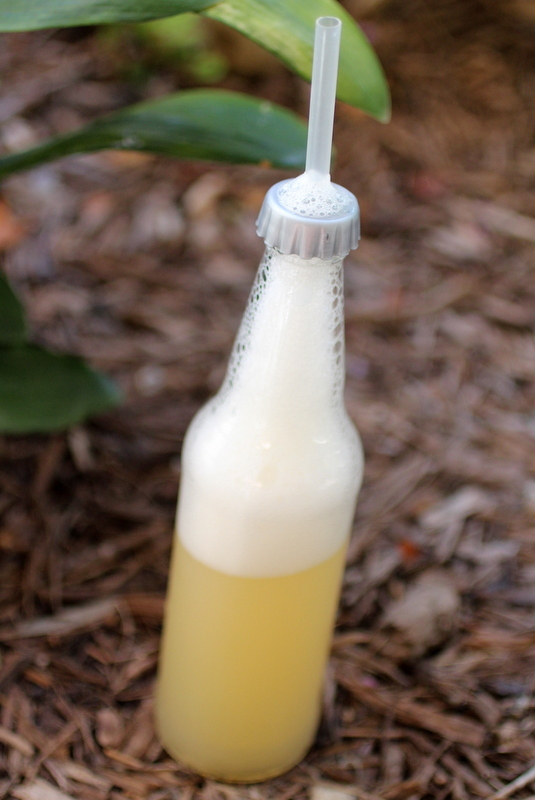 Water kefir tastes pretty plain unless you second ferment it. 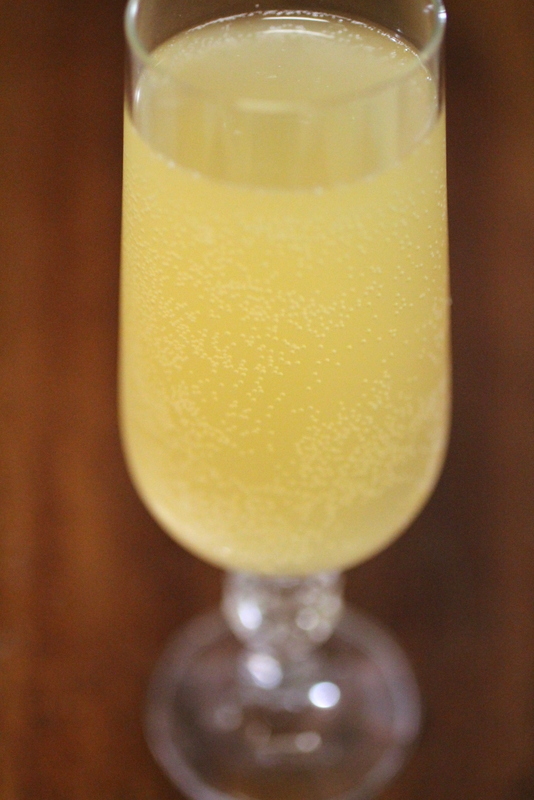 You can choose your favorite juice and make a delicious bubbly drink that is loaded with probiotics. Here is an easy recipe to give you and easy guideline to follow. Mix it up and experiment and find your favorite flavor. Always use thick glass bottles made for brewing. 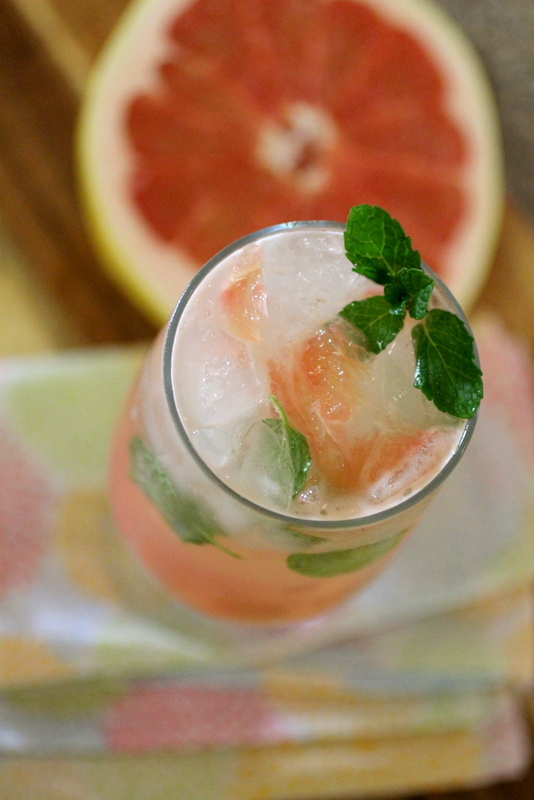 Grapefruits have not only vitamin C but also Vitamin A. A diet high in vitamin A and fiber can fight off the effects of seasonal allergies by boosting your immune system. 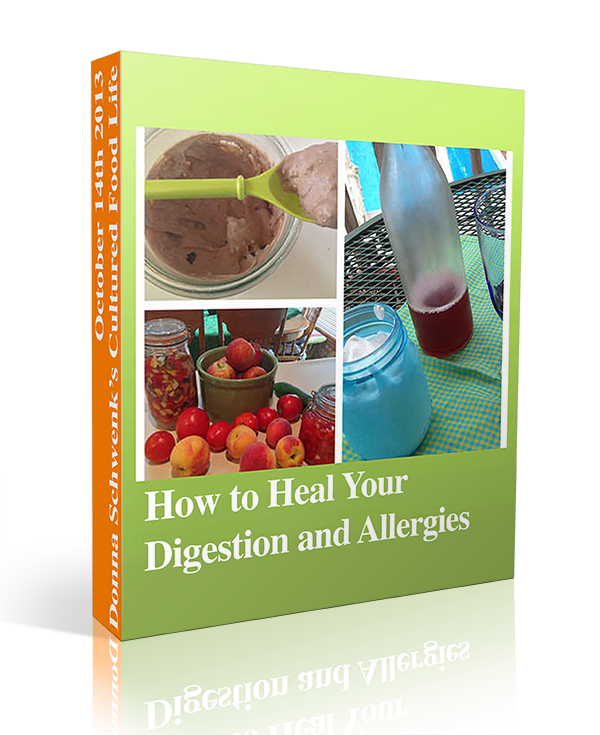 The fiber in the fruit gives your gut bacteria the fuel they need to make short-chain fatty acids, which help control any allergic reactions. Meanwhile, the vitamin A helps those same fatty acid cells continue to function properly. 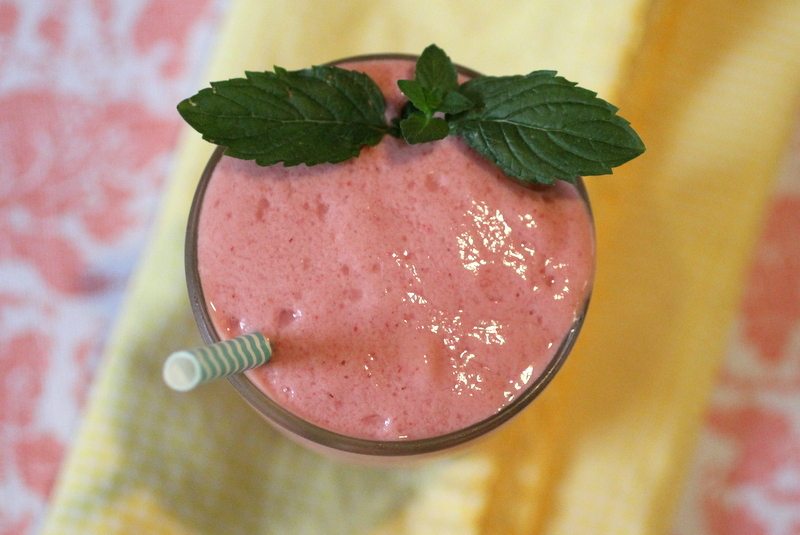 My daughter came up with this super easy recipe when she wanted a superfast smoothie. 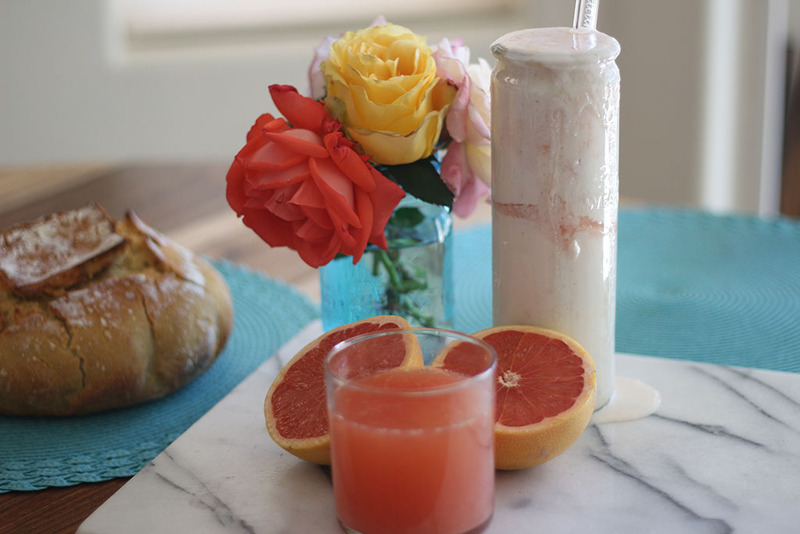 She had an abundance of grapefruits from my grapefruit trees so she squeezed some of the juice into her kefir and voila! 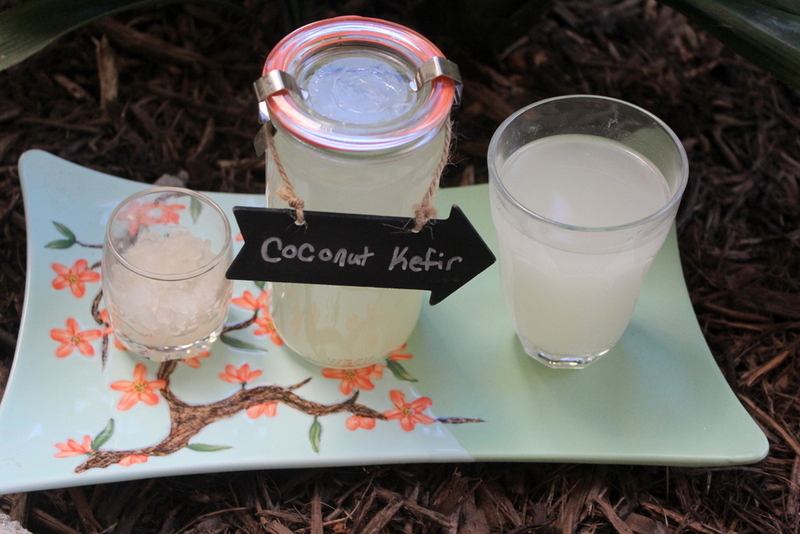 Delicious and the easiest way to get your morning kefir. 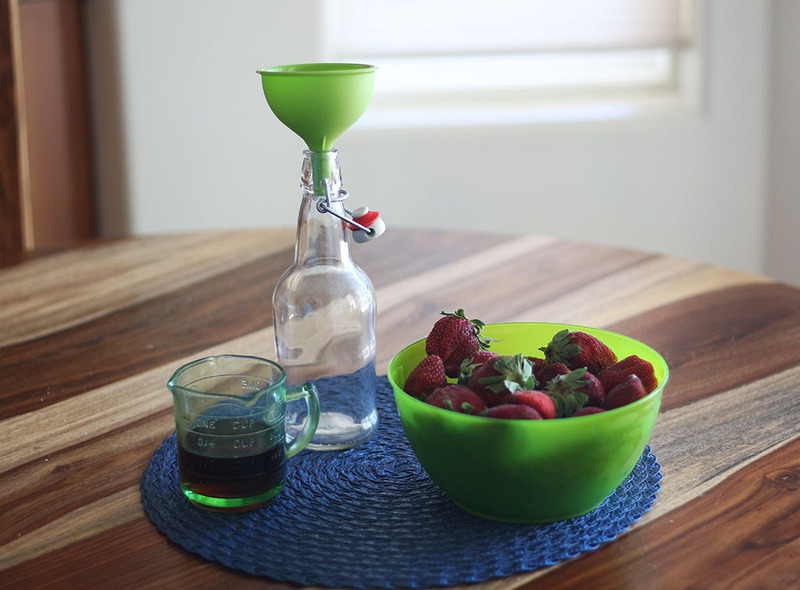 Water kefir is a great replacement for soda pop. 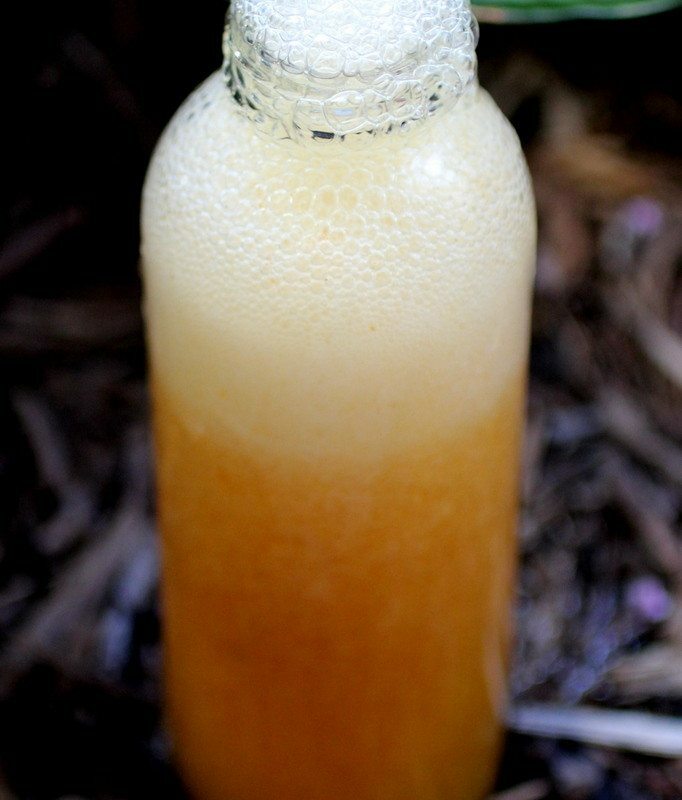 There are many beneficial bacteria and yeasts present in the water kefir crystals. 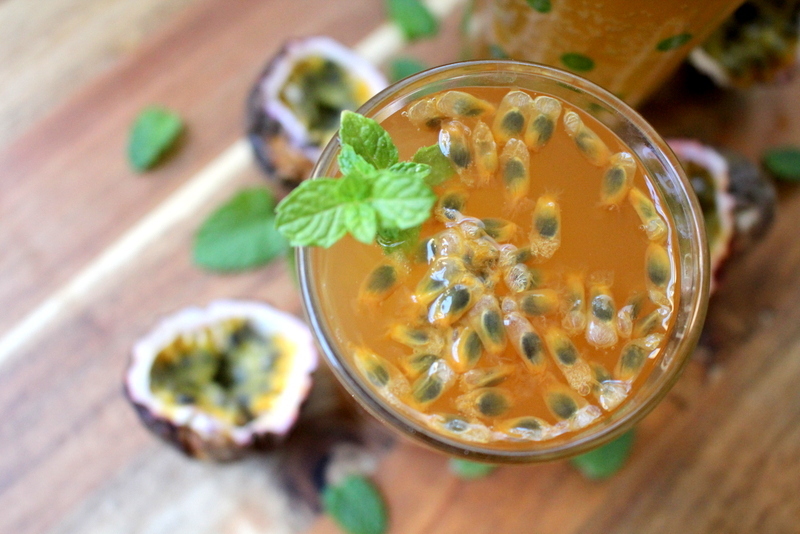 These special probiotics metabolize the sugar, making it a bubbly effervescent drink that is loaded with over 14 different probiotics along with extra vitamins and minerals too. 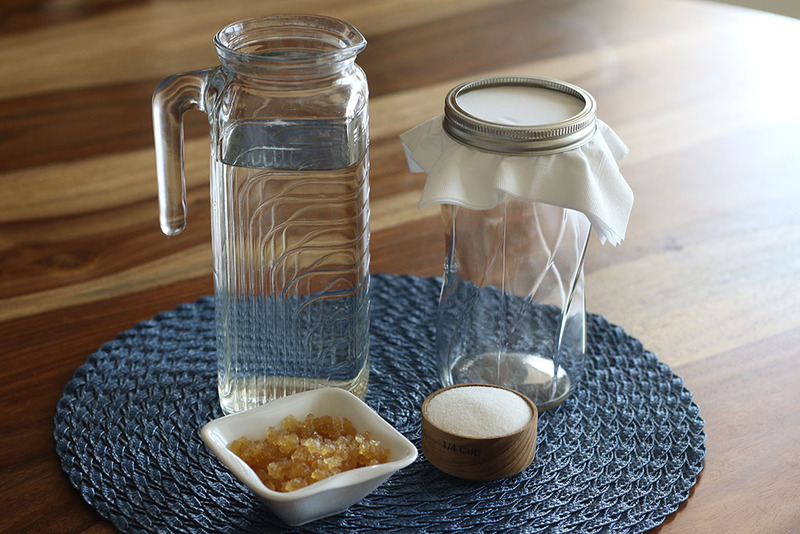 Your water kefir crystals can change in color due to the sugar you use or if you add molasses or another mineral. I eat this dish all the time. It tastes and looks like Greek yogurt. I have it often for breakfast with fresh fruit, and it's fun to serve it with pancakes or eat it by itself, it's so so good. 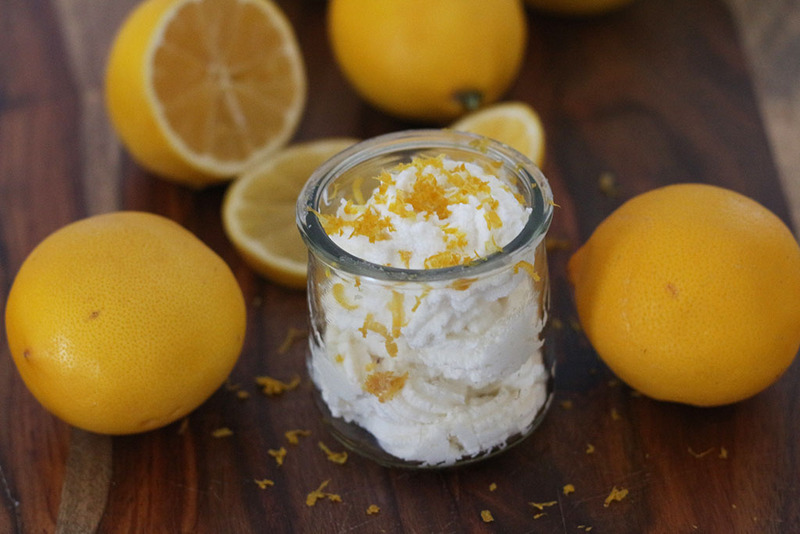 Eating kefir and lemons gives me lots of vitamin C and B's. This helps strengthen my adrenals and lemon peels and their zest contain as much as 5 to 10 times more vitamins than the lemon juice itself. Lemons are health rejuvenators in eradicating toxic elements in the body and flooding the body with nutrients it needs to stay healthy.. 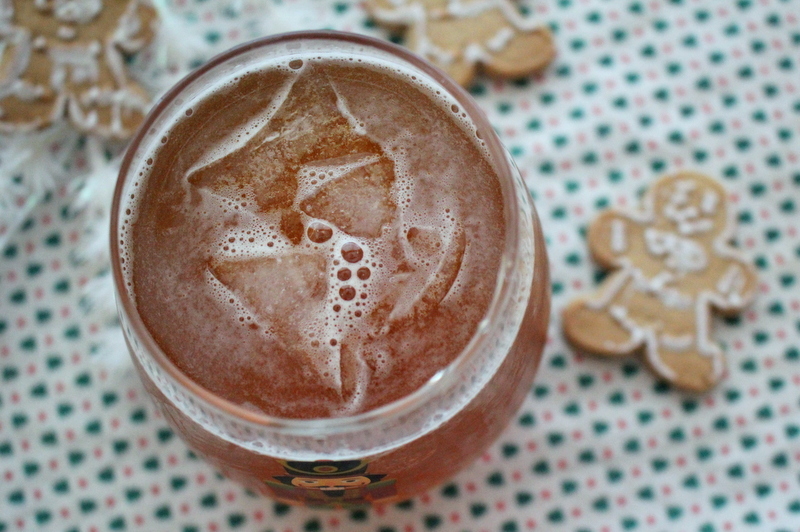 There are two things that determine how bubbly and how fast your kombucha will be done. 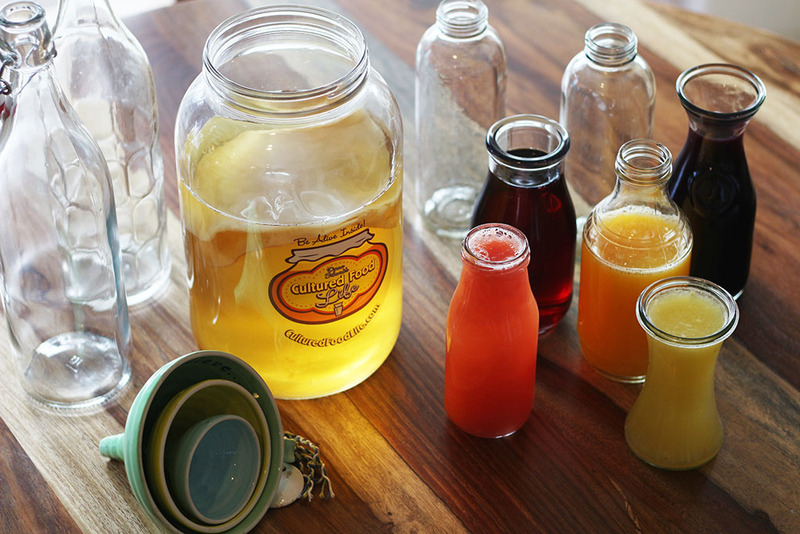 Temperature in your home will determine how fast your kombucha ferments. 75 80 degrees will ferment much faster - it can be done in just a few days, while temperatures in the 60's can take several weeks. You'll need to check the bottles often to make sure they don't explode. 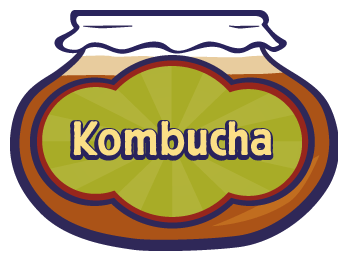 To make sure your kombucha is bubbly, you’ll need to make sure your kombucha is not too sour or overly vinegary tasting. 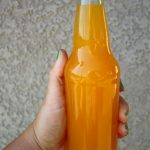 It needs to eat the sugars to make the carbonation - if all the sugar is gone, it will have nothing to eat to make the natural carbonation. 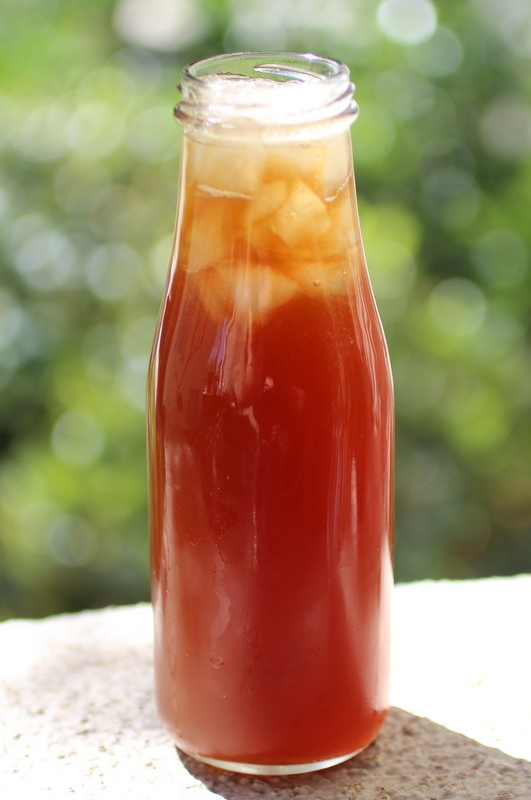 It is best to make your batch when your kombucha is just a tiny bit sweet and not overly sour. 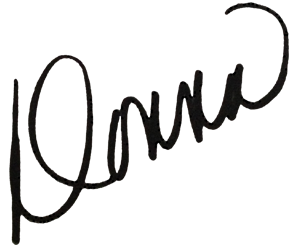 To see more info, refer to this blog. 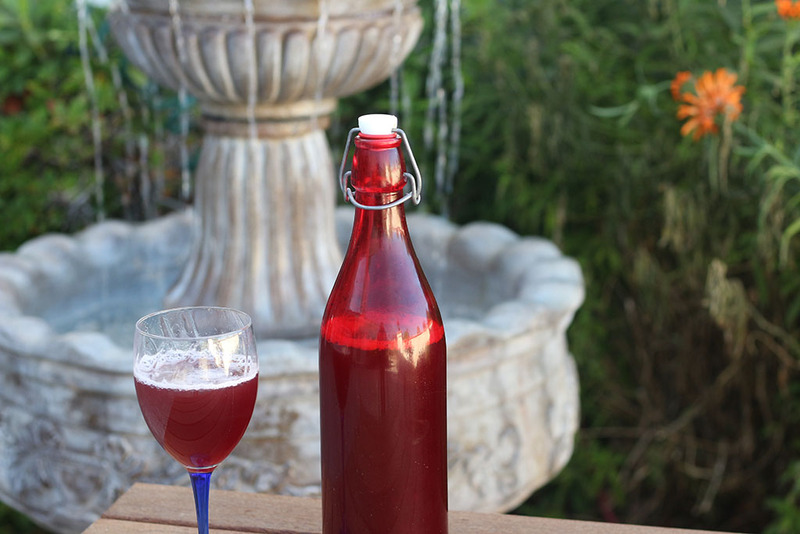 My Kombucha is Not Bubbly Always use good bottles made for brewing. Buffalo wings are all the rage these days. But did you know that the first plate of wings was served in 1964 at a family-owned establishment in Buffalo called the Anchor Bar? The wings were the brainchild of Teressa Bellissimo—she covered some wings with her own special sauce and served them with a side of blue cheese and celery because that’s what she had available. Inspired by this, my daughter Maci took the same ingredients (minus the chicken wings) and made a delicious veggie recipe. Mayonnaise is generally made slowly, blending eggs and oil together over the course of five to seven minutes. However, that has all changed with one of my new favorite kitchen tools: an immersion blender. You can find these just about anywhere that sells mixers and blenders. 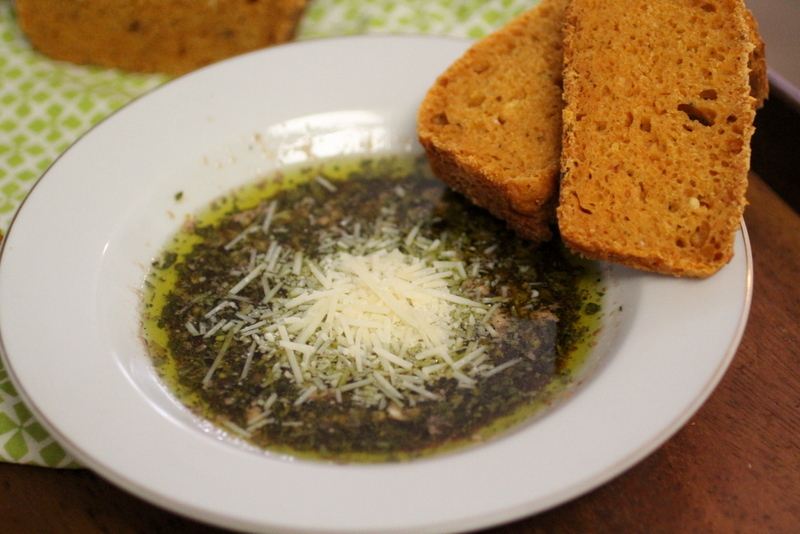 They’re great for soups and batters, but what they do best is emulsify oil and eggs—in about 20 seconds! A note before you begin: This recipe calls for raw eggs. People with compromised im- mune systems should not eat this. For those of you who do choose to make the mayo, use the freshest eggs possible. The best choice is to get eggs directly from a farm or a reliable vendor at a farmers market; but eggs from cage-free, pasture-raised chickens, which are sold in most grocery stores, are also generally safe. 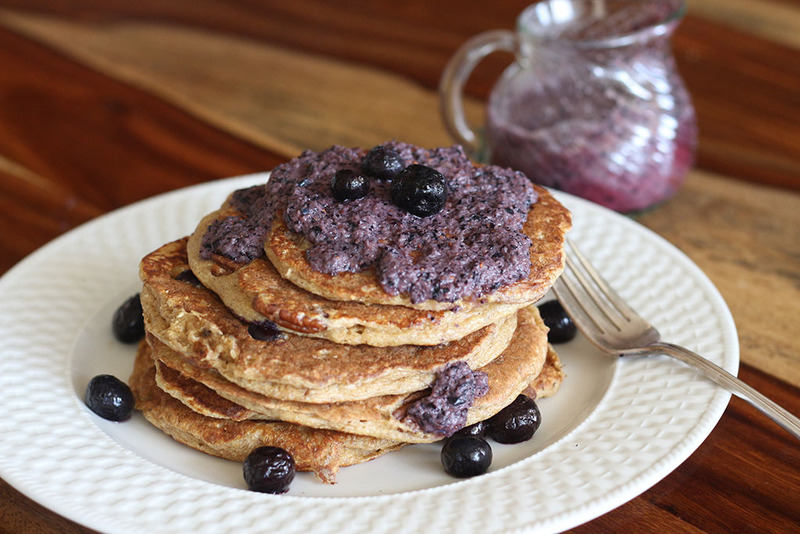 Kefir cheese makes yummy, fluffy pancakes. Although heat kills the probiotics, I added a blueberry kefir compote topping to add the probiotics back in. 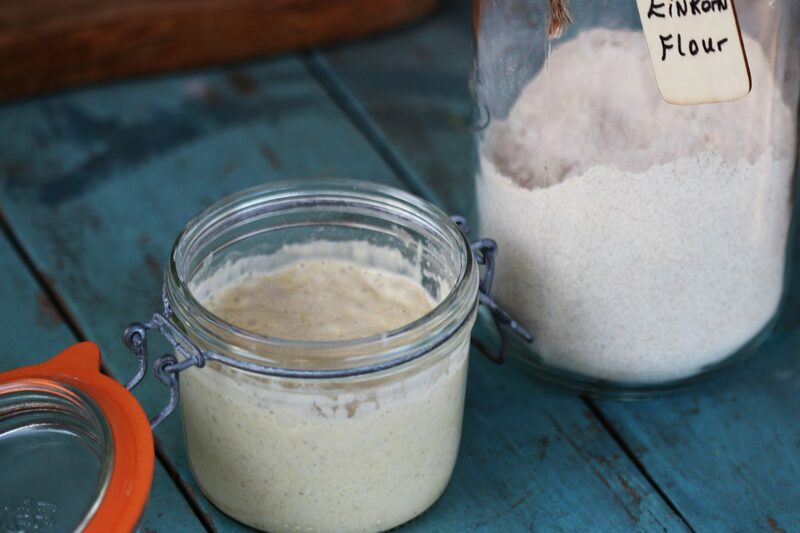 Kefir helps pancakes and doughs to rise much like a sourdough starter, and also makes for a nutrient-dense food that will sustain you all morning long. 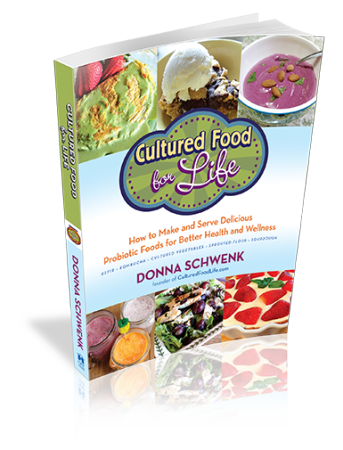 How do I explain how much I love these cultured veggies? The taste is so good and very different from regular kimchi. 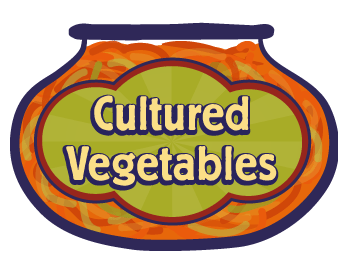 Hints of jalapeños and unique spices make this cultured vegetable one you'll reach for again and again. I love it on tacos and as a side dish served with blue corn chips. In El Salvador, the country where this dish originated, it is called Curtido and is often served alongside pupusas, a dish made from corn flour pancake stuffed with a filling of shredded cheese. 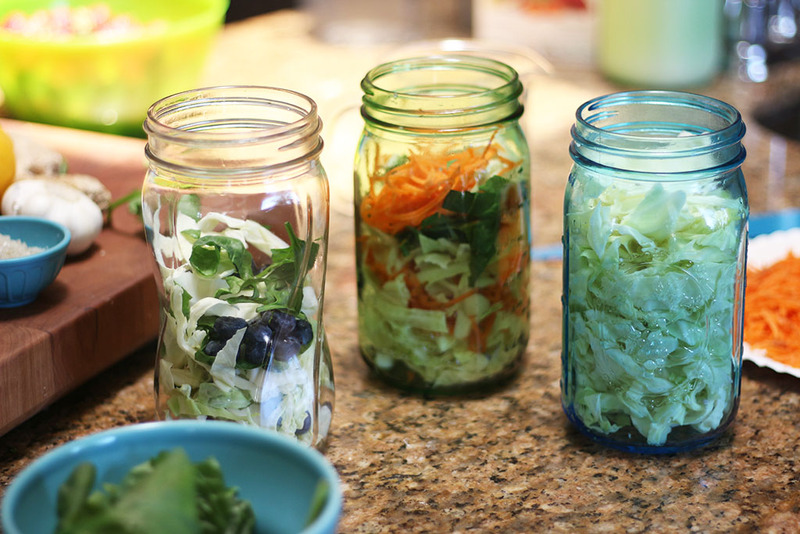 However you serve it, you'll get billions of probiotics and a taste that can't be beat. 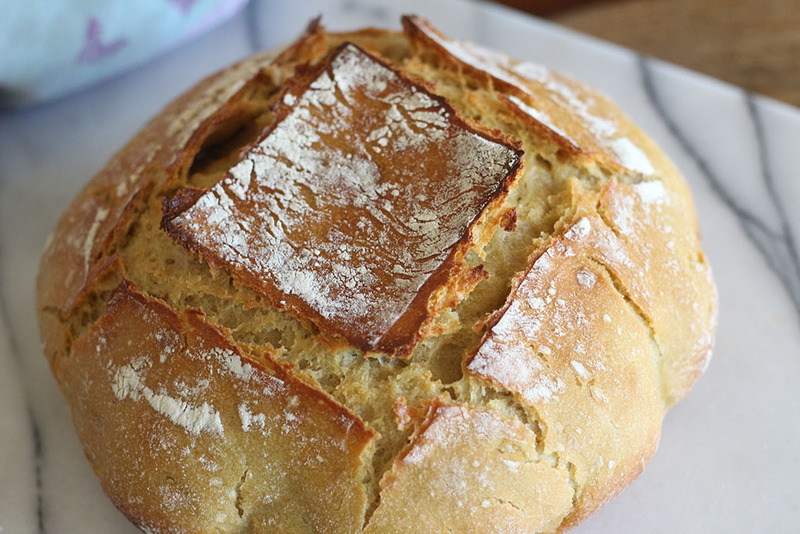 This is a thick Greek Yogurt type of texture which is hard to achieve with most nut milks. 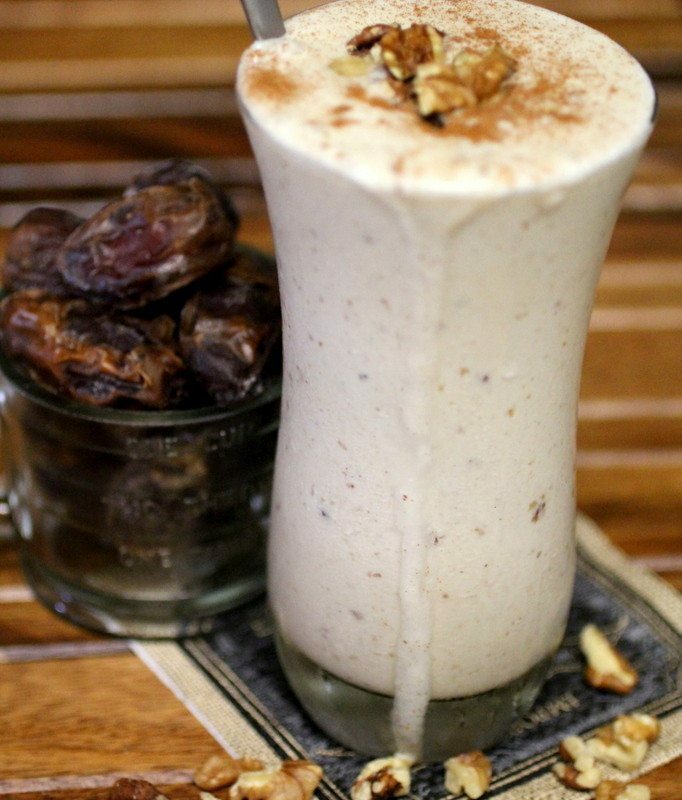 You have to use a certain brand of nut milk (it contains added protein) to accomplish this. They use a vegan pea protein in this milk and the result is a thick curd and a delicious nut milk kefir that can't be beat. They have two flavors, plain and vanilla, and both work great! The brand is Silk Nut Milk with protein. 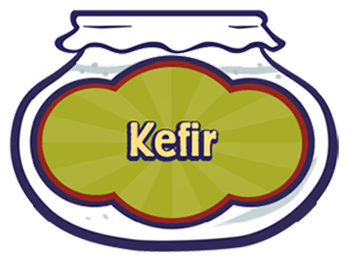 You can make a lot of kefir using Easy Kefir as each batch can make new batches. Update!! we find another milk that works the same way Ripple Milk made from Pea Protein. 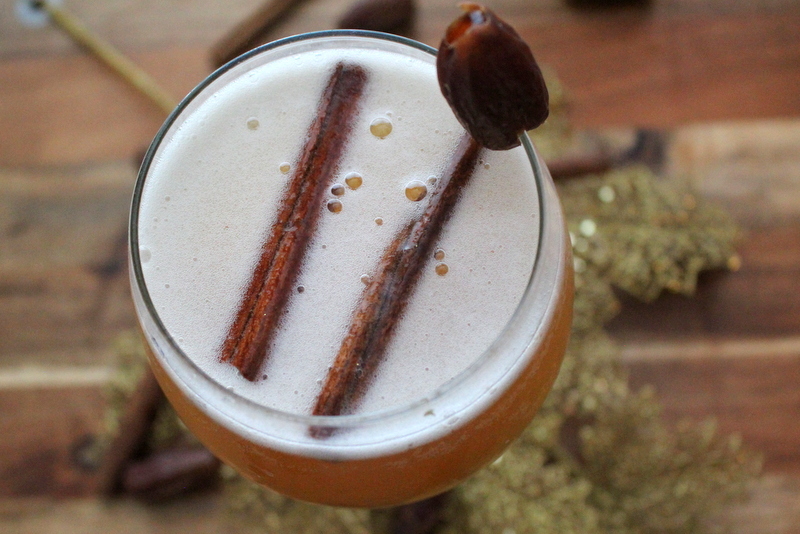 This pairs well with sprouted tortilla chips. They are becoming more popular and there are several on the market now. I am loving Unbeatable Blue Tortilla Chips. 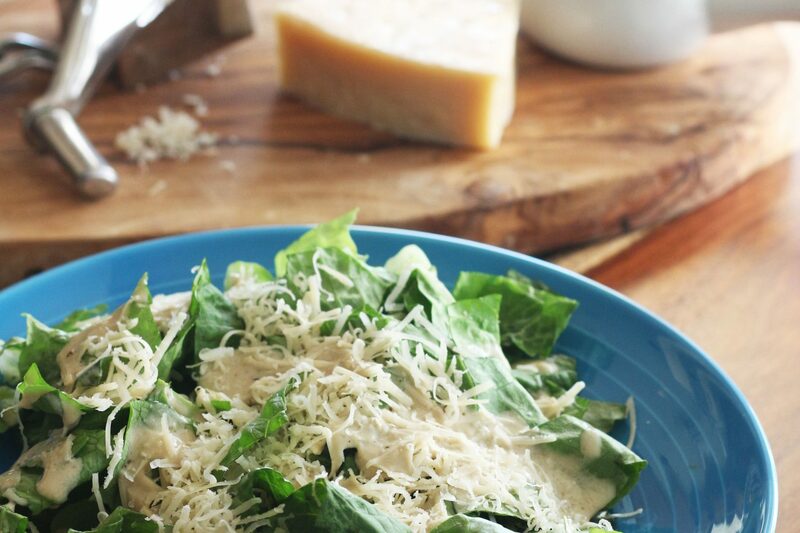 Here are some of the benefits of eating this salad. Apples help to activate the muscle cell insulin receptors keeping blood sugar levels in better balance. 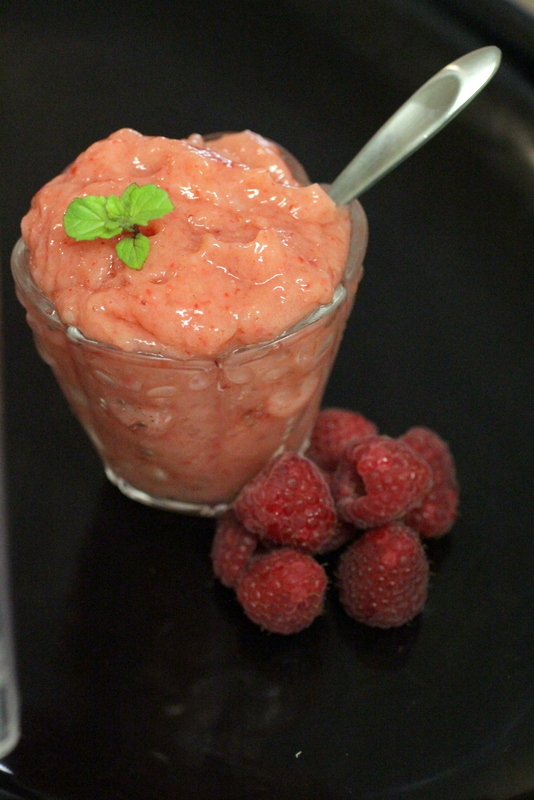 Strawberries have strong anti-inflammatory properties. Blueberries have compounds called proanthocyanidins that prevent bacteria from sticking to the walls of the urinary tract, preventing UTI's. Walnuts also have a positive effect on thermogenesis. Thermogenesis helps to increase your metabolism (the rate at which you burn calories), suppress your appetite, and promote weight loss. 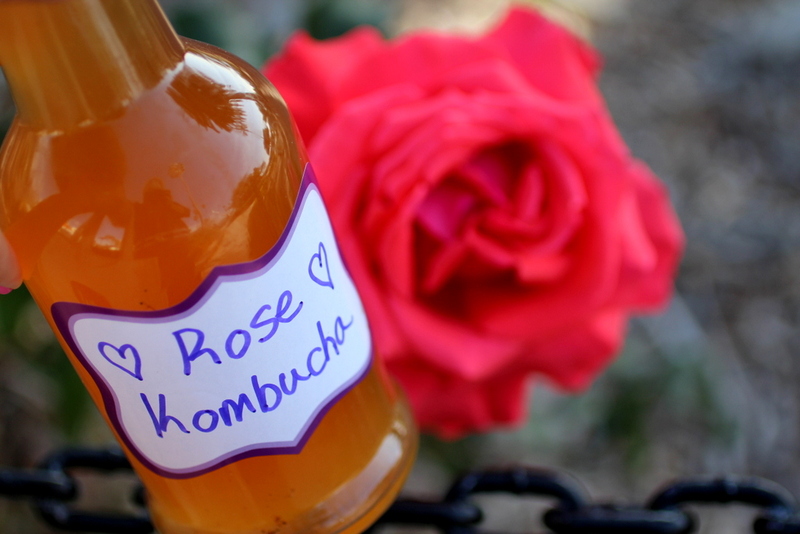 Kefir & Kombucha are probiotic powerhouses that give you tons of probiotics. 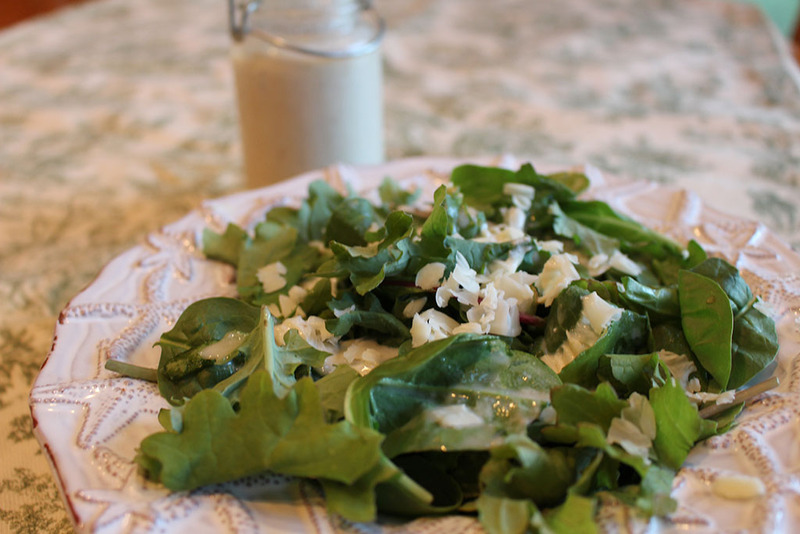 All of the fruits are prebiotics and the kefir and kombucha are probiotic so this salad has numerous benefits! 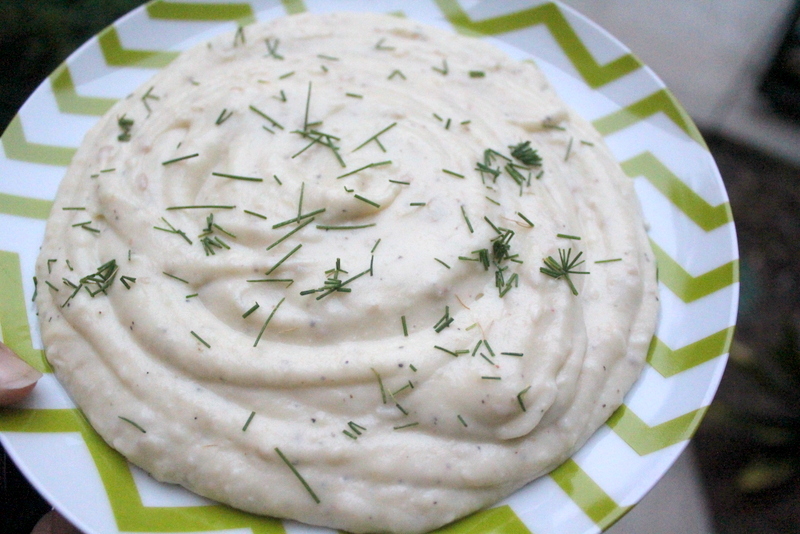 Garlic N Kefir Cauliflower Mash! 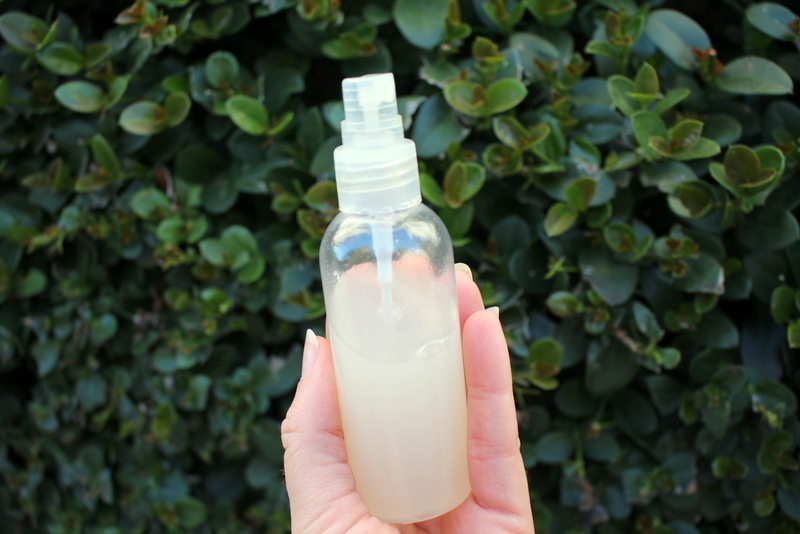 Buy a little spray bottle from the dollar store to use for your facial toner. Its better if it's glass but plastic will work too. 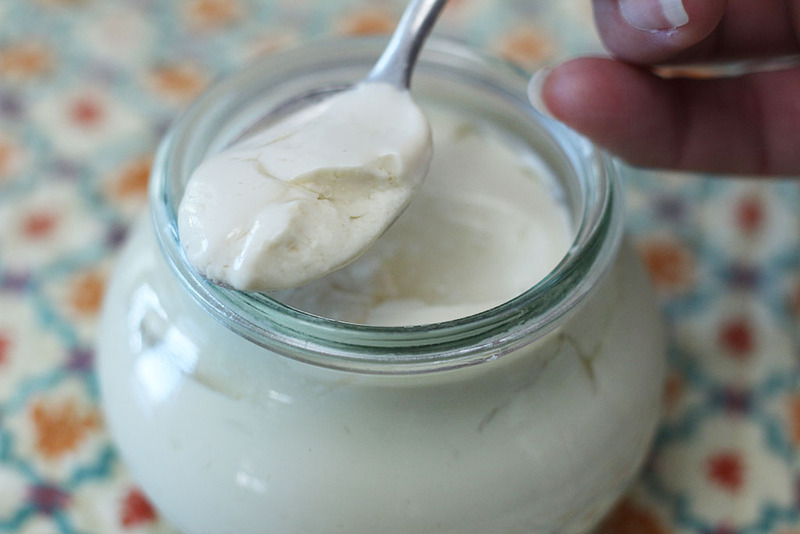 This is a wonderful way to use your extra kefir whey leftover from making kefir cheese. 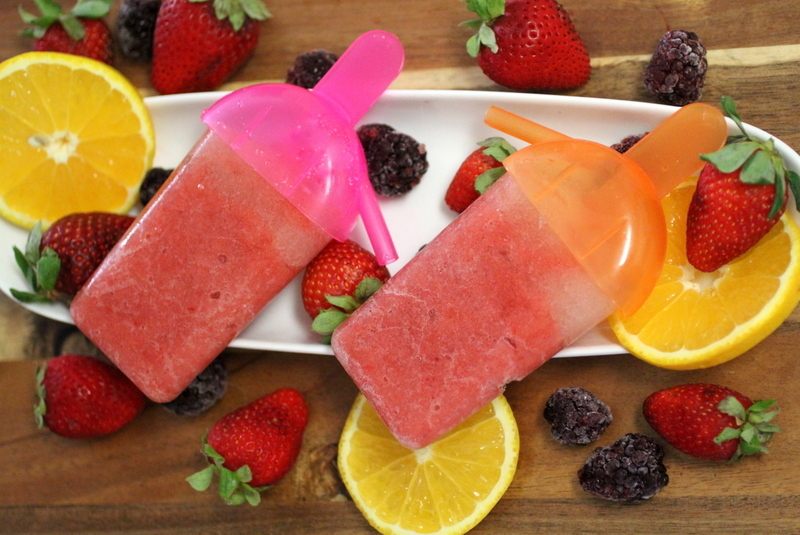 You will love Frozen Lemon and Kefir! 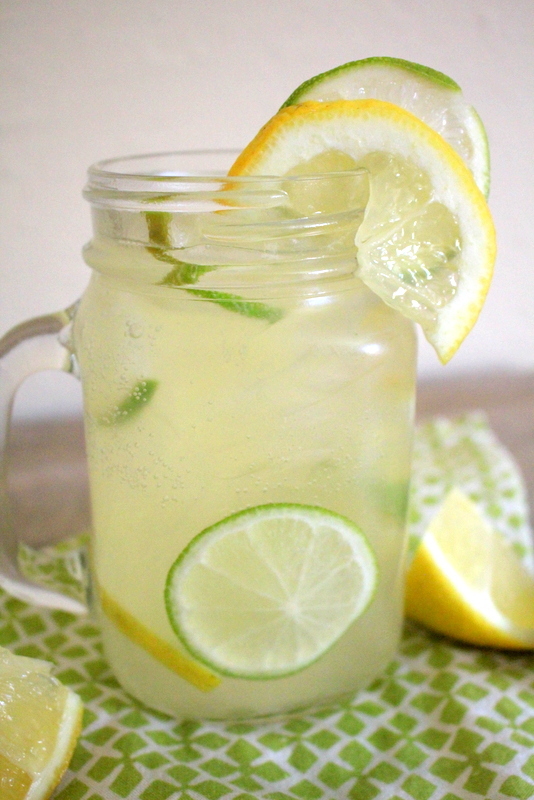 It's so simple and so yummy, you'll be freezing all your lemons. 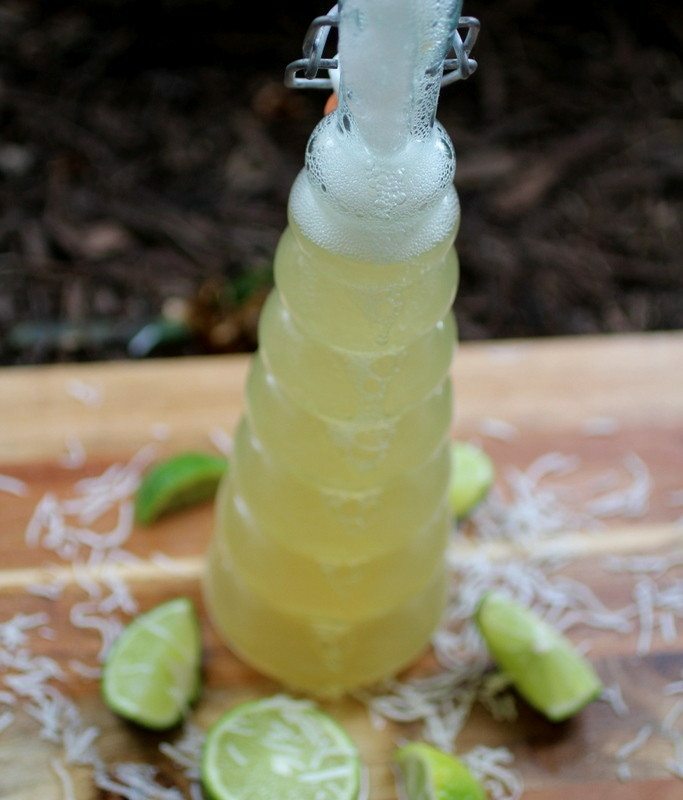 It works best to grate your lemon with a microplane grater, which is a very fine grater that gives you tons of flavor from your lemons. 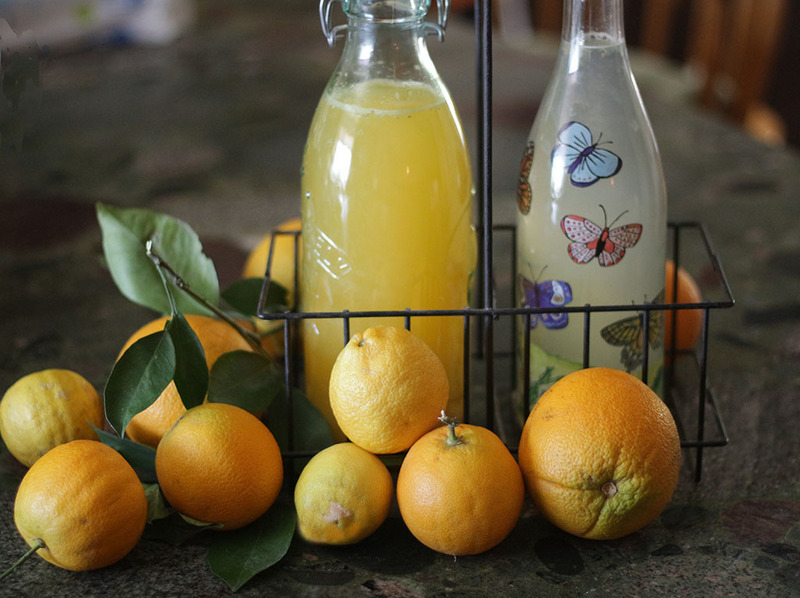 Meyer Lemons hit the supermarkets in the winter and boy are they delicious! Sweeter than regular lemons and deeper in color, I highly recommend trying to find these beauties from December through May. I love them so much and you can freeze a bunch for when they're not in season. In the winter. I love them so much and you can freeze a bunch for when they're not in season. Consuming vitamin C supplements does not provide the same protective benefits as drinking orange juice, says Italian researchers in the British Journal of Nutrition. 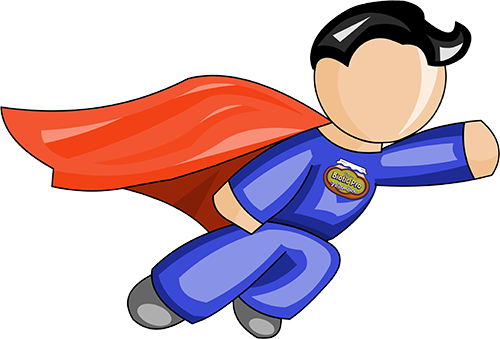 Leading researcher Serena Guarnieri says, "It appears that vitamin C is not the only chemical responsible for antioxidant protection." There is a matrix of phytochemicals, for example, cyanidin-3-glucoside, flavanones and carotenoids. You'll get more of what your body needs from the fruit than any supplement. 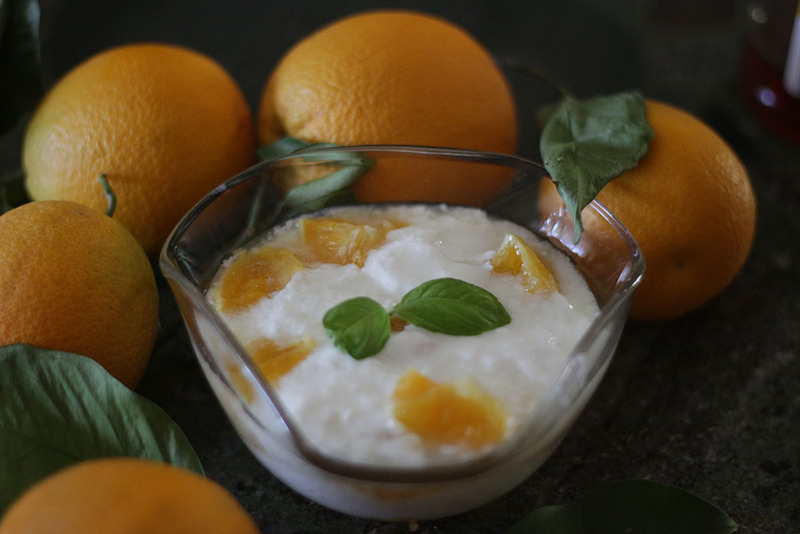 Oranges and kefir are a match made in heaven. I reach for this combination during the spring when lots of pollen is in the air. 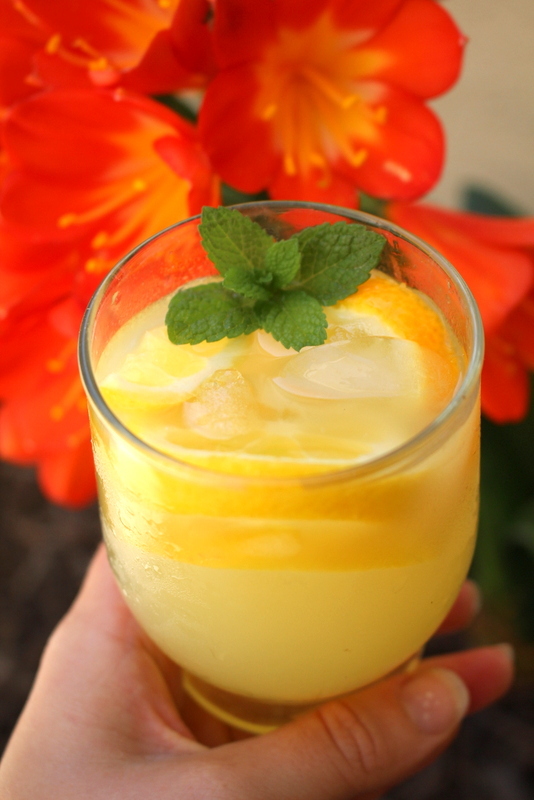 Your body needs lots of vitamin C to help your adrenals handle the stress. Check out this article for more info. 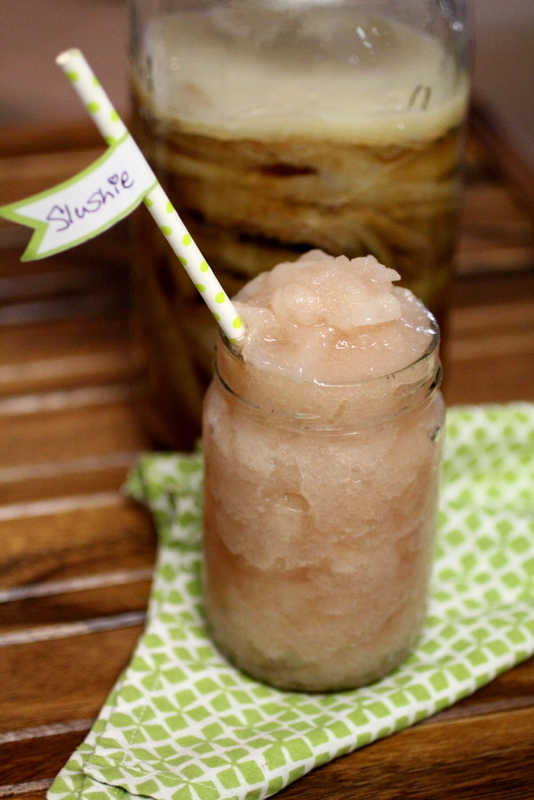 If you like iced coffee then you'll love this recipe. Cold brews takes away any bitterness that you can find in coffee. This is a concentrate so you'll mix it with part water when you're ready for a glass. 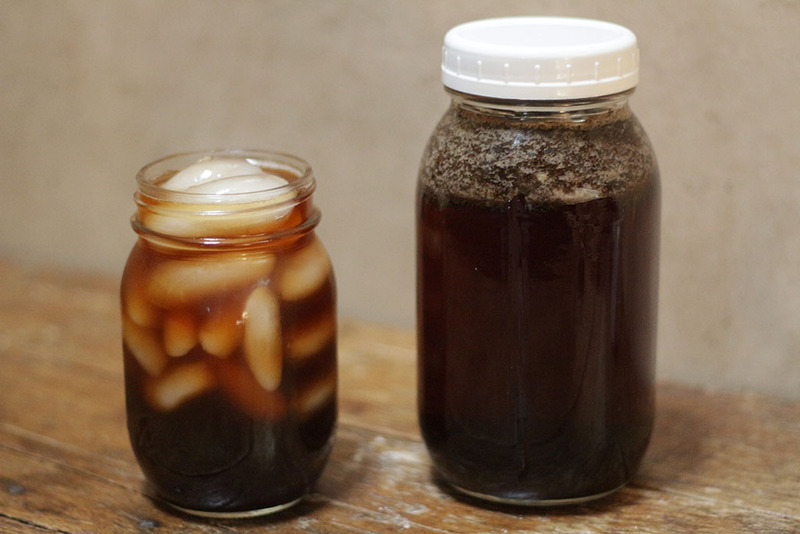 You'll have extra so you can store it in the fridge and have delicious iced coffee in a snap. 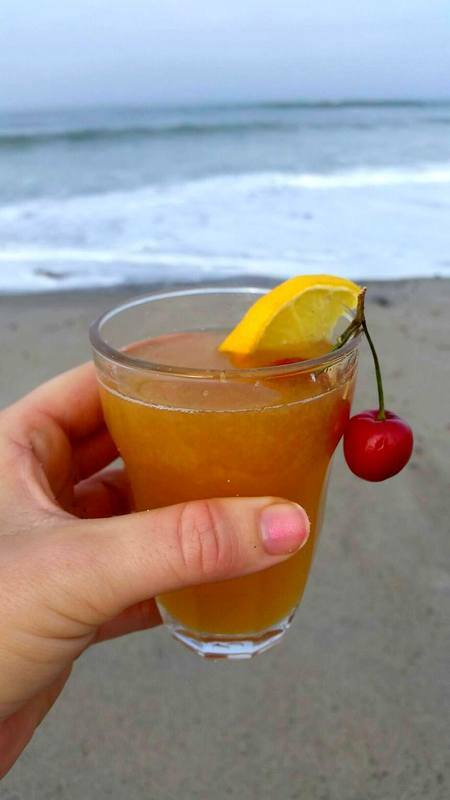 This is a wonderful recipe (Ginger Shot) I got from "The Juice Master," Jason Vale. He talks about how it got rid of his hay fever so I tried it and it works wonders when pollen is everywhere and your immune system needs a boost. 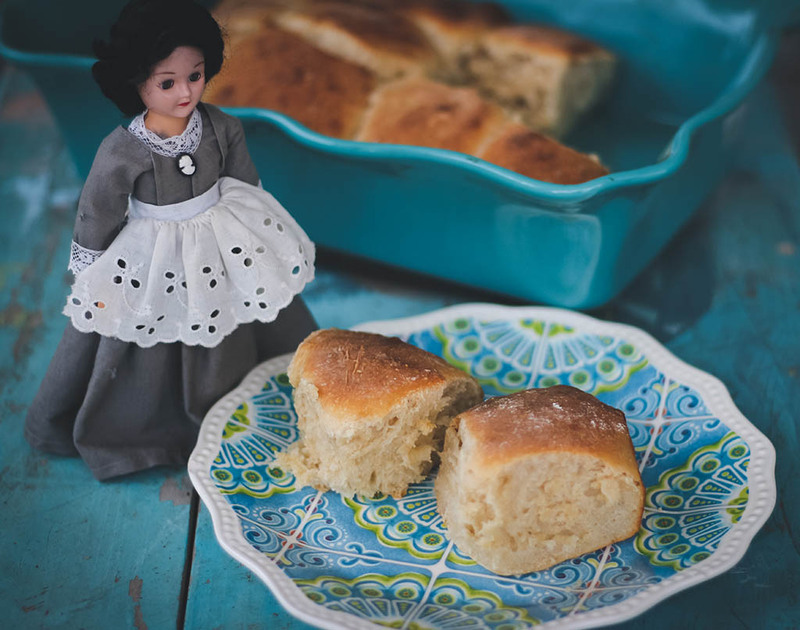 I love this recipe and use it often. Apples are rich in quercetin, a flavonoid with anti-inflammatory properties. In a study done in Crete, the study researchers found that people whose diets incorporated apples as a staple had greater protection against both allergies and asthma. 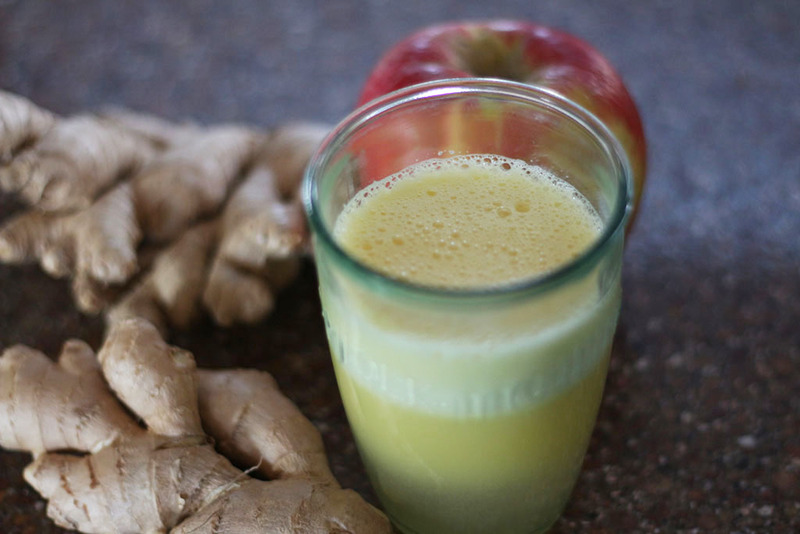 This is a delicious and easy soda to make combining apples and ginger. 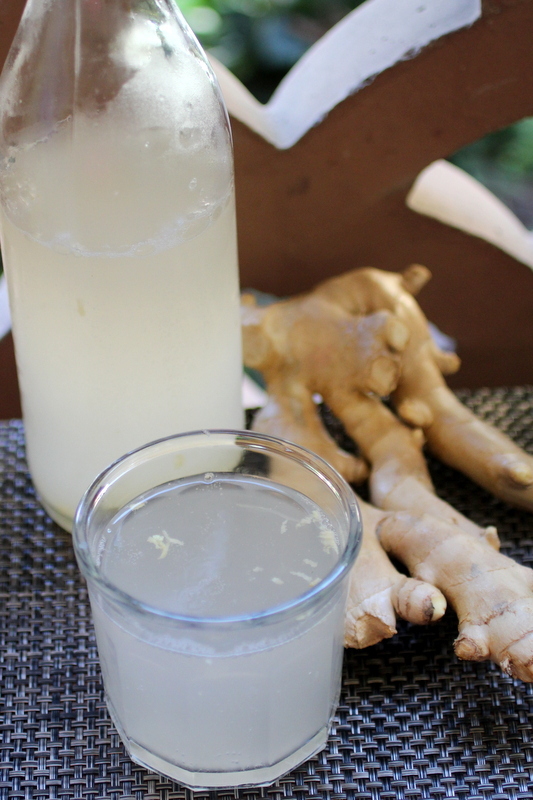 Ginger has huge anti inflammatory properties that can help you greatly with a myriad of problems! 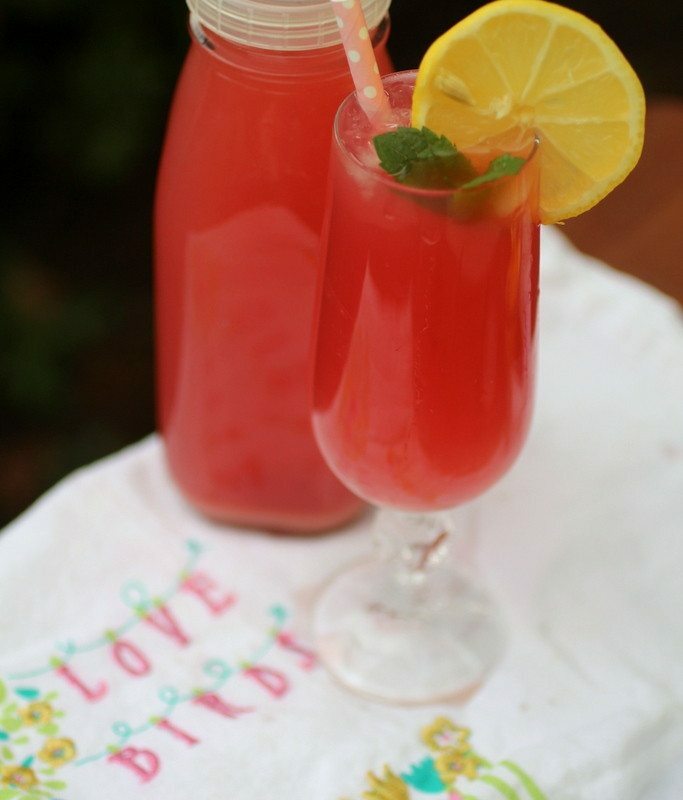 You can make this soda in a couple of days and your kids will love it! 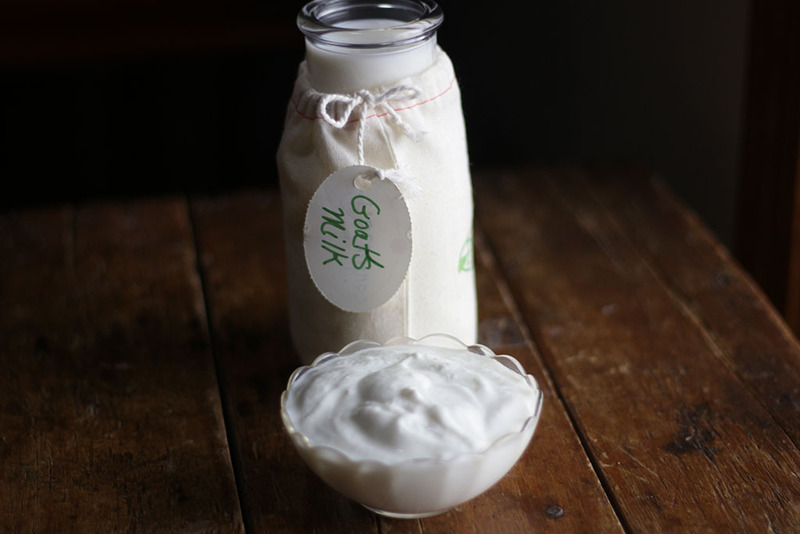 Goat's milk kefir will not thicken like regular cow's milk but rather stay creamy and quite delicious. 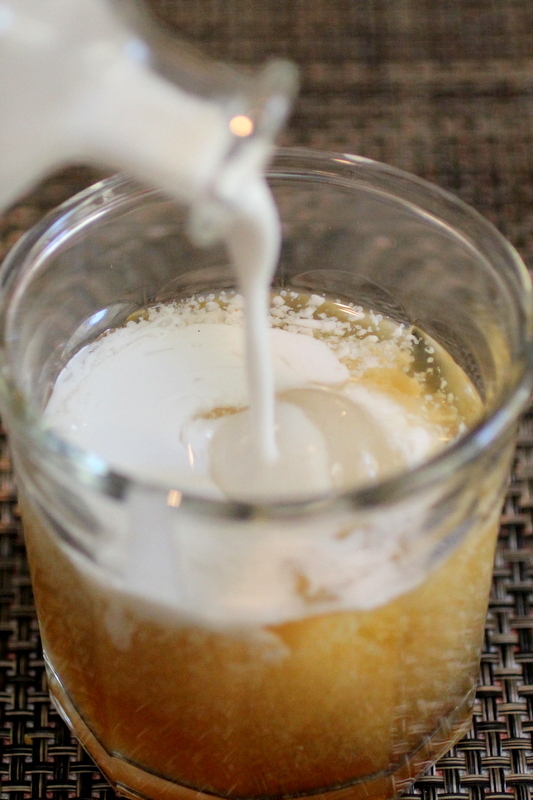 Goat milk kefir is different from regular cow milk kefir. It will not thicken like cow milk but rather stays creamy and is quite delicious. This soup has lots of prebiotics and probiotics which will be a feast for the microbes that call you home. 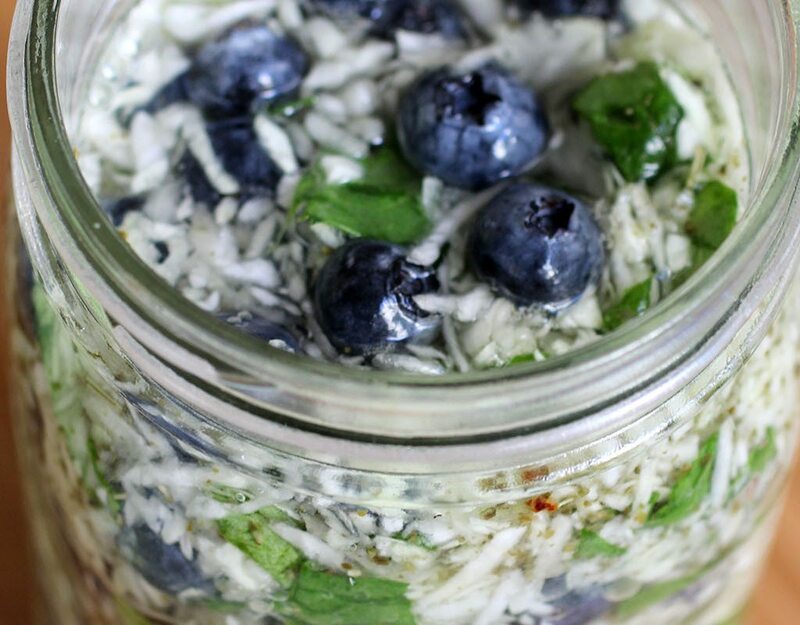 It's comforting, yummy, and packed with nutrients that your body can use to make you into a new you! 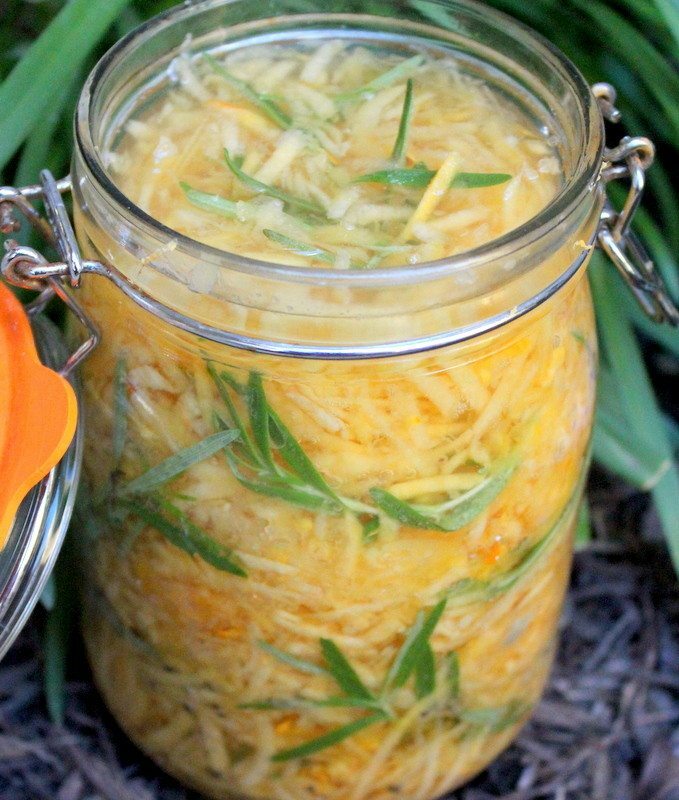 Remember you are what you eat and soup can be probiotic too! Probiotic soup for the soul. 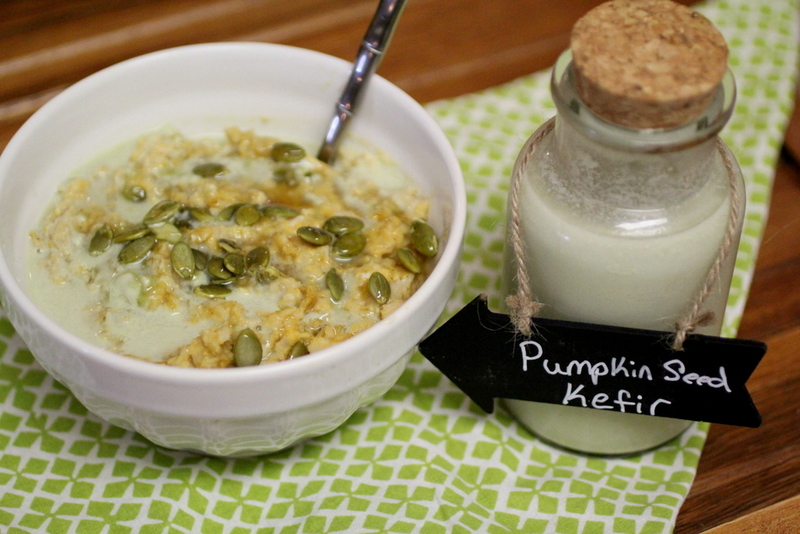 Talk about yummy warm comforting oatmeal with a probiotic topping... this fits the bill! 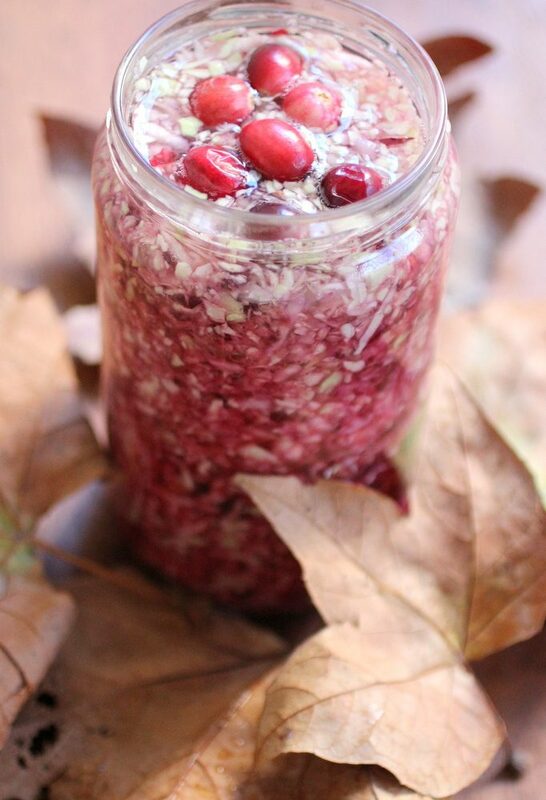 Oatmeal is food for your microbes so this is a prebiotic and a probiotic meal. The perfect way to reset your microbiome — in one meal. 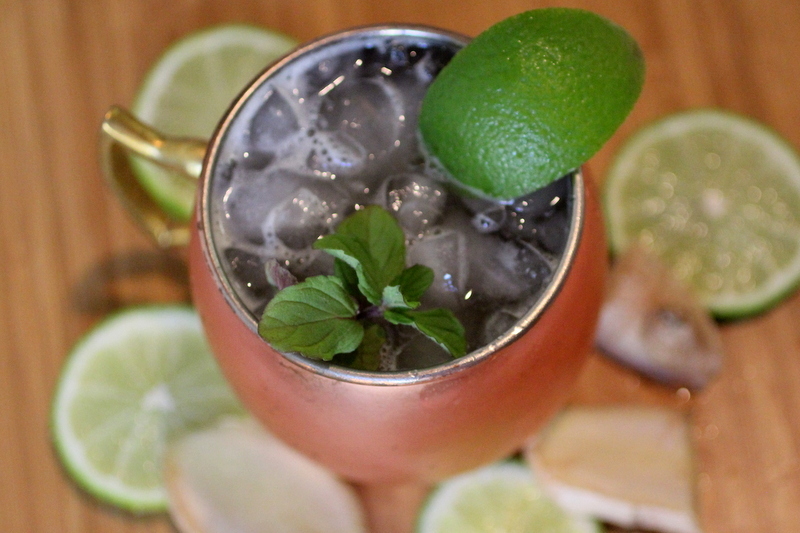 This recipe was inspired by my dad, Don, who loves peppermint. 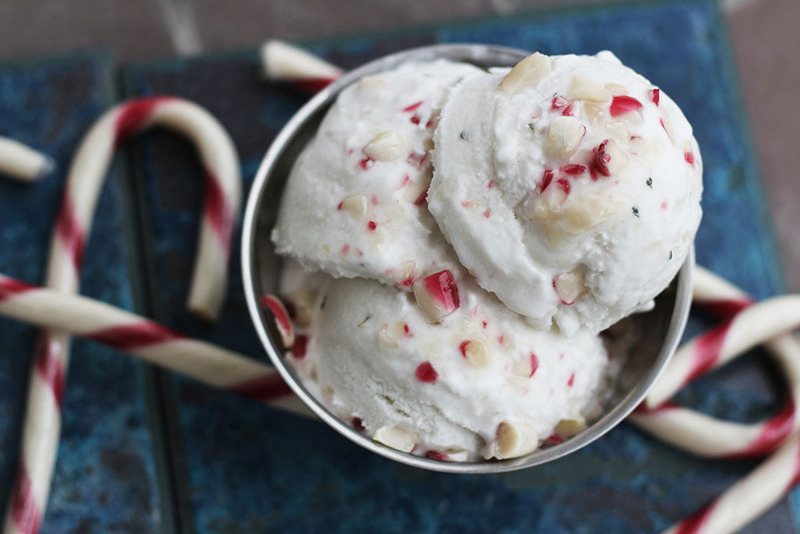 We had peppermint ice cream every year on Christmas and this version is made with kefir. It helps me still feel his spirit and especially at Christmas time. It's love made visible. 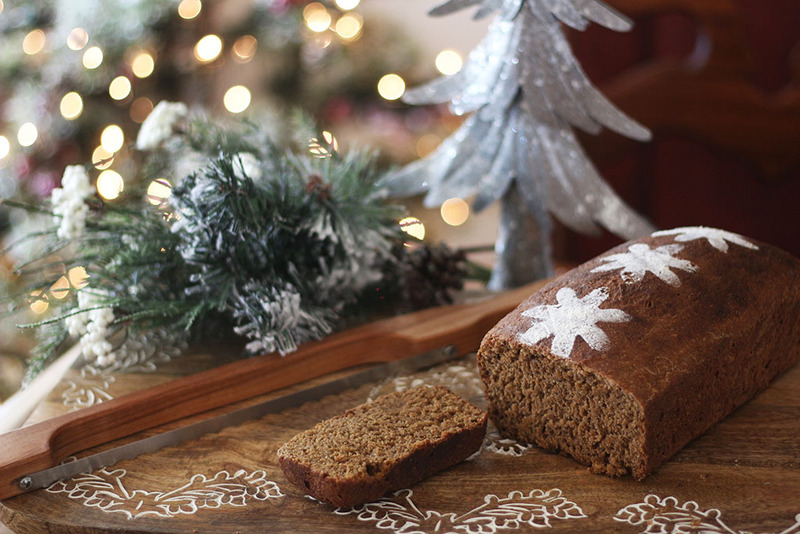 The flavor of gingerbread comes from blackstrap molasses, ginger and spices. 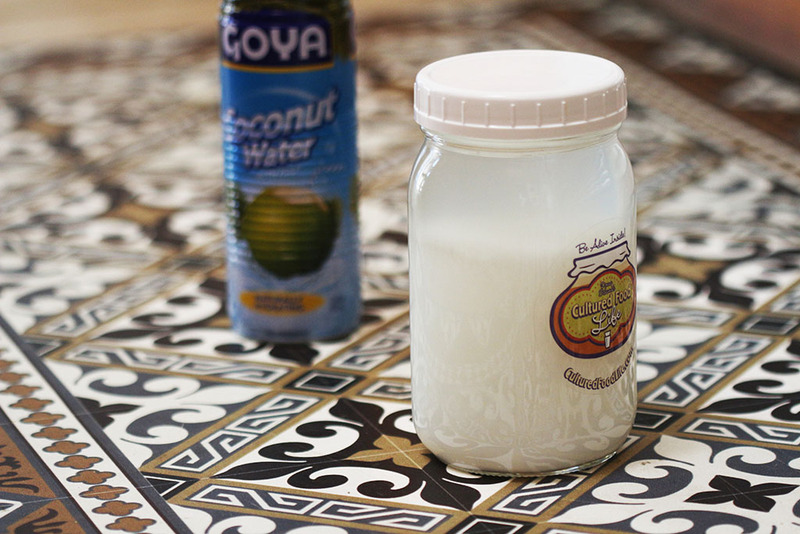 This water kefir doesn't disappoint. Always use blackstrap molasses as opposed to regular molasses as it supplies minerals. 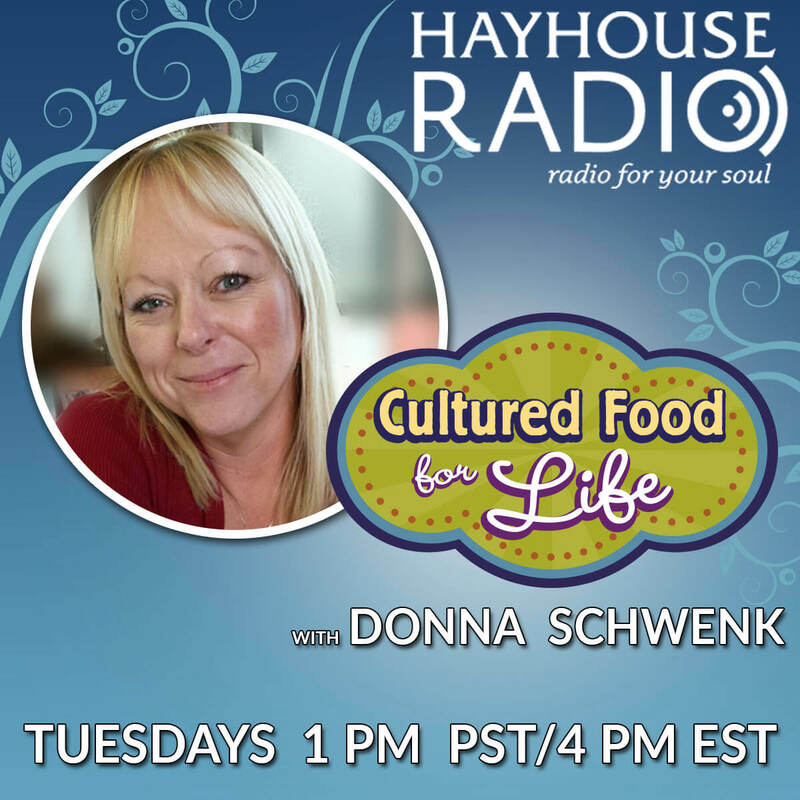 Cultures and your body love minerals. 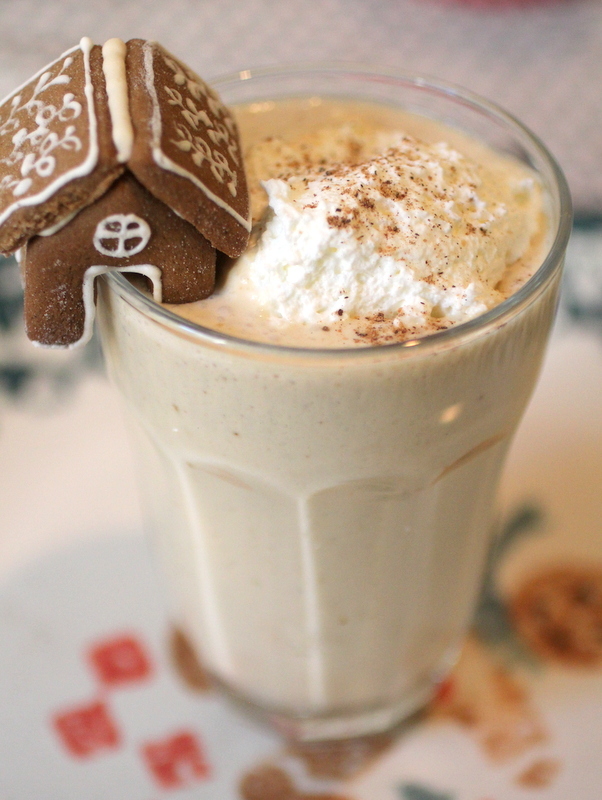 Black Strap Molasses is loaded with minerals and gives some of that wonderful classic gingerbread taste to this festive smoothie! 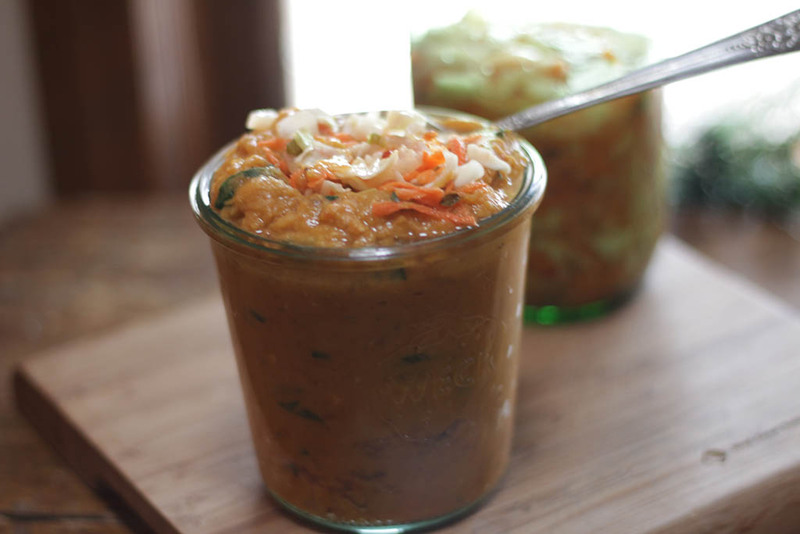 We named this Thank You Kraut because it is perfect for Thanksgiving. 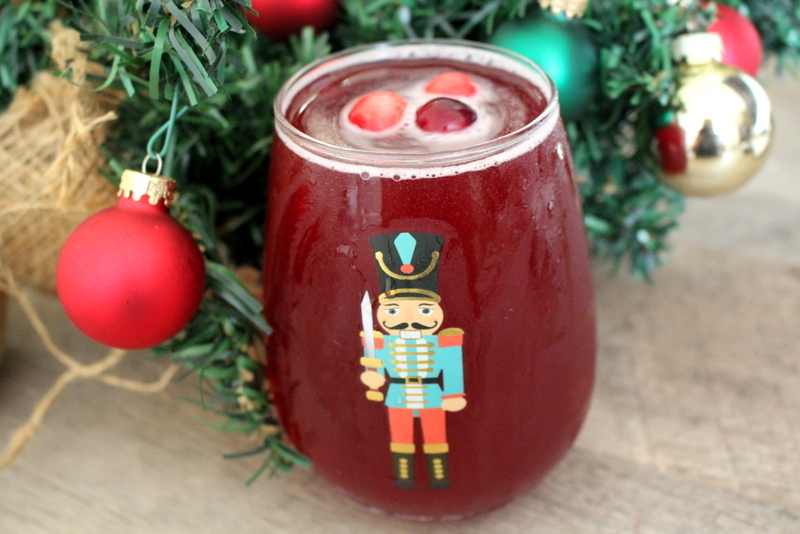 It’s loaded with cranberries and cranberry juice, which give it quite a unique flavor. 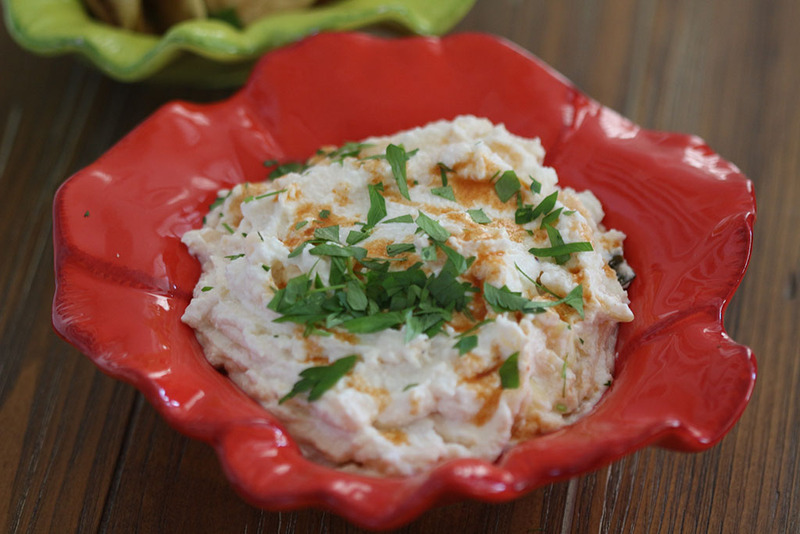 You can serve it as a side dish or with crackers or a veggie platter. Or, if you’re like me, you can pile it on top of leftover turkey and sourdough to make a delicious probiotic sandwich. You’ll be thankful you did. 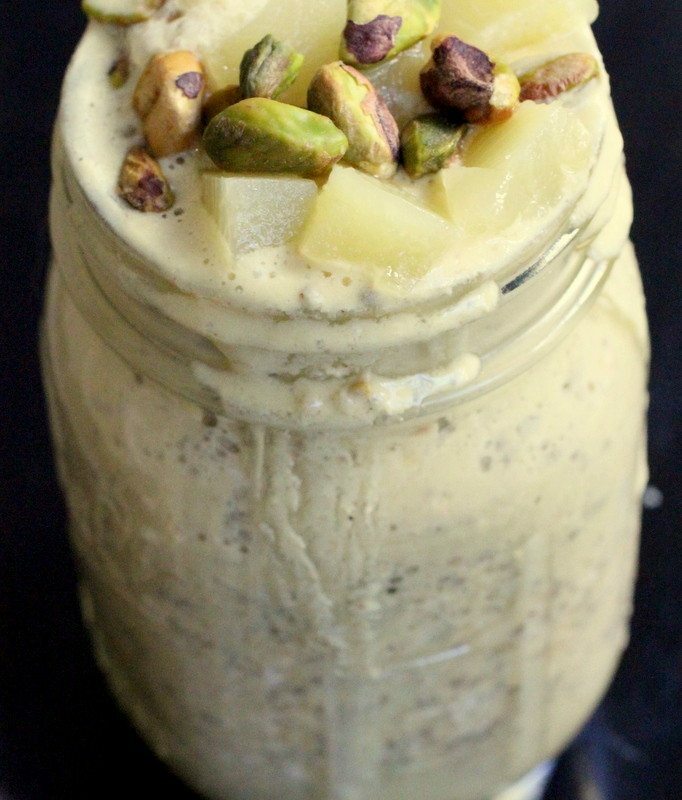 One of my favorite smoothies. 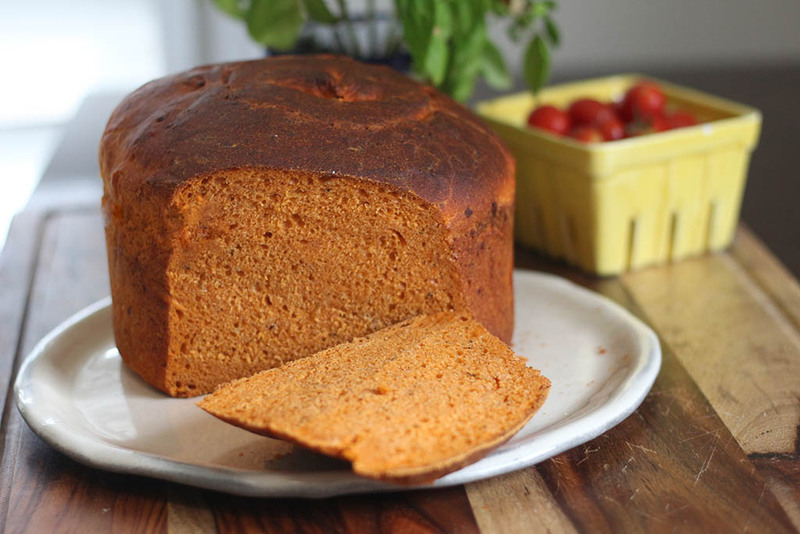 It has a secret ingredient (chai tea bag) that gives it loads of flavor. Don't forget the topping. 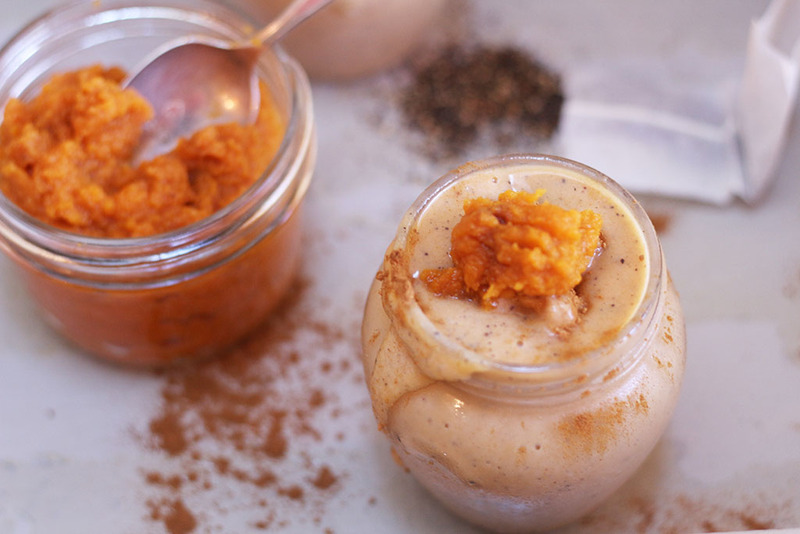 It will have you eating more pumpkin because of the deliciousness. 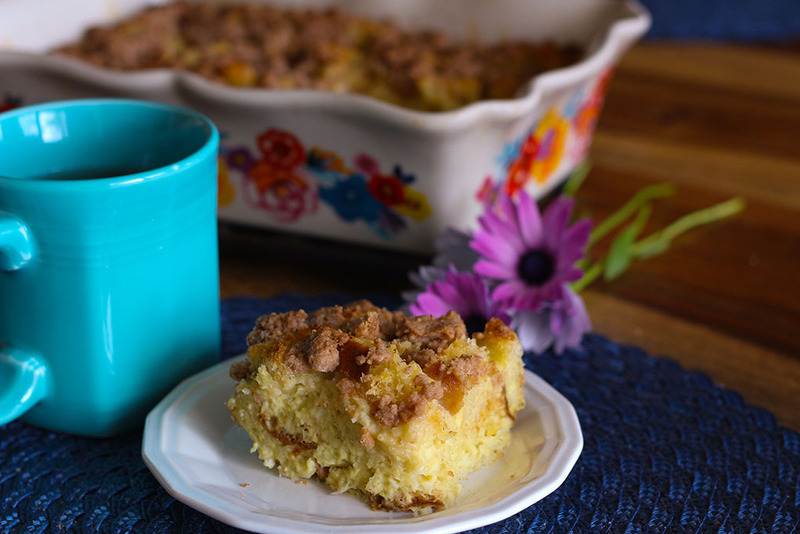 I like to make this recipe during apple season when apples are abundant and I will be collecting a lot of apple scraps from baking and juicing! You will fool even yourself with this one! 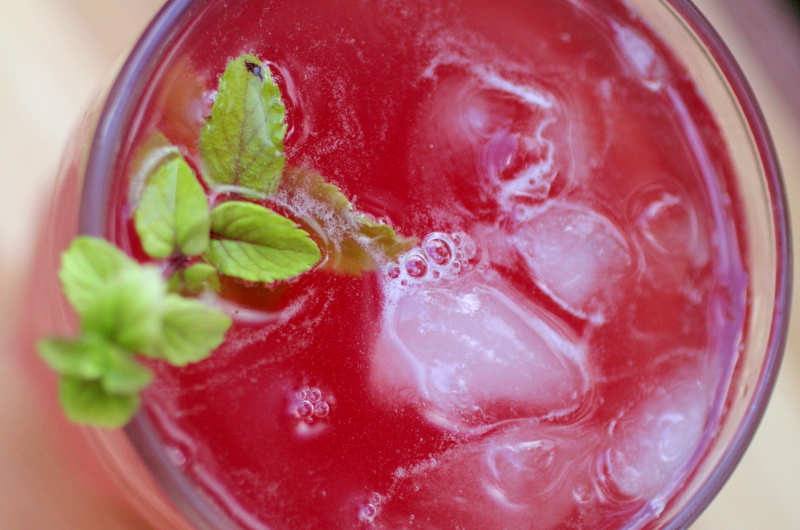 Use your extra SCOBYS and lots of ice and you have a cool summer treat. 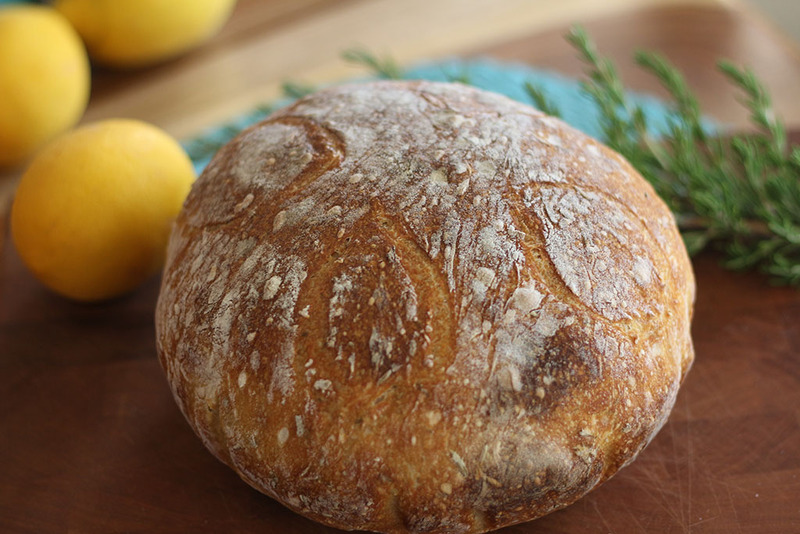 It's a unique flavor and texture when mixed with fruit and herbs. 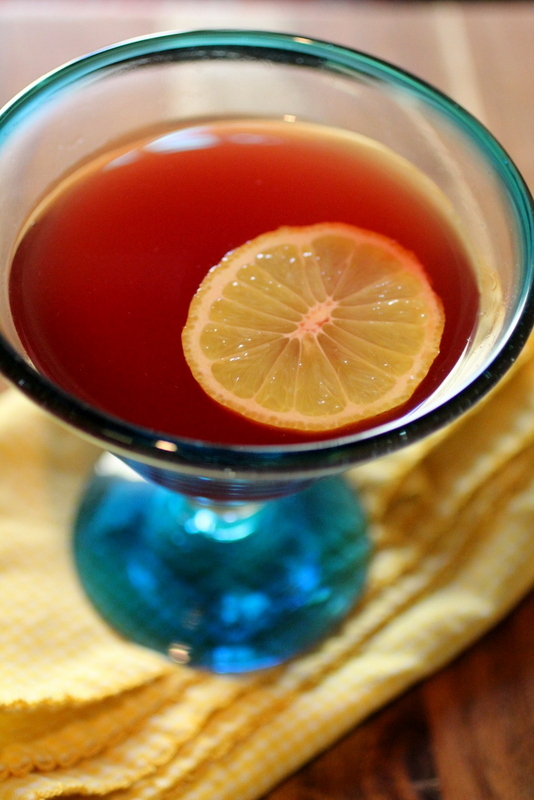 You'll want to use all your SCOBYs to make sorbets. 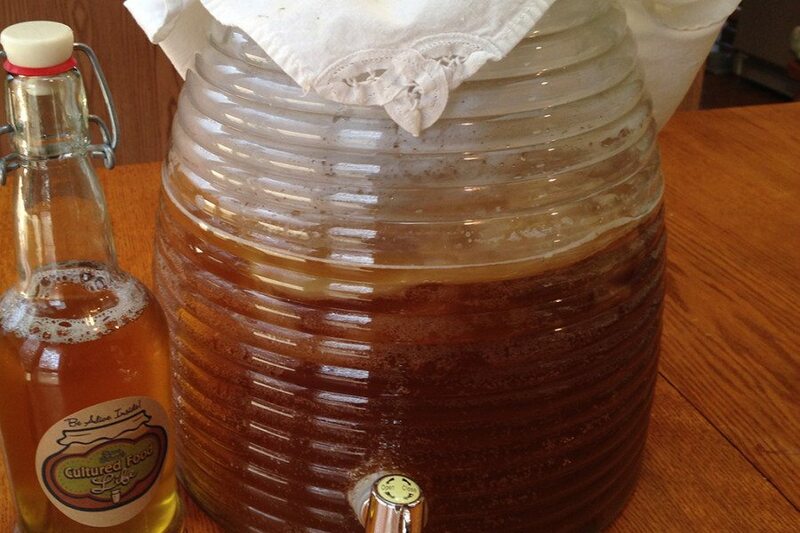 This is an easy way to store your extra SCOBYs and have some starter tea on hand as well! 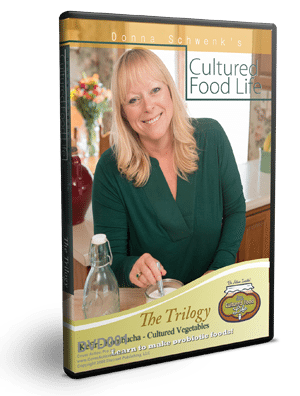 This is a wonderful combination of prebiotics and probiotics. 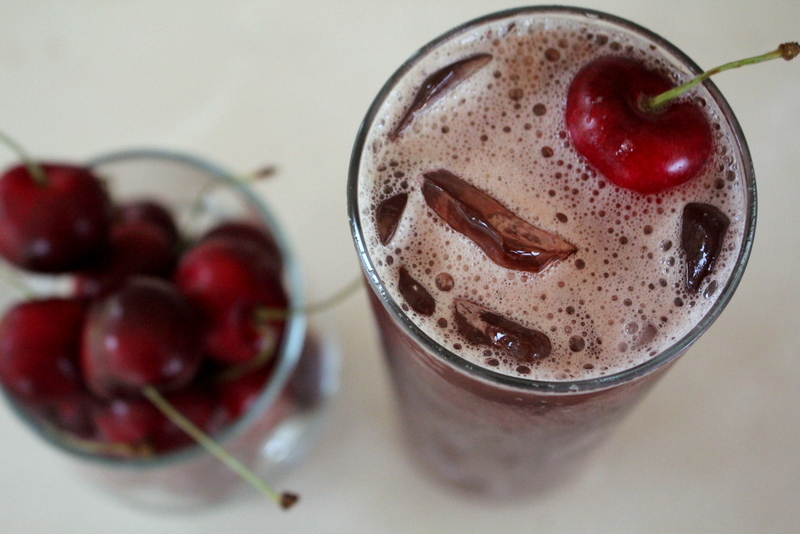 You can use tart dried cherries or dried blueberries- or both! It only takes a few minutes to mix them together for a fast treat! Don't be afraid, scobys are good for you! Maci was eating some homemade applesauce one day and thought . . . I could put a SCOBY in this. So, she did! 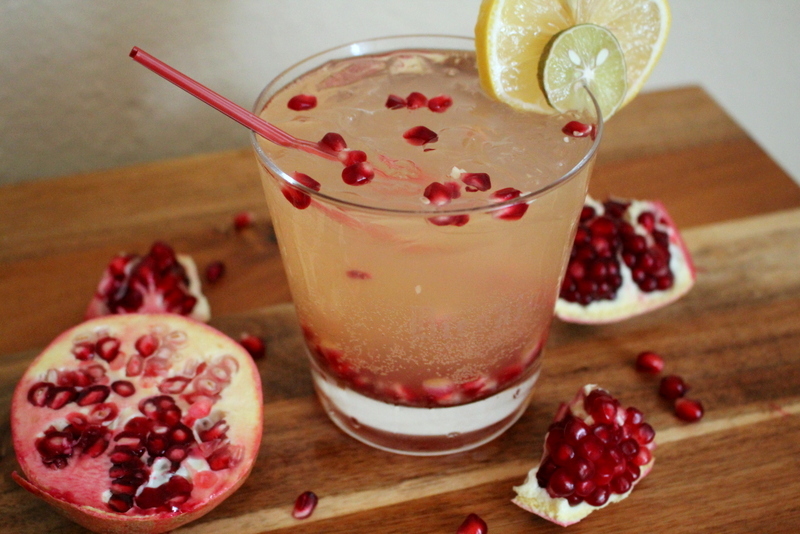 It’s tart, it’s tangy and it's raw! 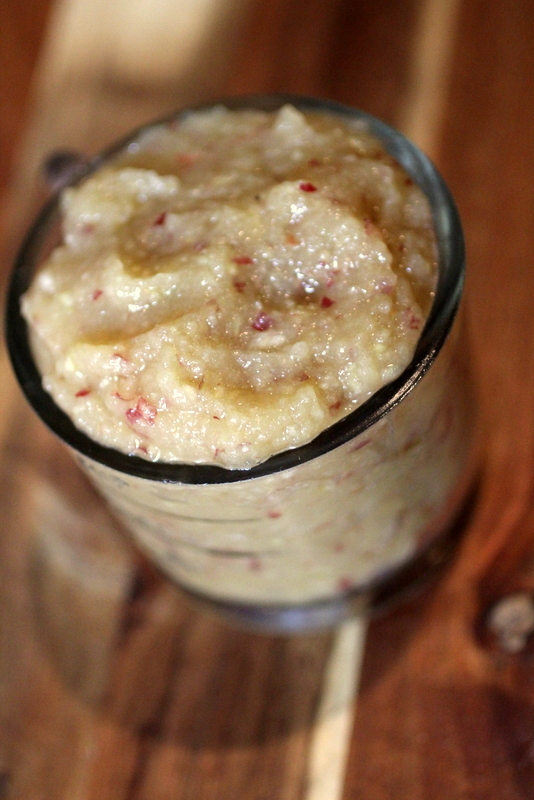 You can’t tell whatsoever that you’re getting a bunch of insoluble fiber in your applesauce. And remember, apples are prebiotics, too, so you’re getting pro- and prebiotics to change your gut in a spectacular way! 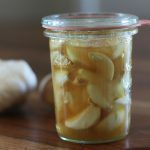 This one is loaded with fermented garlic and SCOBYs. 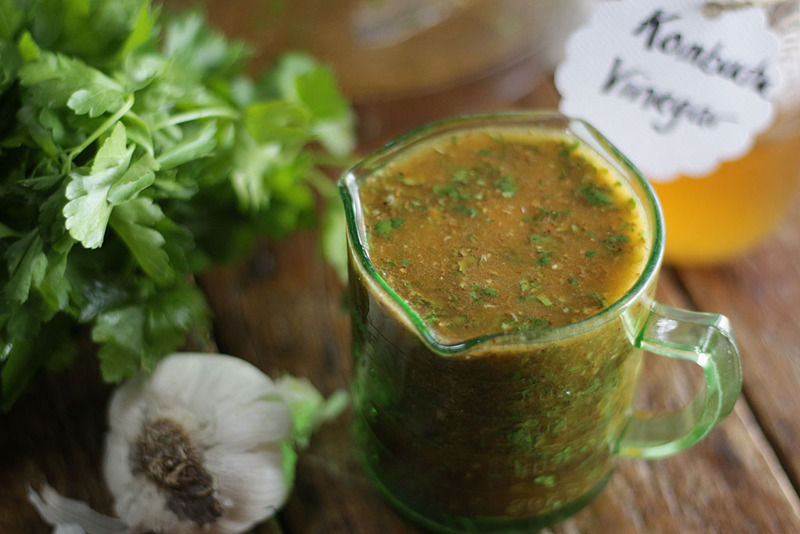 This dressing is a powerful detoxifier and a delight to the tastebuds! 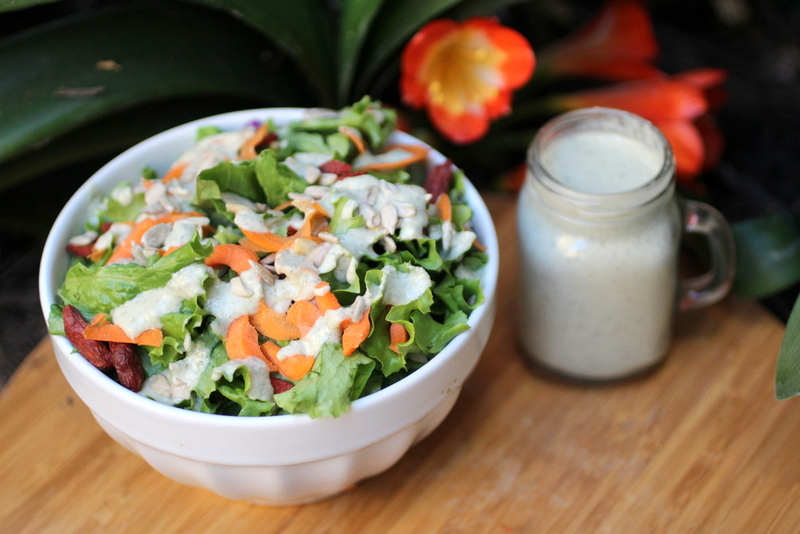 This is a powerhouse dressing! 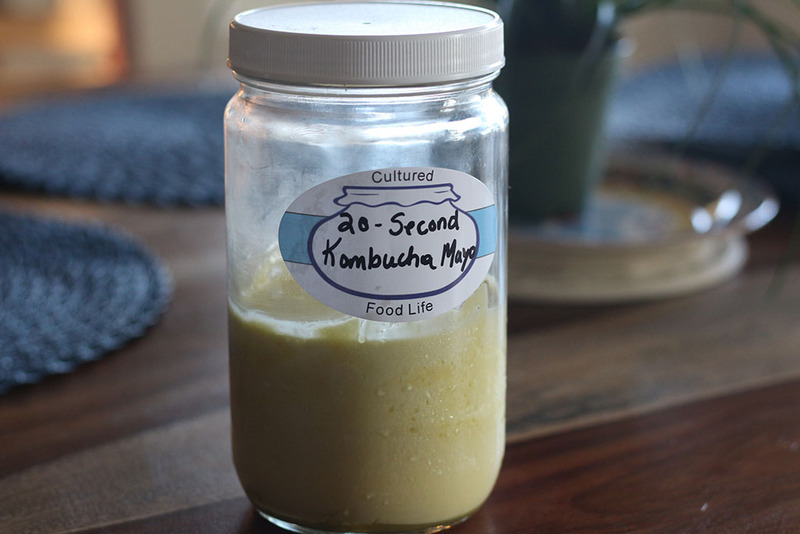 Just another sneaky way to add extra probiotics into your life and use up that ever growing mound of Kombucha Scobys. 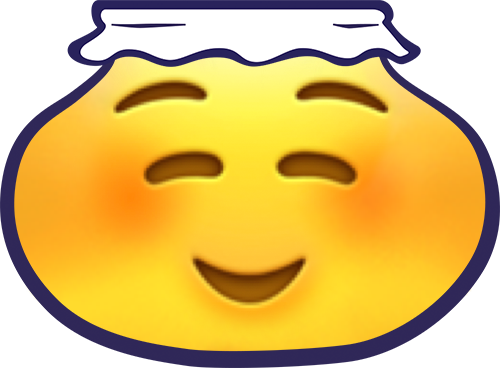 Don't be afraid of eating your scobys. They are made of cellulose, or long strands of linked glucose, which we know more commonly as fiber. They aids in waste removal, including metabolic waste normally excreted in bile. They also have no calories. 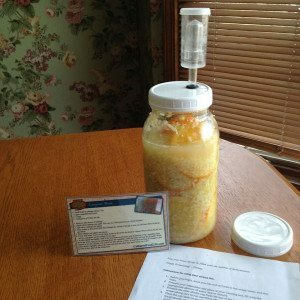 Check out this blog to find More ways to use your scobys. This is the very first weird experiment my daughter Maci ever made with a SCOBY. I thought she had lost her mind until I tried it. 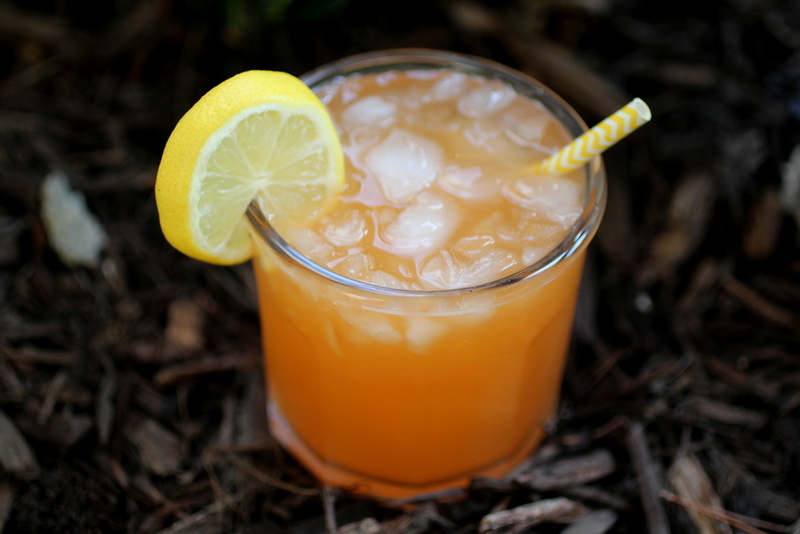 You’ll be surprised how good this is and nobody will ever know it’s made with SCOBYs. 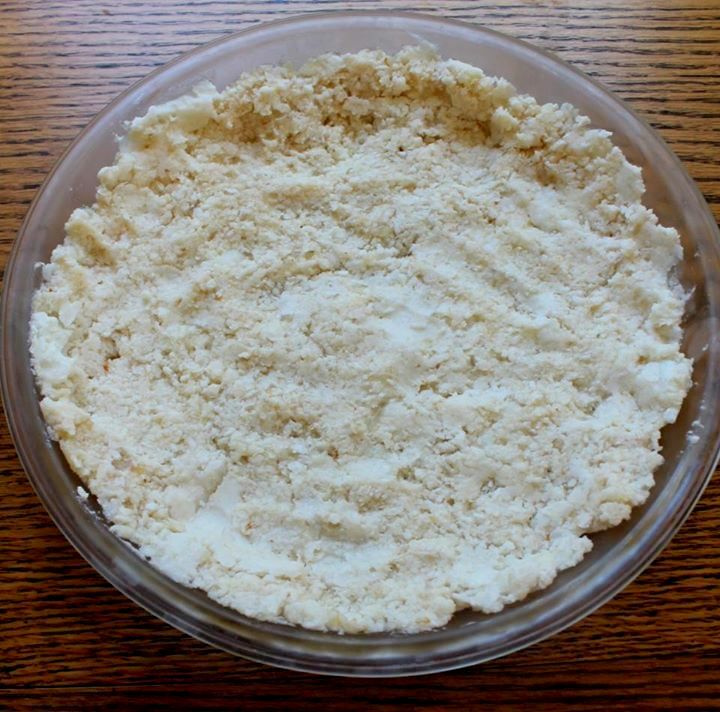 Maci loves this pie crust and uses it often. 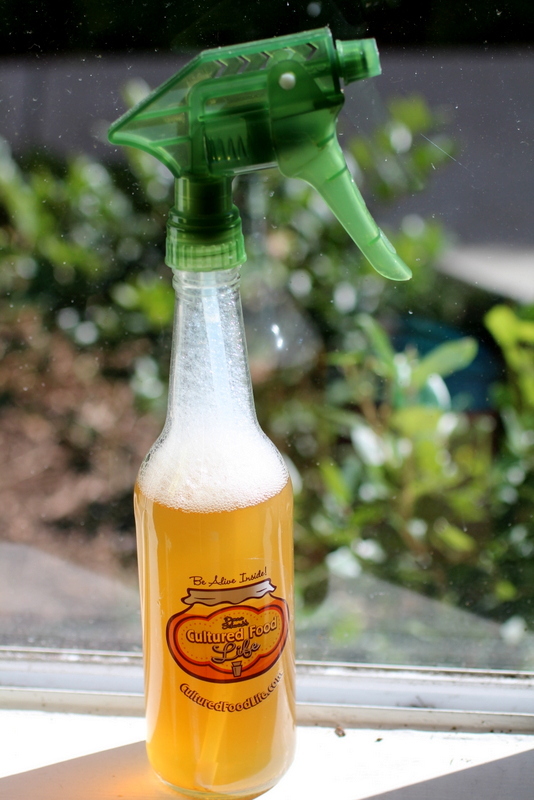 I got the idea for this from the book "Kombucha Revolution." They made a wonderful salt scrub using dehydrated SCOBYs for pedicure purposes. 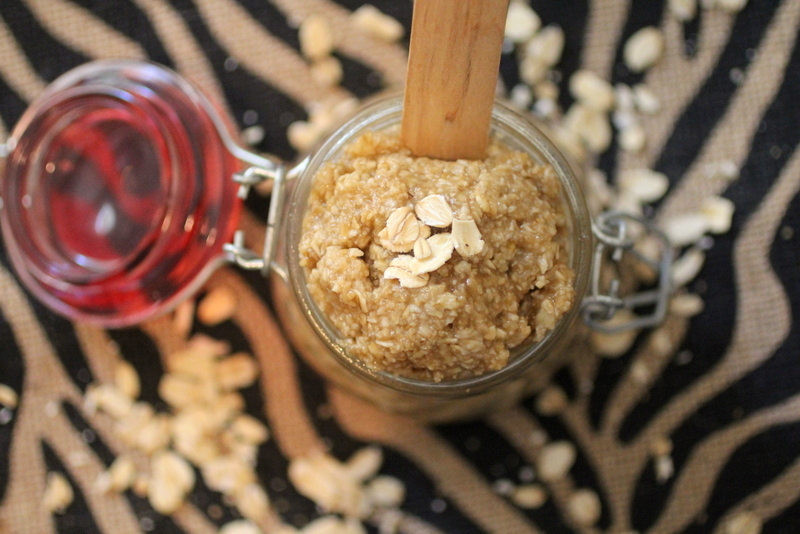 This Brown Sugar SCOBY Scrub is made with a raw live SCOBY and will delight your senses and your skin! You can make any of your favorite smoothie recipes and add 1/4 cup of SCOBY purée (or more) to it for a thicker, slightly tangy twist! 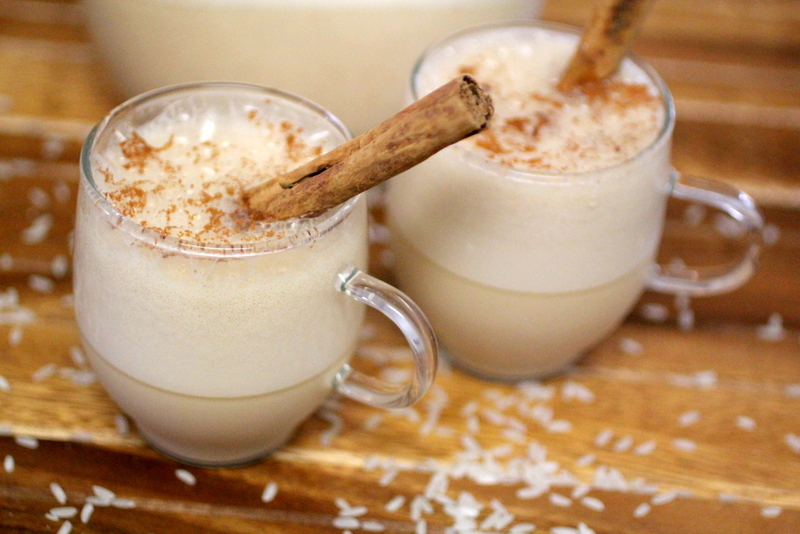 Works great with kefir smoothies, too! These are refined sugar free, blessed with probiotics from your SCOBY, and joined with the healing powers of coconut oil! 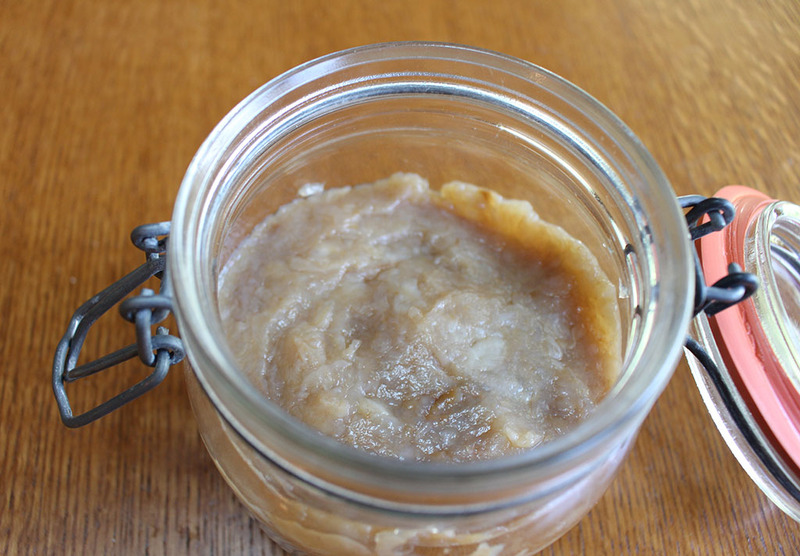 This scoby puree is great to have on hand. 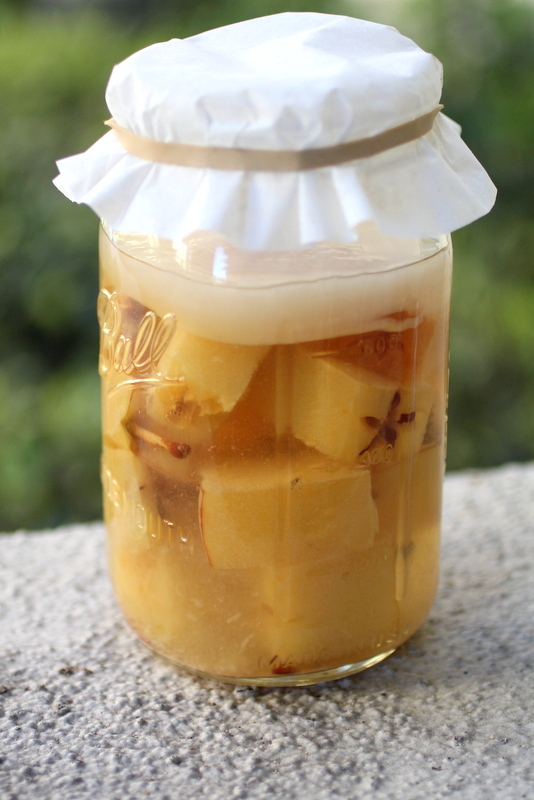 Once a month blend all your scobys up this way and store them in an airtight container in the fridge. Then you always have them on hand to add to recipes, smoothies, and more! 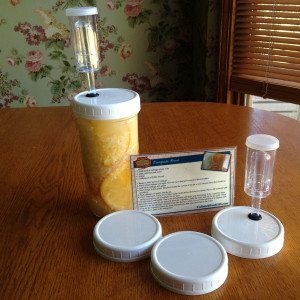 Check out all the things you can do with scobys on this blog by clicking these words. 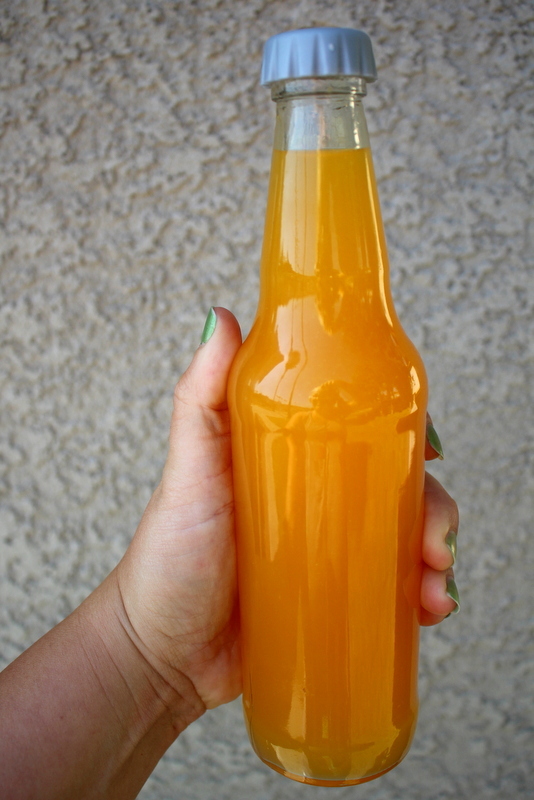 Traditional "Jun" is said to be a completely different culture than kombucha. Jun is made with honey and green tea. 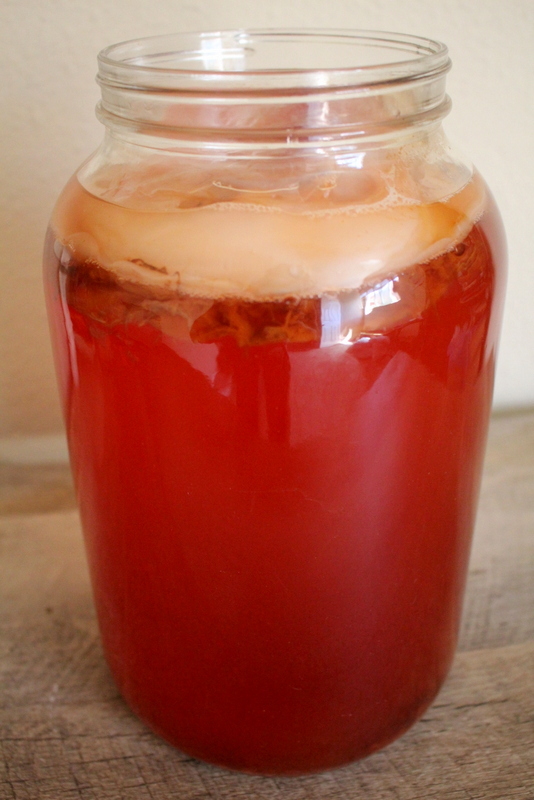 There are some who believe it is just a hybrid of the traditional kombucha SCOBY. 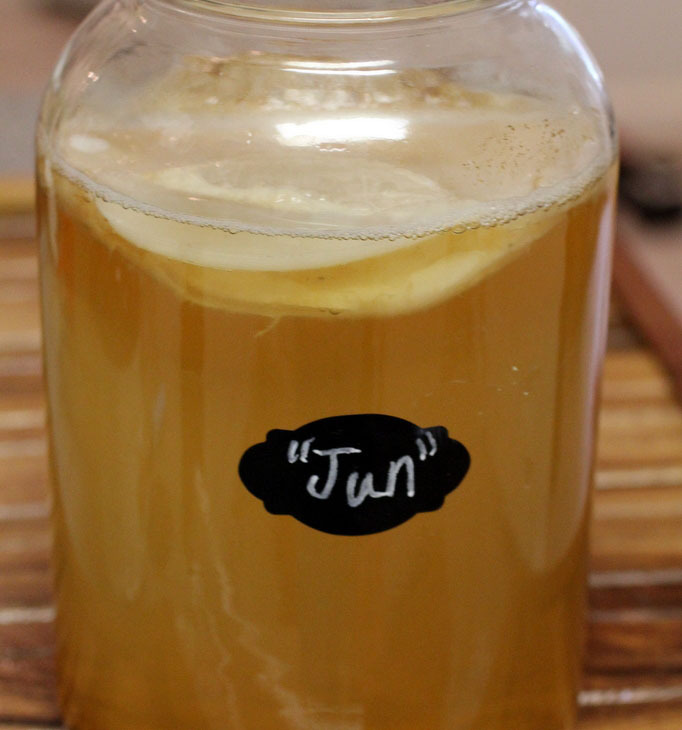 In any case, this is our kombucha version of Jun and to learn more check out this blog: Jun! 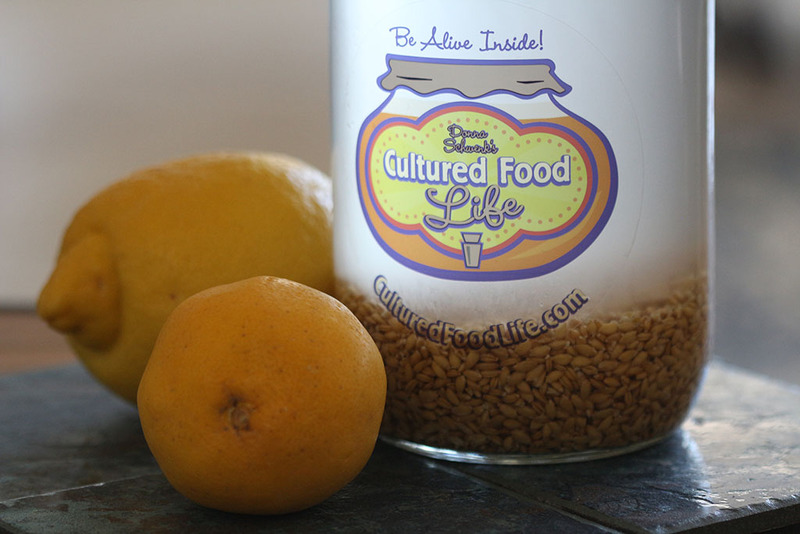 New Culture or Honey Kombucha Hybrid? 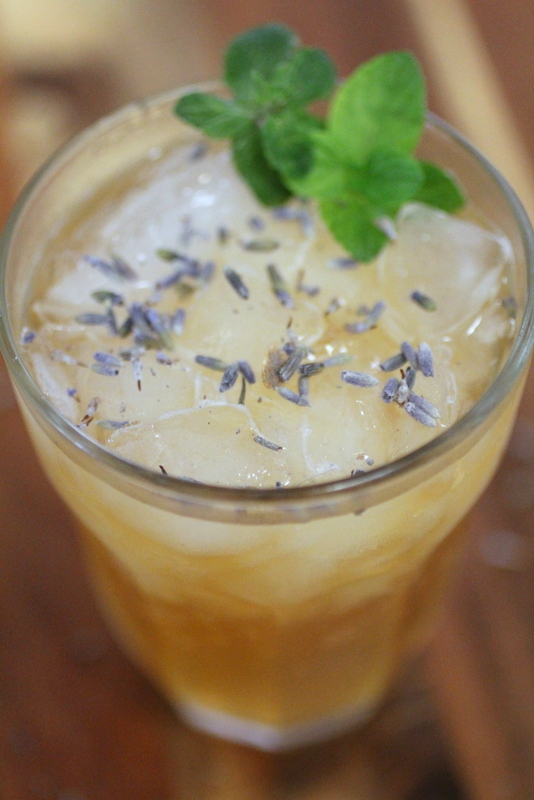 Kombucha + Water Kefir Mai Tai Mocktail! 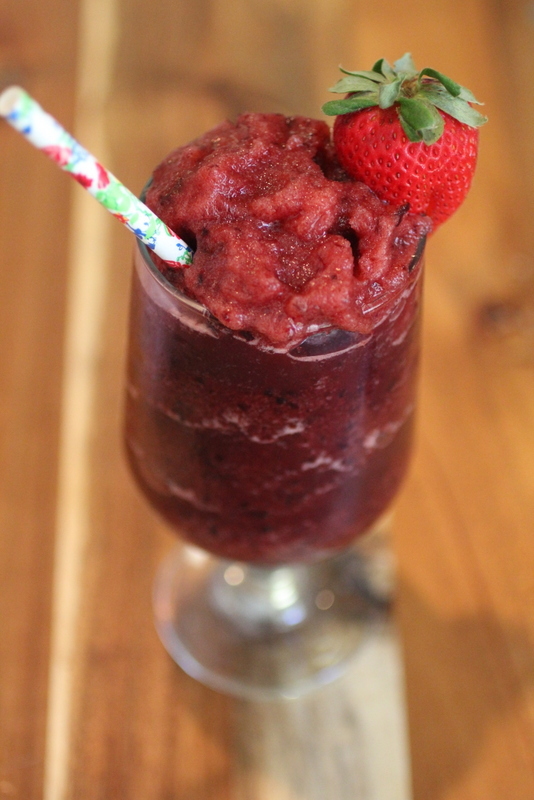 Frozen Cherry Kefir Soda Daquiri Mocktail! 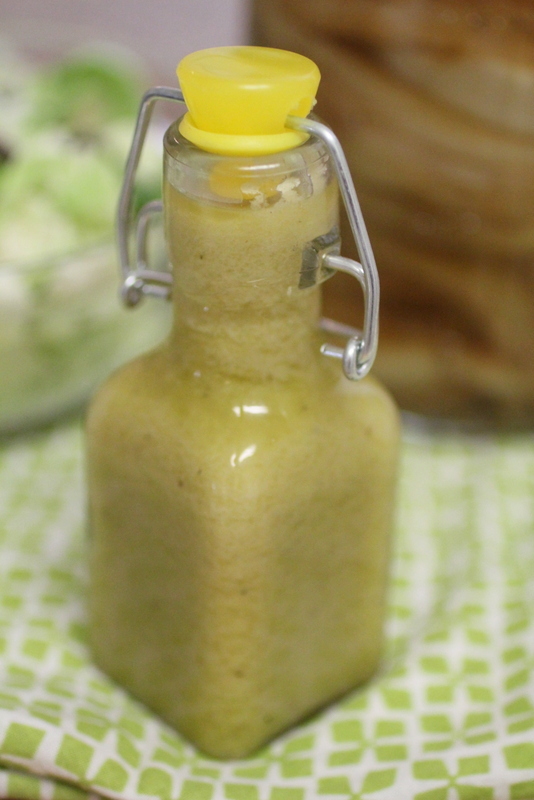 This super yummy dressing is one I use on my kale salad, but it's also good on any salad to add a probiotic dressing! 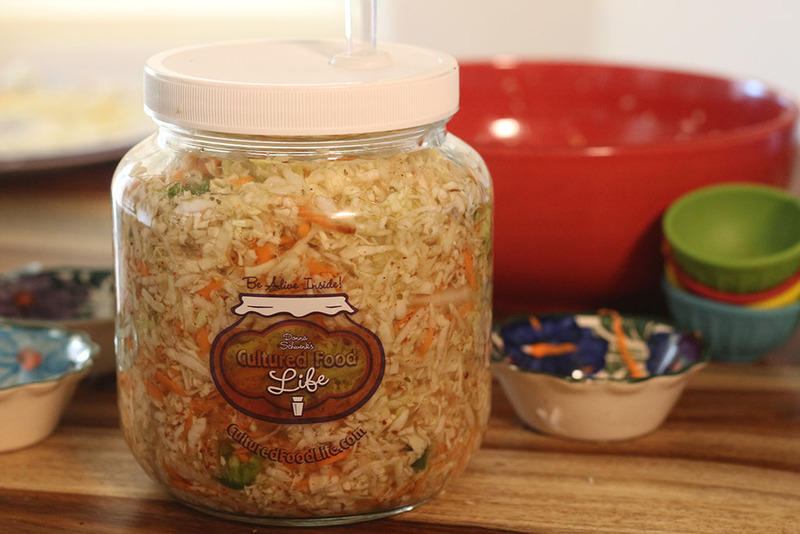 It has kefir cheese and kombucha and makes a wonderful dressing that stays preserved in your fridge with billions of microbes. Kimchi is an ancient dish that Koreans have been making for centuries. In fact, it is their national dish, and I’m sure that every family has their own recipe. 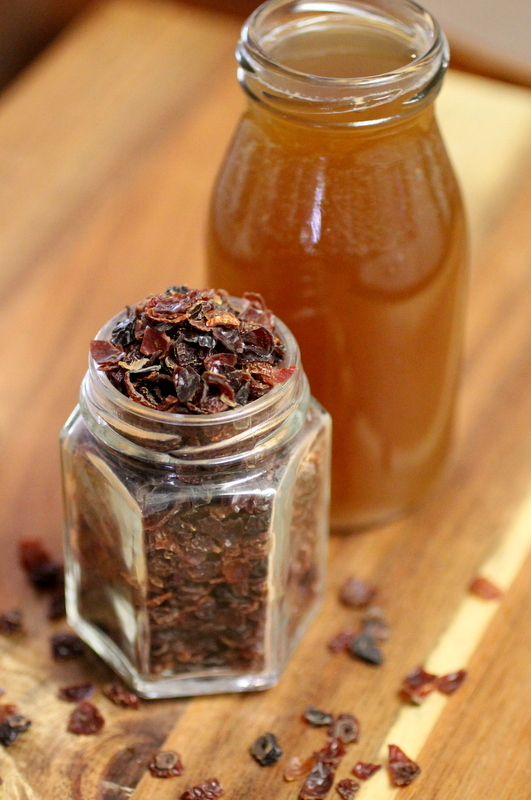 My recipe is not as spicy as some, but you can adjust the seasonings to suit your taste. 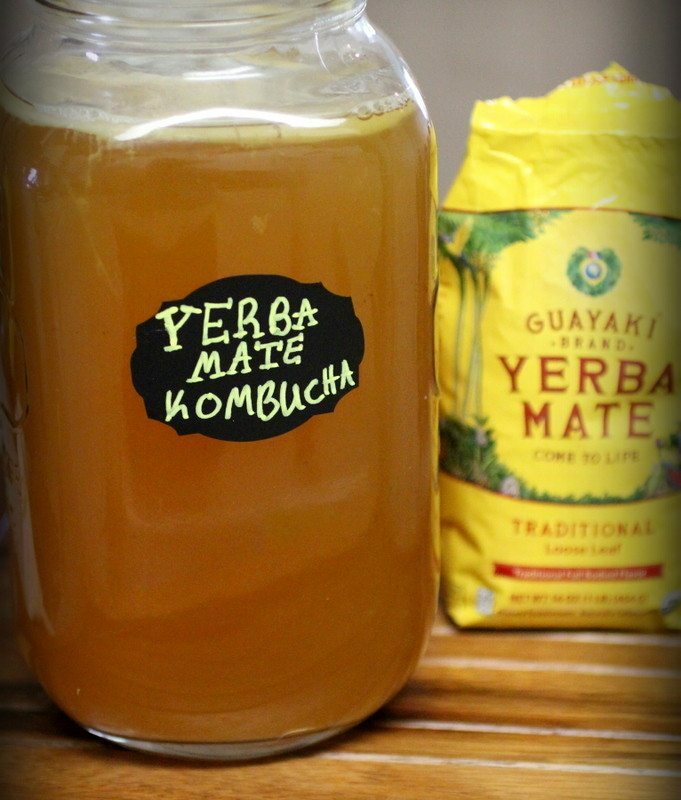 There are many health benefits to yerba mate tea and it is revered in the tea world as an energy booster. Many who are sensitive to caffeine say that even though yerba mate is high in caffeine they don't get the side effects like they might from coffee. It is an acquired taste for some. 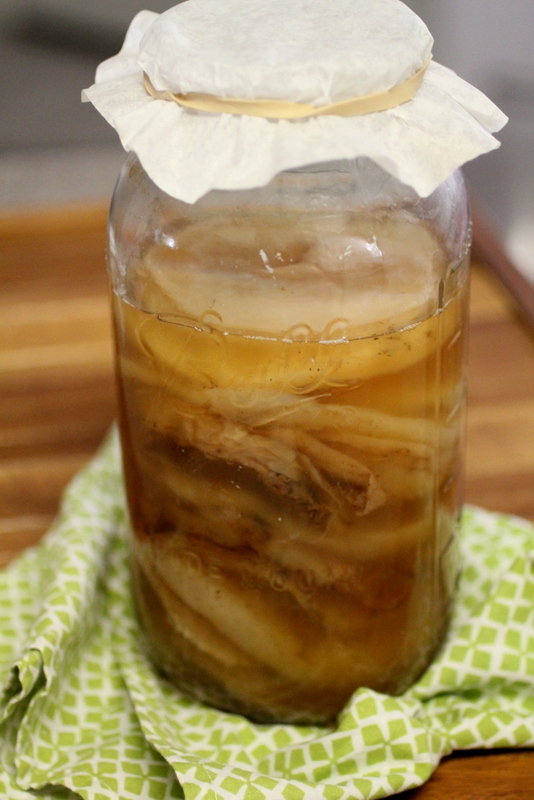 So if you are nervous about this recipe, make a half batch and cut every ingredient in half (except the SCOBY). 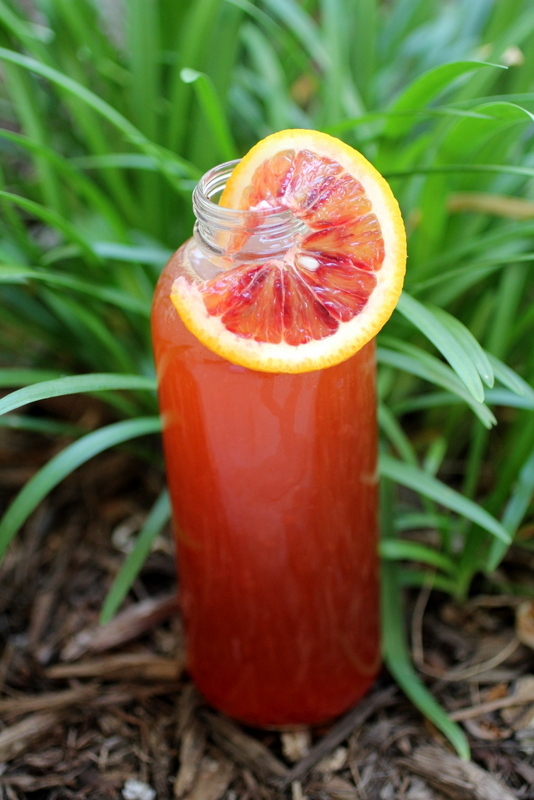 Try this fun tea as a new base for your already delicious kombucha! 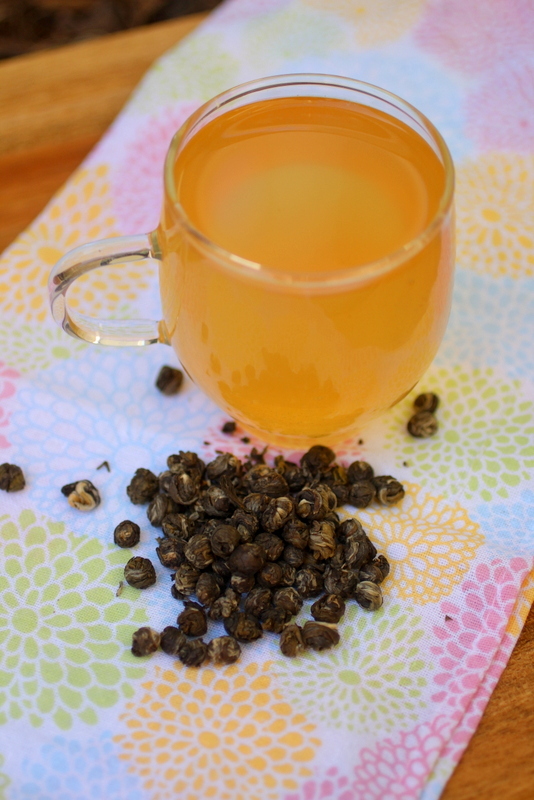 Jasmine pearls create a lovely floral flavor with your brew. 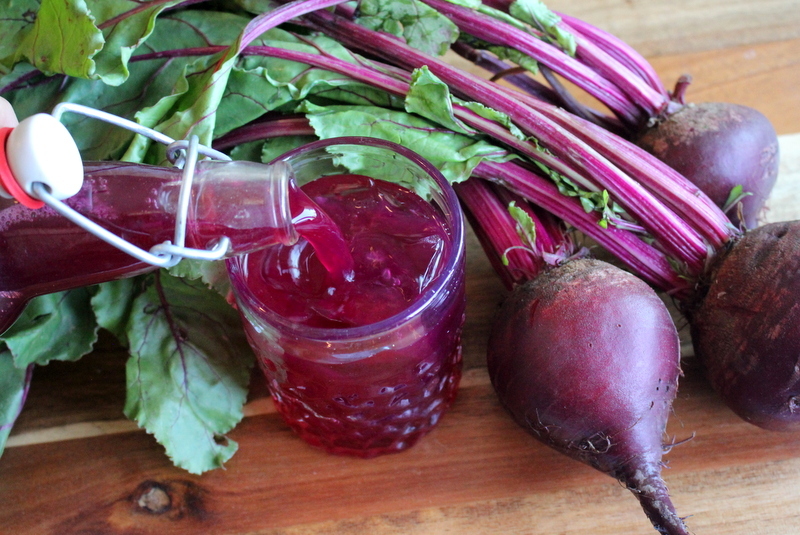 We like it so much we rarely second ferment it! White Tea is a delicate tea and will create a very mildly sour tasting brew. 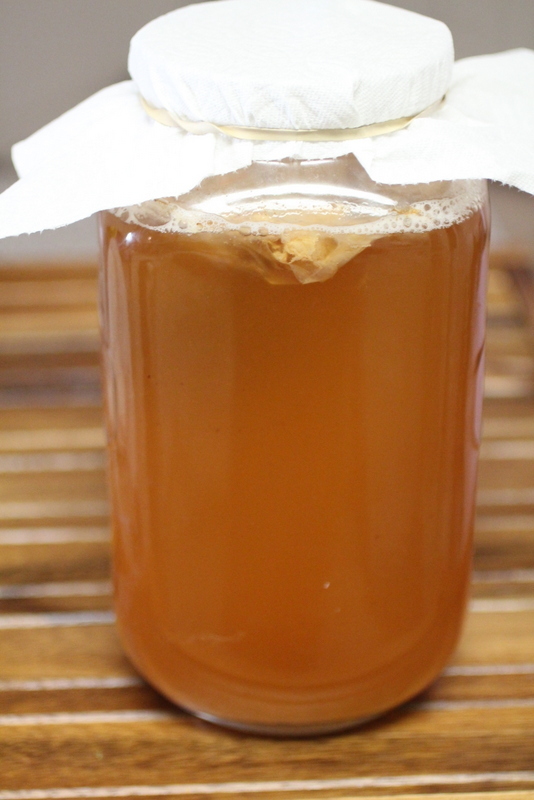 Although you normally only brew white tea a few minutes, make sure that when using it for kombucha you brew it for at least 10 minutes. This will ensure the appropriate amount of tannins are in the brew to produce a healthy SCOBY. 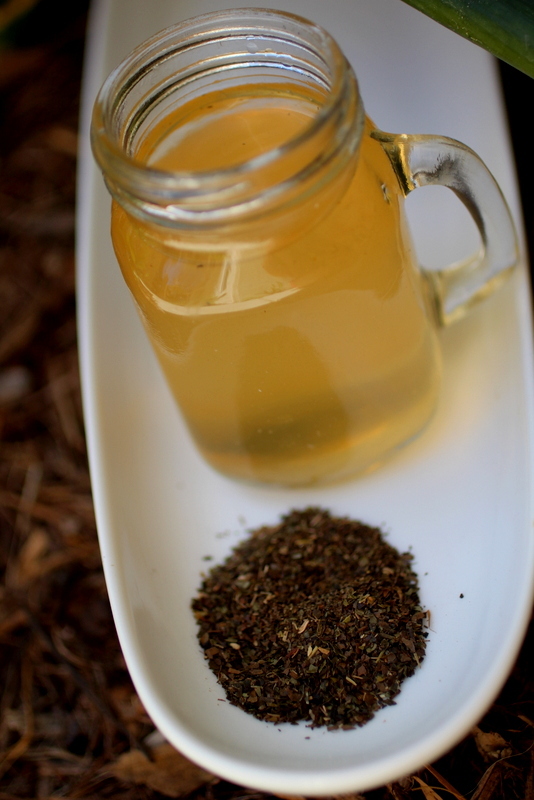 Rooibos tea is well known for it's health benefits. It is said to promote healthy digestion, assist with weight loss and build stronger bones to name a few. 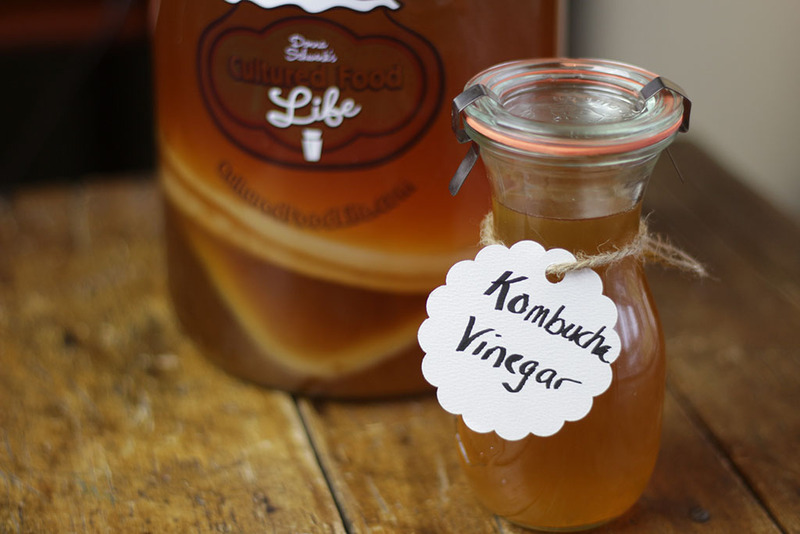 Turn it into kombucha and you get even greater benefits, plus it is naturally caffeine free! Green Tea Kombucha is light and wonderful. 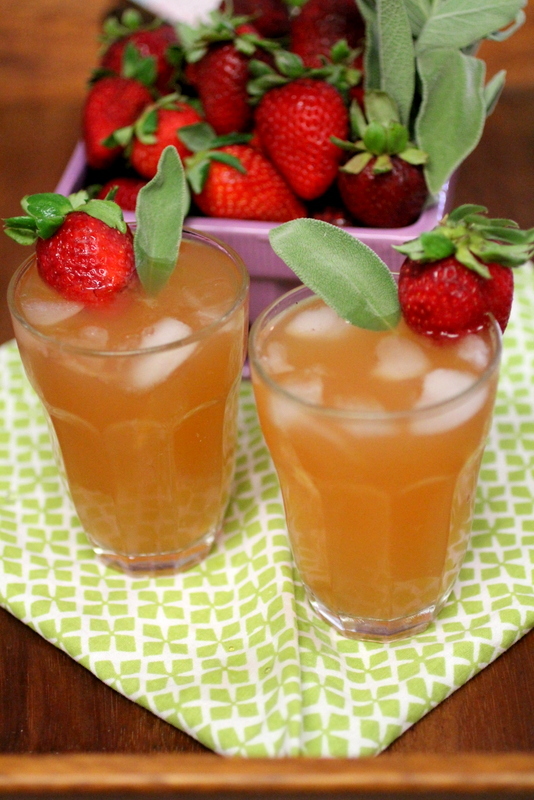 It has a milder flavor than black tea, is lighter in color and has less caffeine. Green Tea has been said to increase the metabolism and improve cardiovascular function as well. 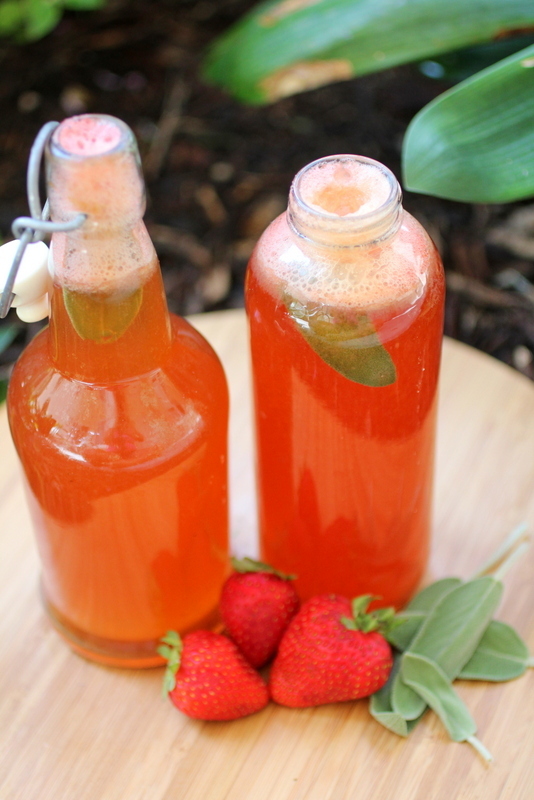 Green Tea Kombucha is even more beneficial with good yeasts and probiotics! Warning: May result in a happy dog! This recipe is designed to be a full first meal for a 50-60 pound dog. You can cut it in half or fourths for smaller dogs or double it for larger. You can mix it into regular dog food or serve it alone to add sooo many nutrients into your pet's life! 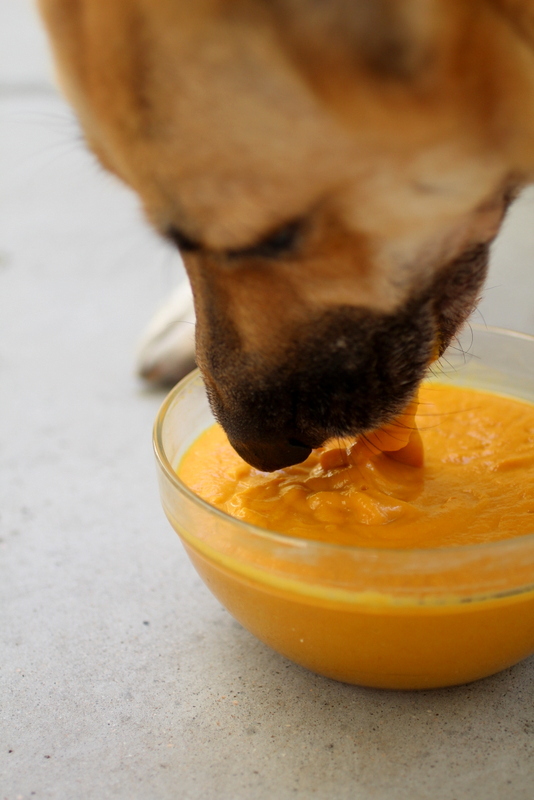 This smoothie contains probiotics, prebiotics, healing bone broth, anti-inflammatory turmeric, and soothing pumpkin which promotes healthy bowels in dogs. 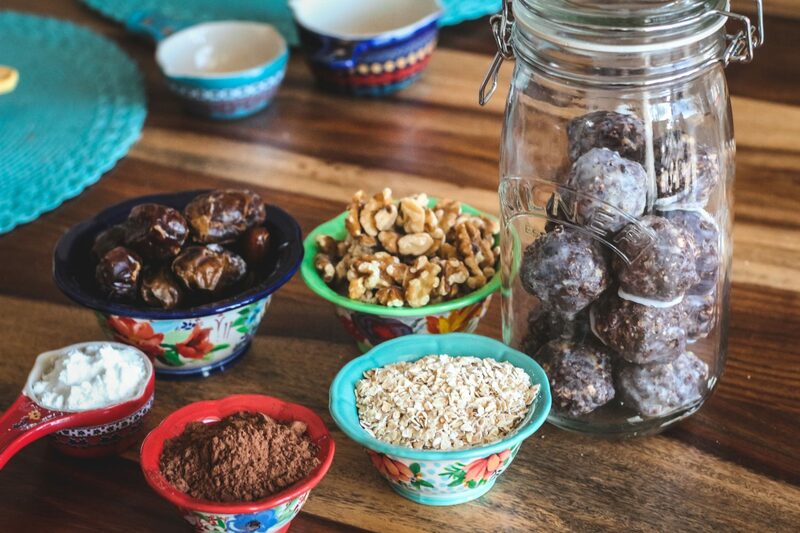 Dates are packed with vitamins and minerals, but one of the most interesting things about dates is the presence of organic sulfur in them. This is a really hard element to find in a food source. Sulfur is incredibly important and is the third most abundant mineral in the body. Sulfur is essential for life and makes up vital amino acids used to create protein for cells, hormones, enzymes, and antibodies. It's necessary for insulin production and sulfur detoxifies at the cellular level. 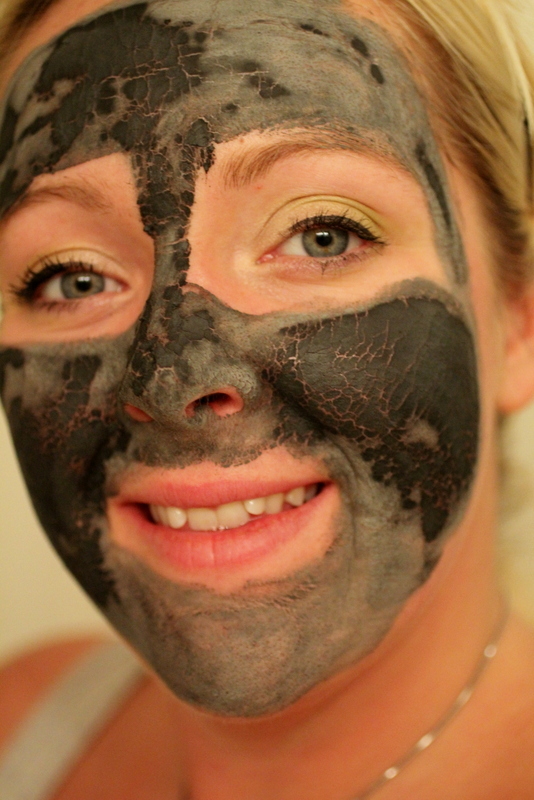 It also relieves pain and makes for beautiful skin and hair. When I was a little girl my dad loved grapefruits so much he bought special grapefruit spoons and knives that has edges to cut the grapefruits with. 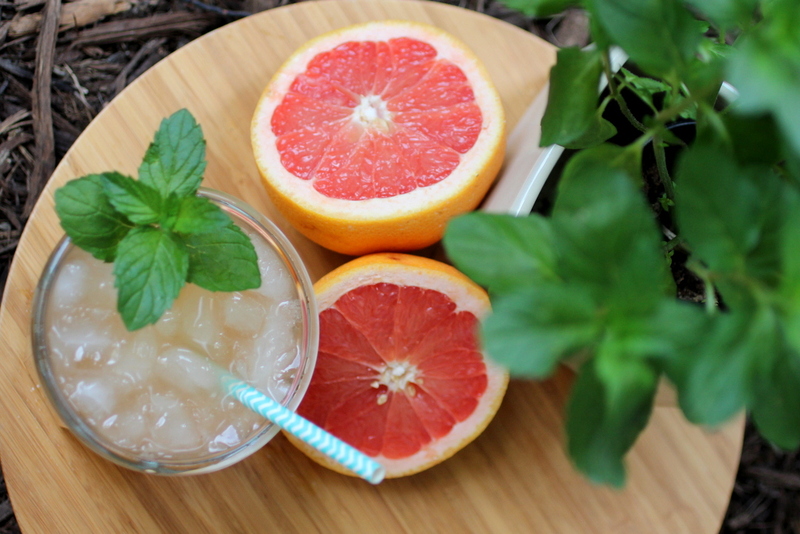 I developed a great love for grapefruits and during the month of April and May I try to have a grapefruit or its juice each day. 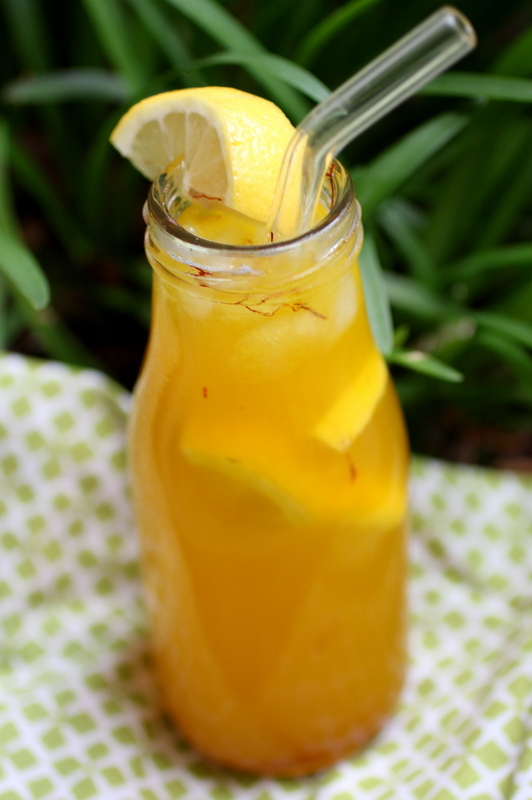 I like to use bottled juice with this recipe because it gives a better, less strong flavor and doesn't cause explosions. 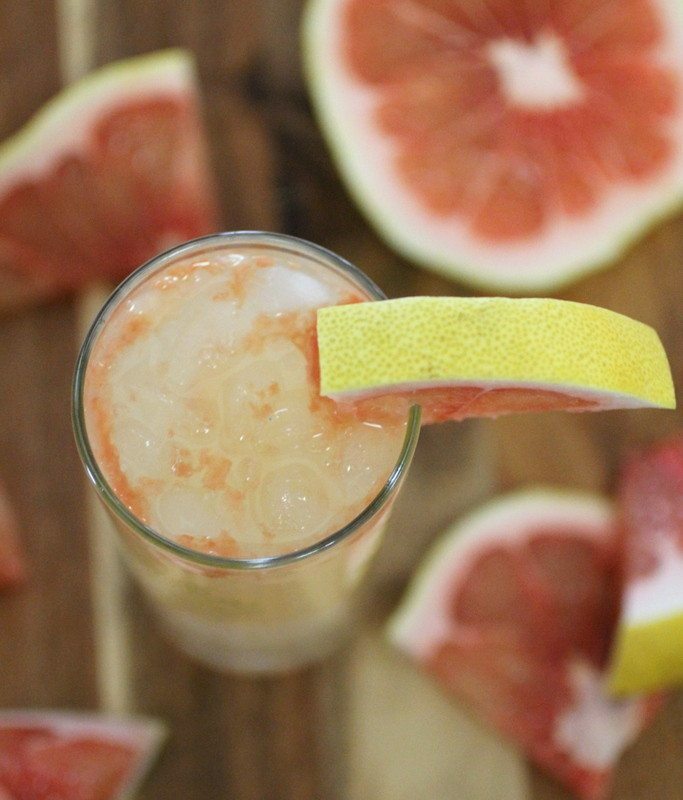 If you do use fresh grapefruit juice, only ferment 2-5 days. 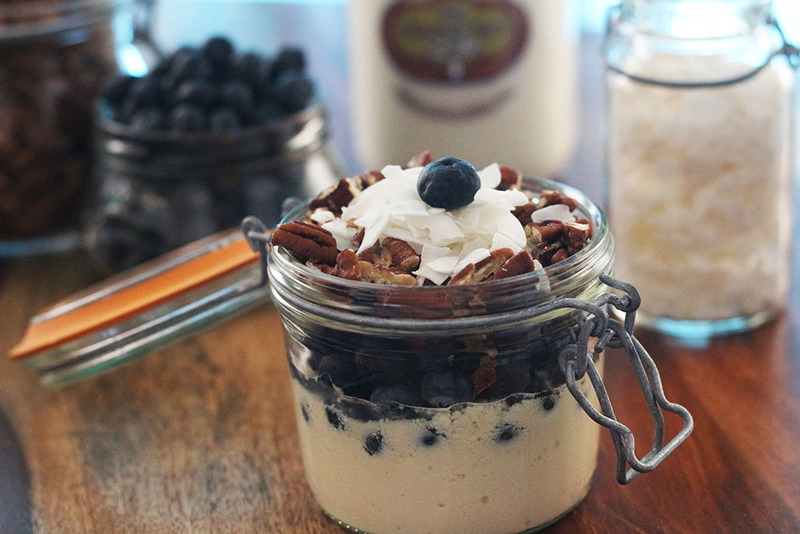 Macadamia nuts and kefir are a match made in heaven. 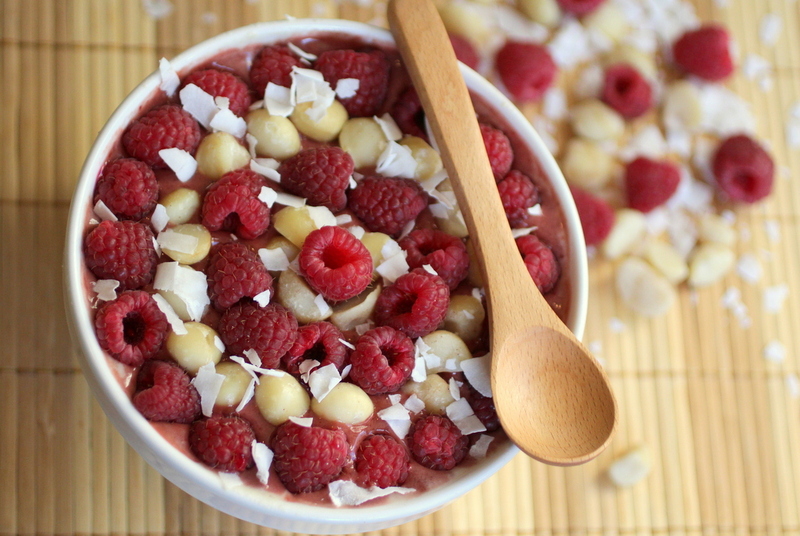 Macadamia nuts are buttery tasting, and combined with kefir you get a yummy smoothie bowl. 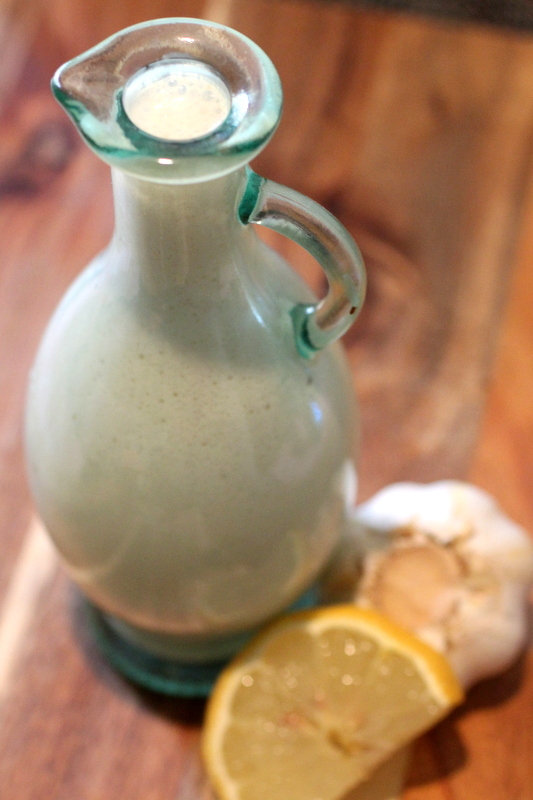 For my Biotic Pro members: Try the Macadamia Nut Kefir instead of regular kefir for an extra creamy taste. 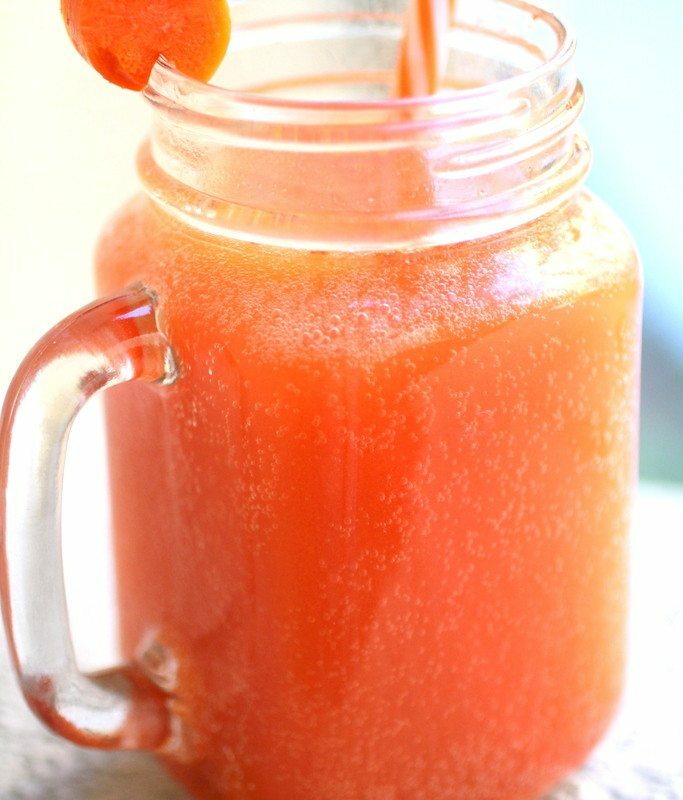 This kombucha is super bubbly and loaded with antioxidants and lots of vitamin A. I think carrots are something special and that we should include them in our diets as much as possible. I love the flavor of fresh carrots. Nothing shouts, "Get back to your roots!" quite like carrots. This has a mild carrot flavor that is so delightful I can't really describe it. Just trust me you will love it!